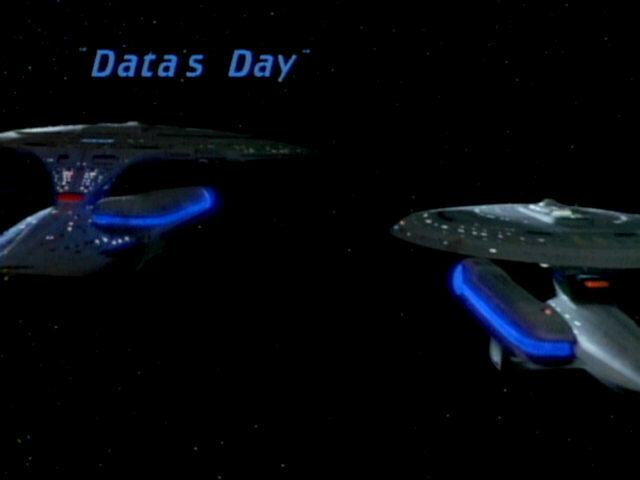 Ex Astris Scientia - Observations in TNG: "Data's Day"
Observations in TNG: "Data's Day"
Here are some observations about sets, props and visual effects in TNG: "Data's Day" without a specific theme, and a comparison of the original TV release (TNG) with the remastered episode (TNG-R). 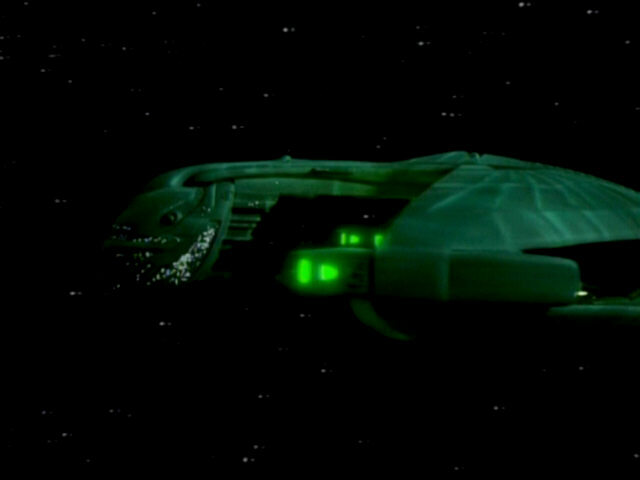 The bridge is darkly lit during the night shift. 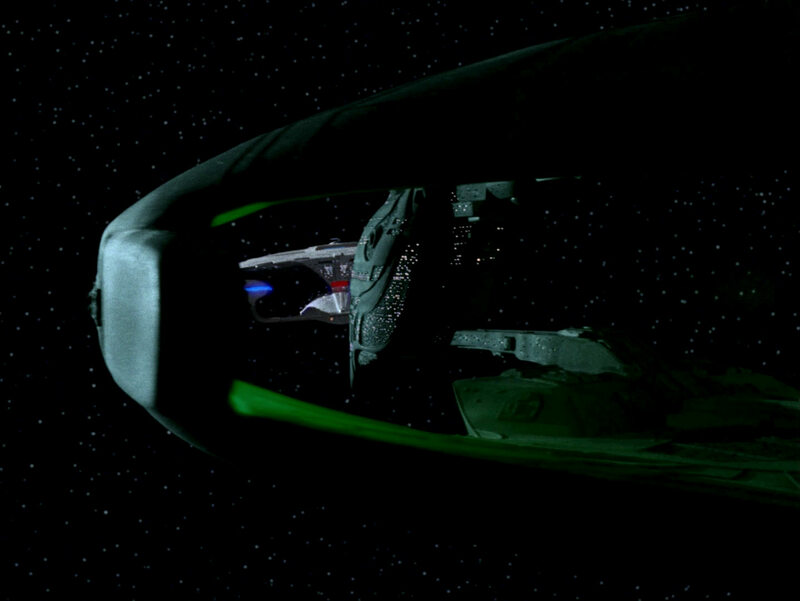 The dark bridge in HD. 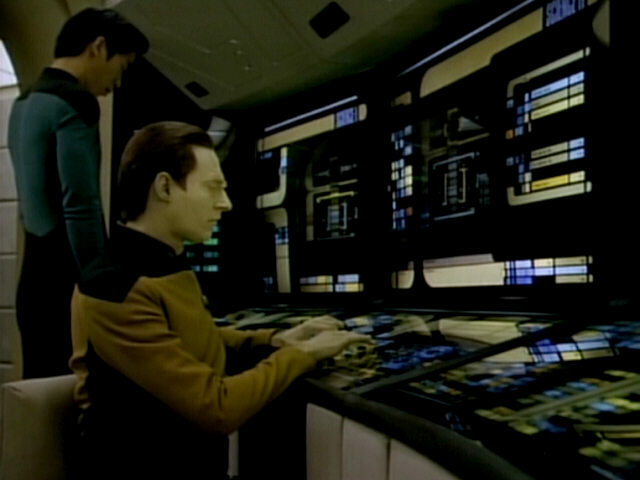 The bridge lighting is adjusted as the day shift begins. 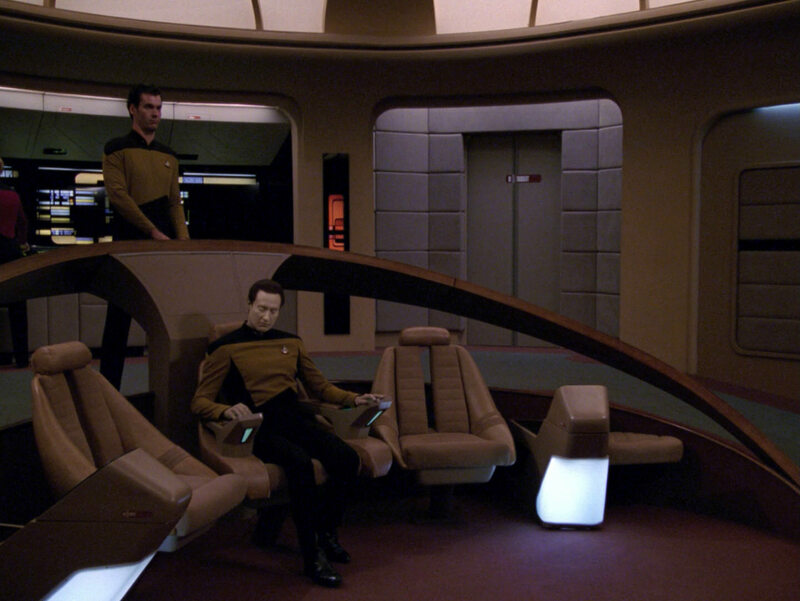 The changing light level was achieved in post production, similar to the fog on the bridge in "Evolution". 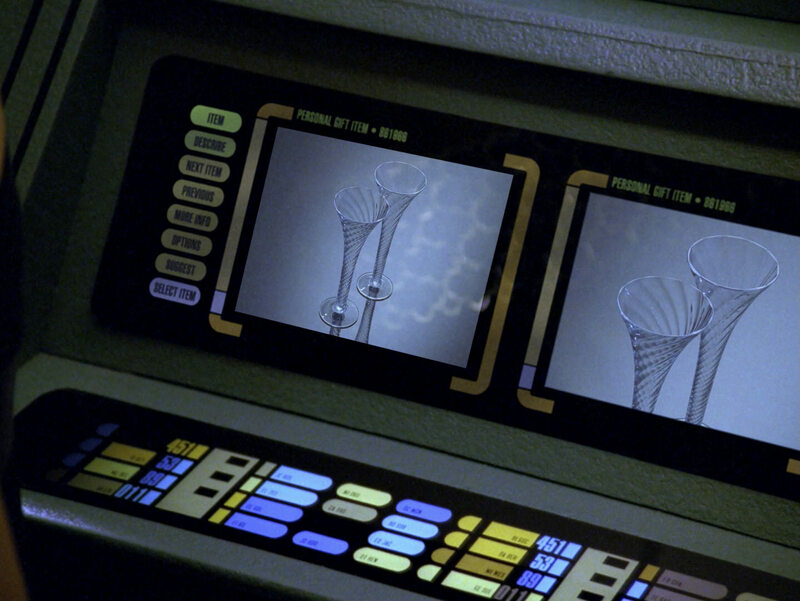 "Evolution" The transition in TNG-R. Both Keiko O'Brien and the O'Briens' quarters appear for the first time in this episode. 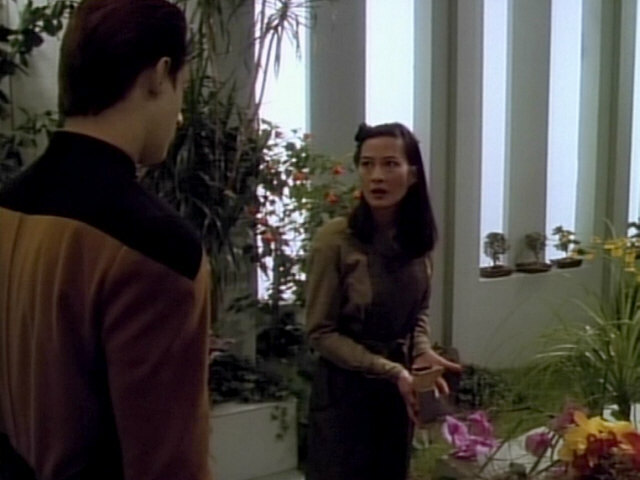 Two pieces of set decoration in the quarters have appeared before. 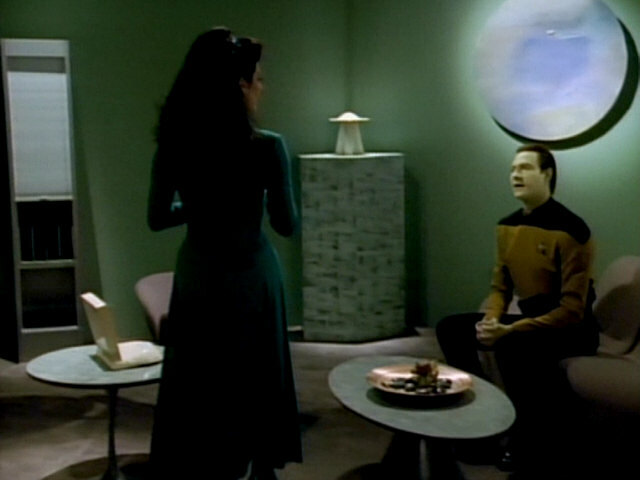 The black and blue vase in the background was originally part of Kivas Fajo's collection in "The Most Toys" but also appeared in several Enterprise-D crew members' quarters. 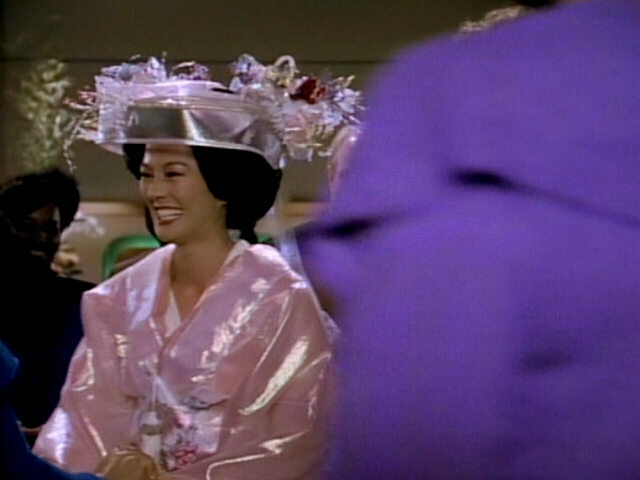 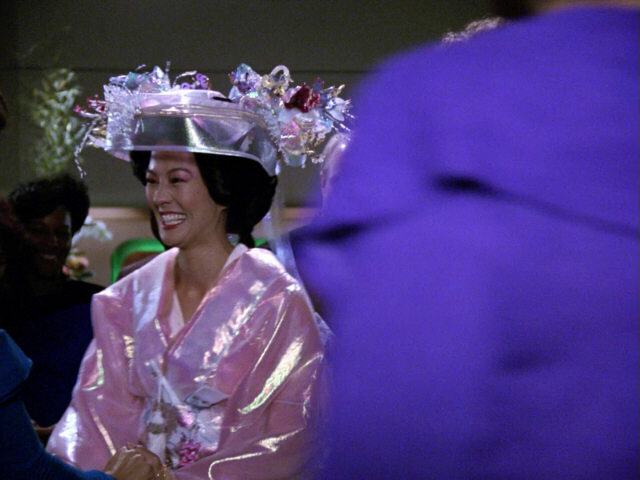 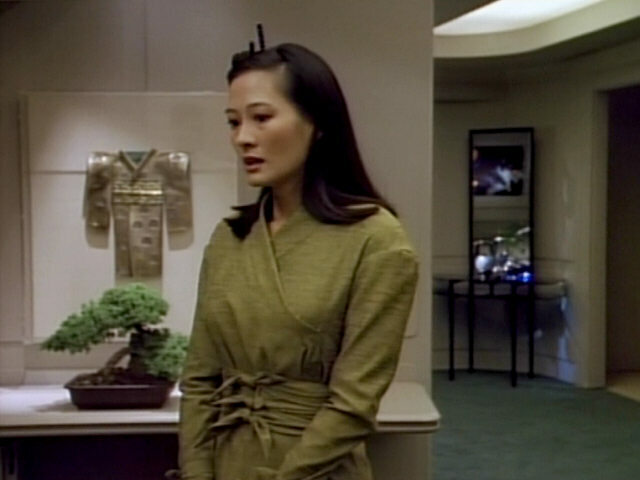 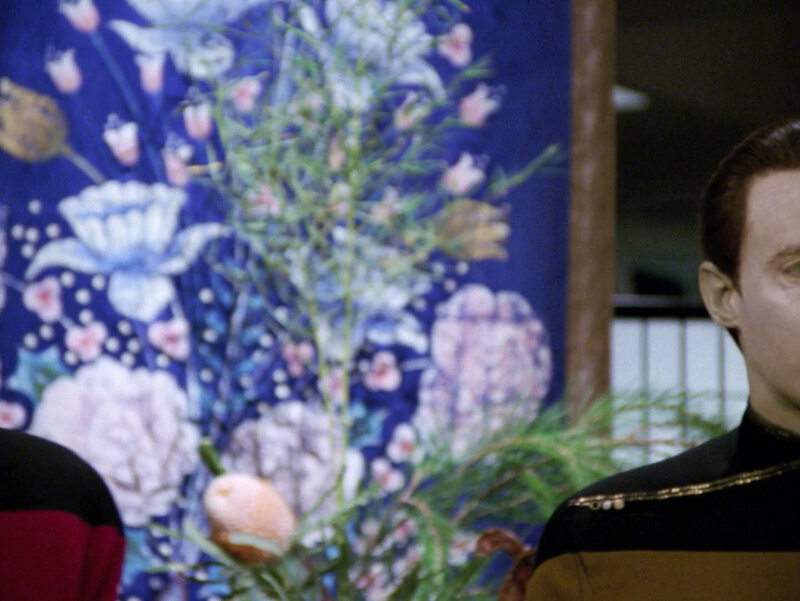 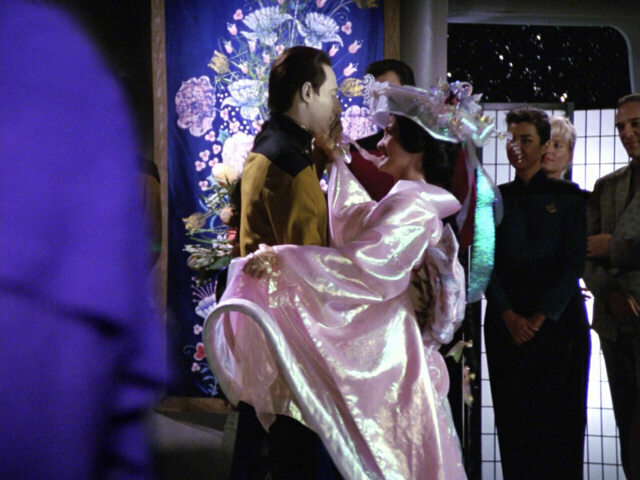 The framed kimono to the left of Keiko was earlier seen in Dr. Noonien Soong's lab in "Brothers". 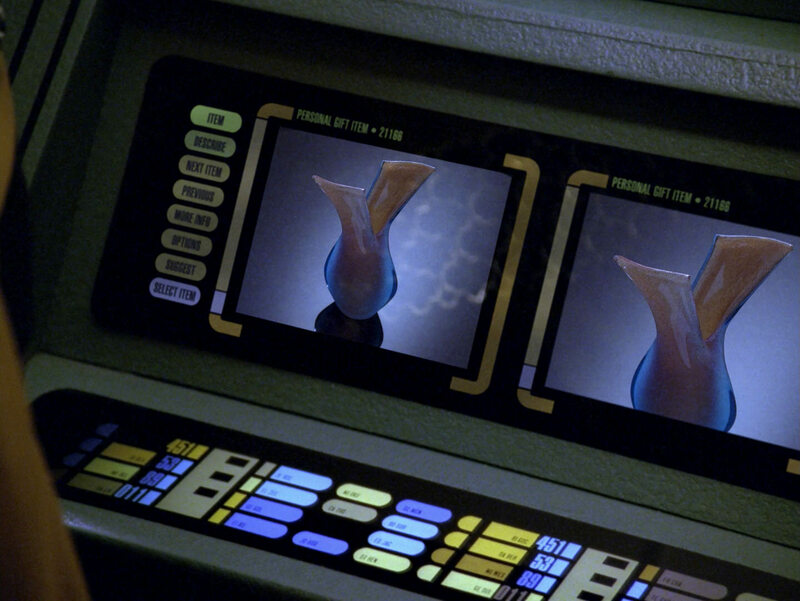 "The Most Toys" HD close-ups of the vase and the costume. 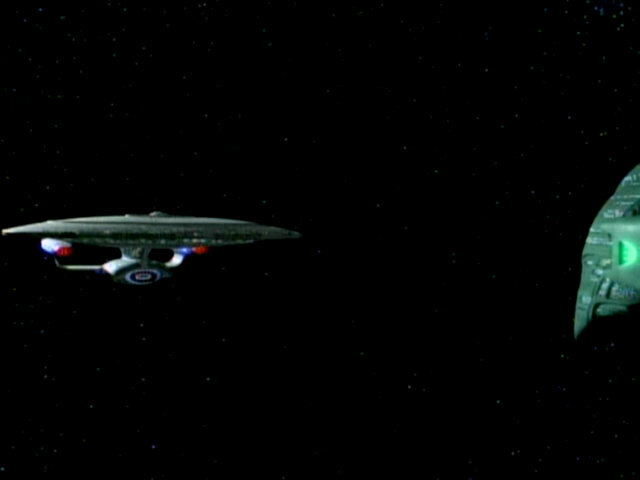 The USS Enterprise-D and the USS Zhukov slowly fly away from the camera. 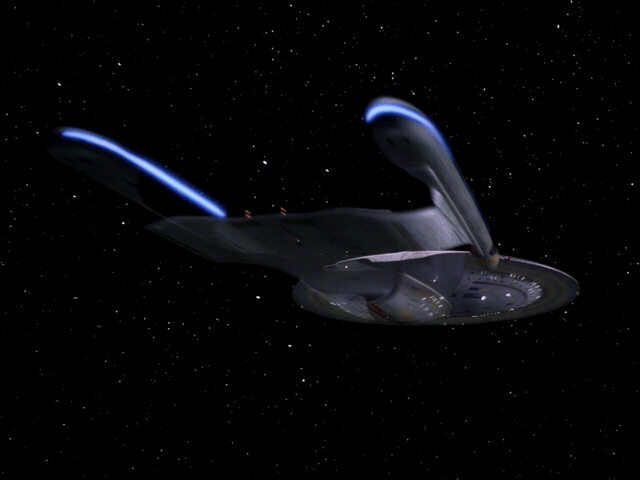 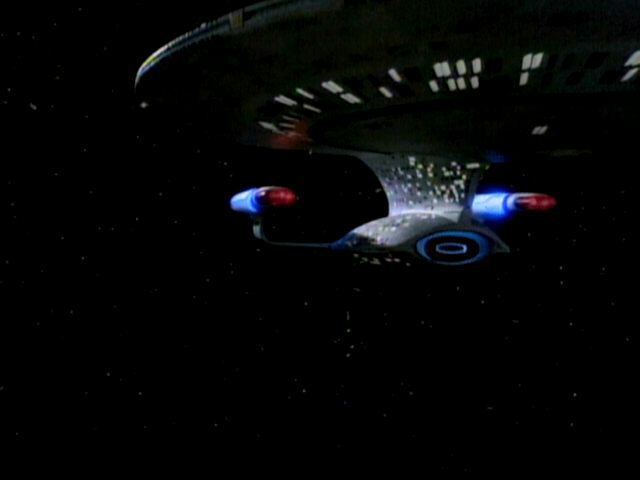 This is the second appearance of an Ambassador class vessel after the USS Enterprise-C was seen in "Yesterday's Enterprise". 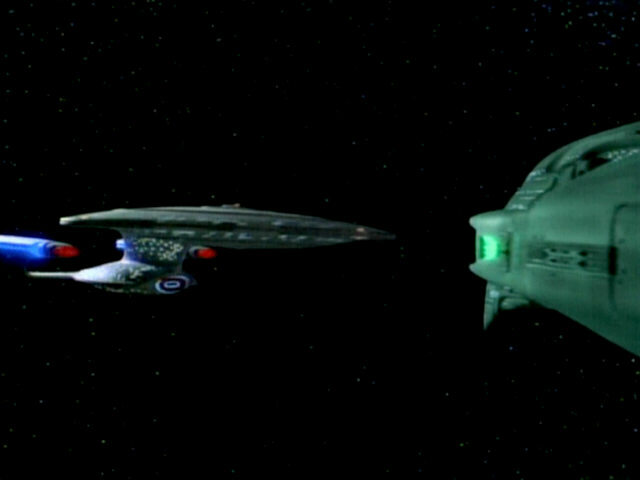 Both the footage of the Zhukov and the Enterprise-D was newly filmed for this episode. 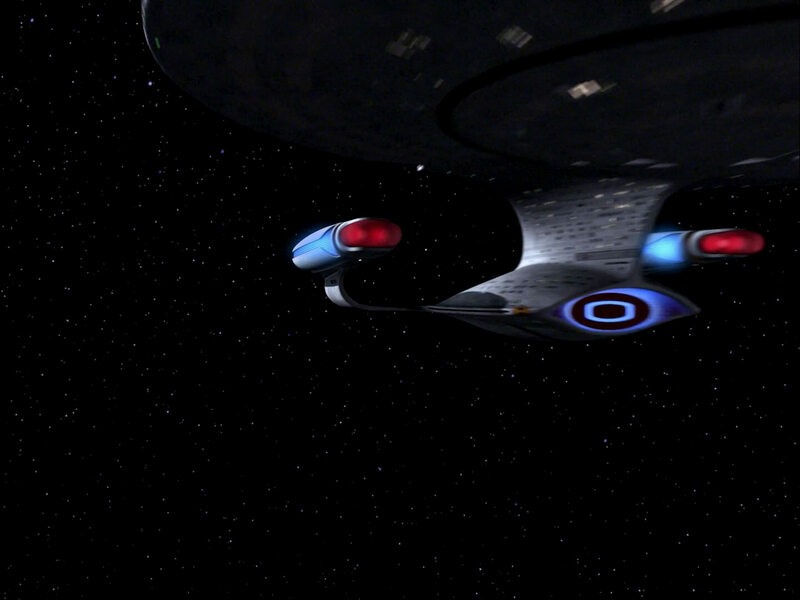 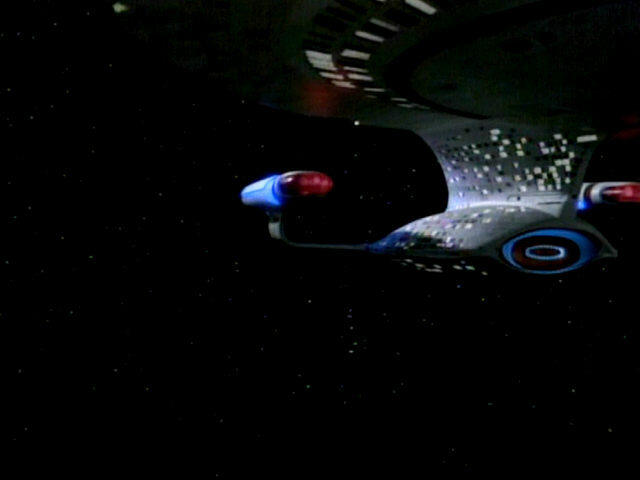 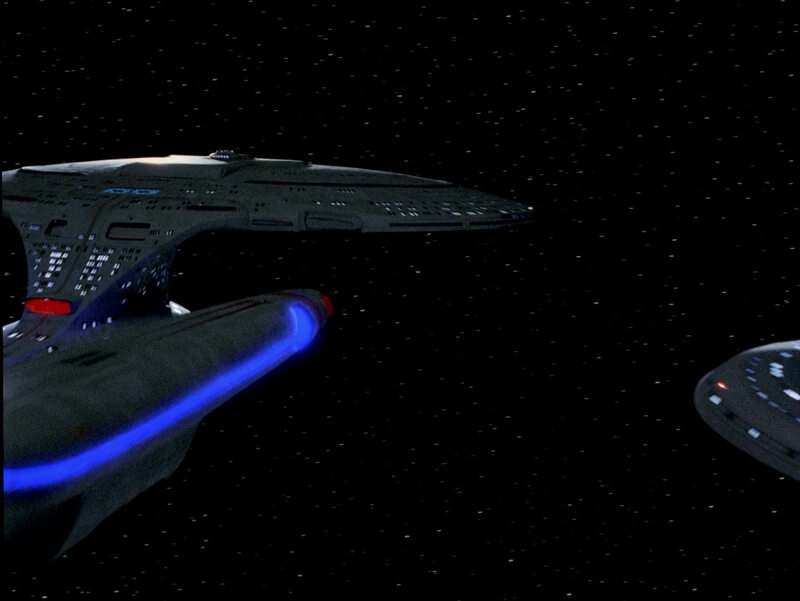 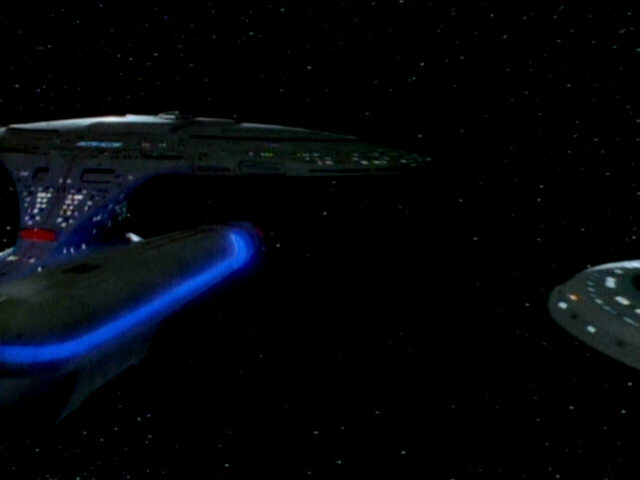 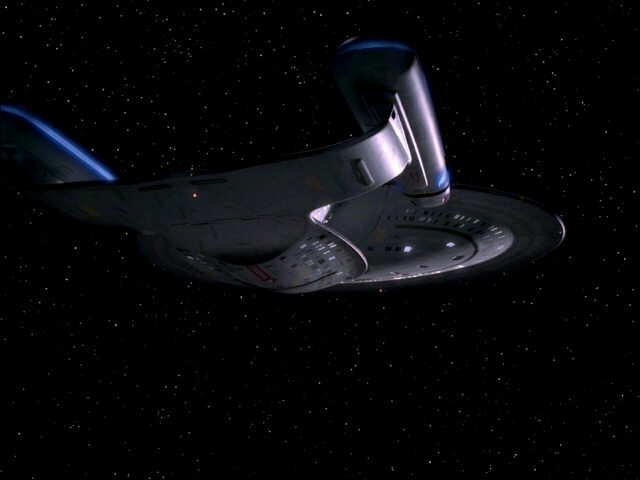 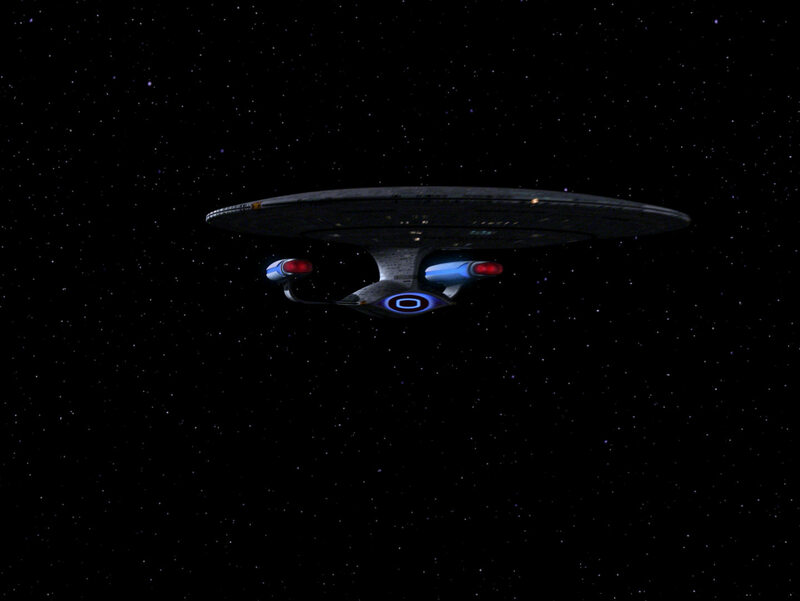 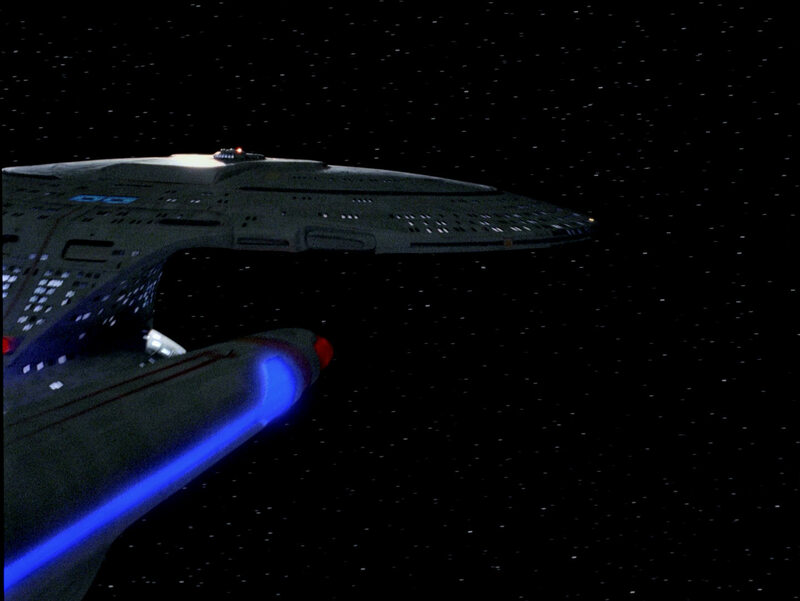 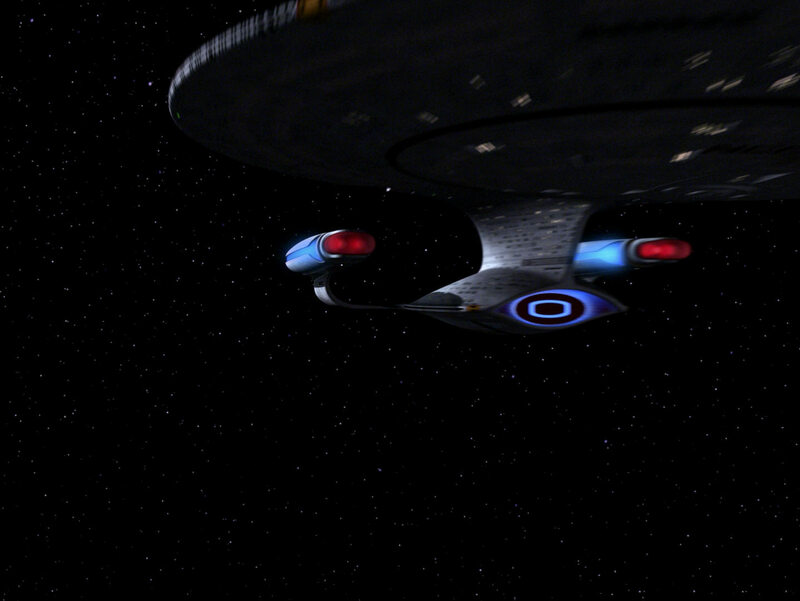 The comparison shot of the USS Enterprise-C shows that all the battle scarring was removed for this episode, among other modifications. 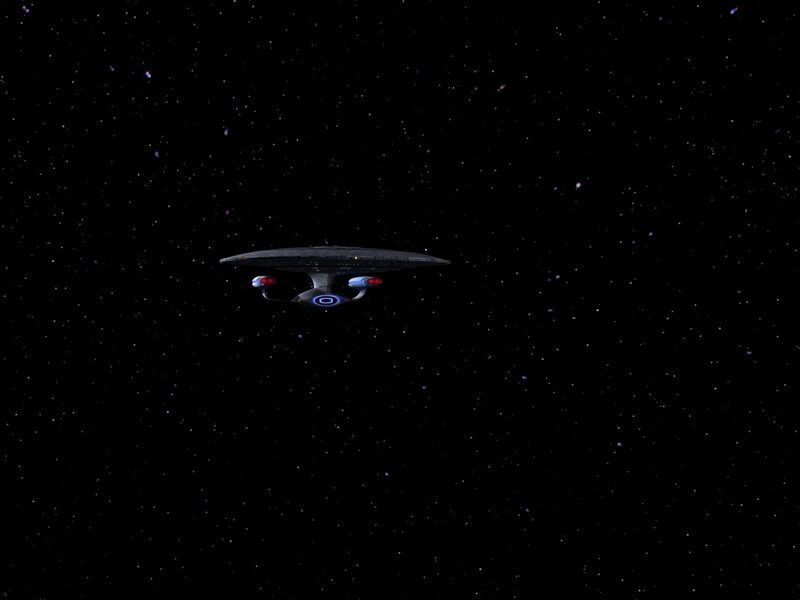 Enterprise" The ships are a bit noisy in HD, and the shot is not properly framed, leaving a black border on the left. 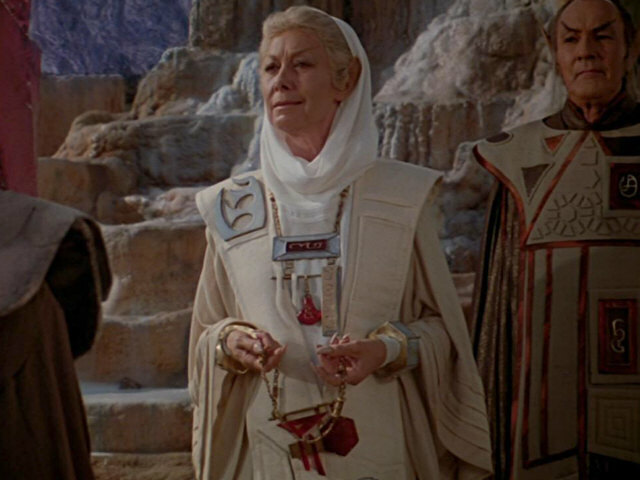 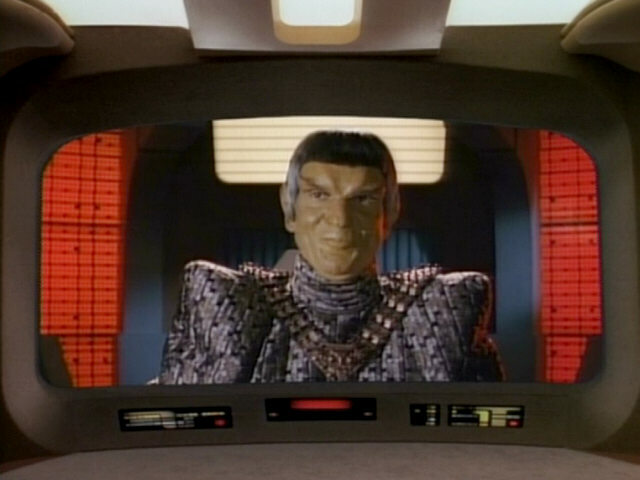 Ambassador T'Pel's Vulcan necklace was originally worn by the Kolinahr master in "Star Trek: The Motion Picture". 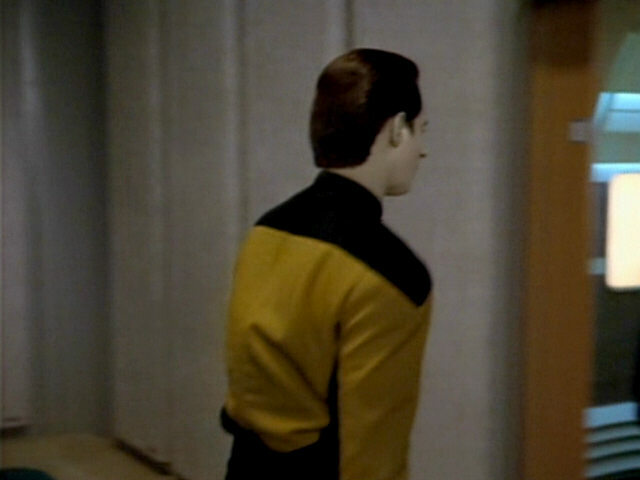 "Star Trek I" A good look at the Vulcan attire in HD. 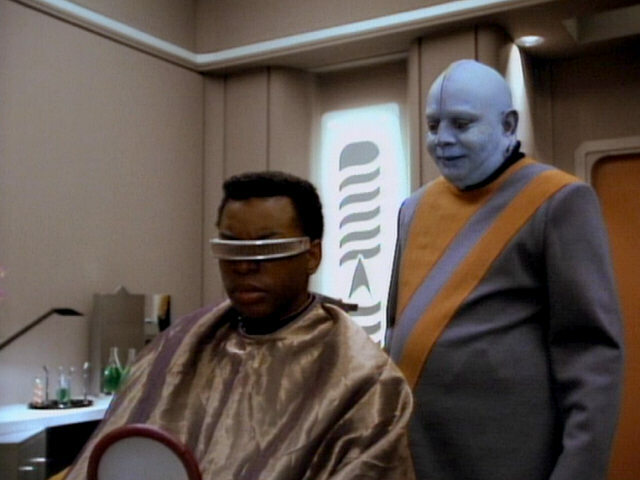 The barbershop (and its Bolian barber) appears for the first time in this episode. 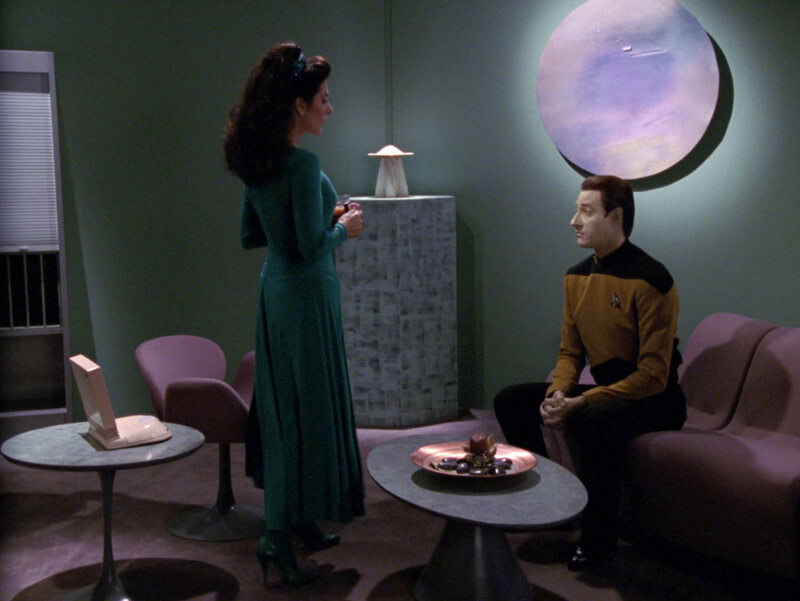 The set is either a redress of Counselor Troi's office (last seen in "The Loss") or was built using the same general layout. 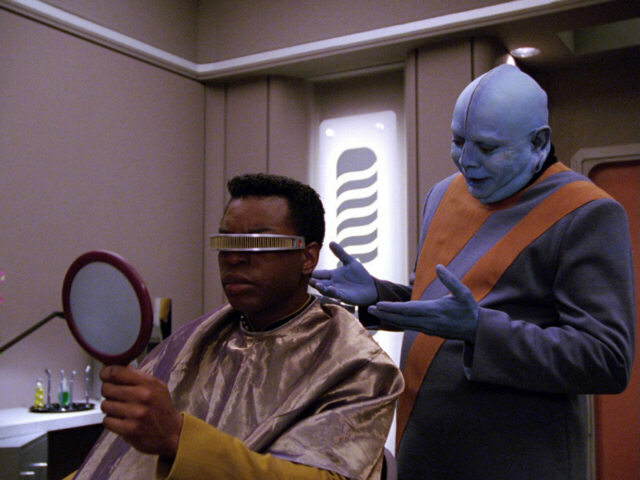 "The Loss" The barbershop in HD. 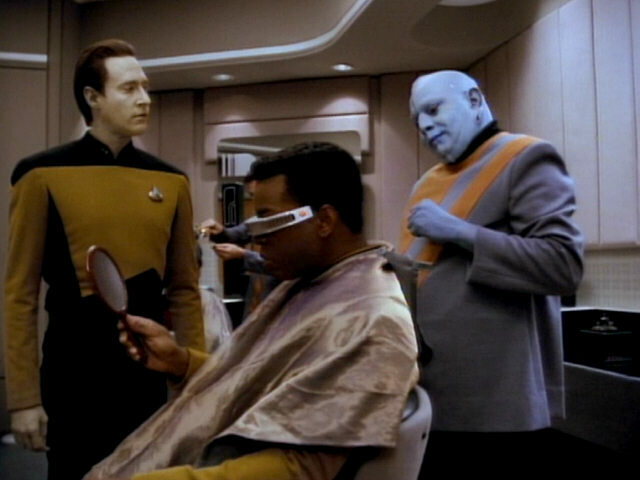 An alien Starfleet officer has her hair dyed in the barbershop. 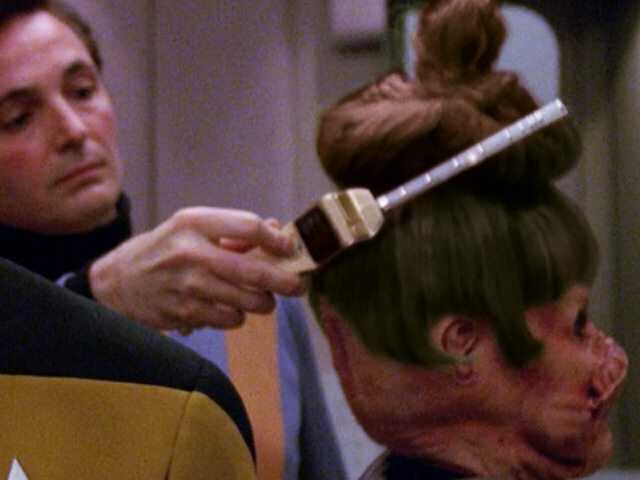 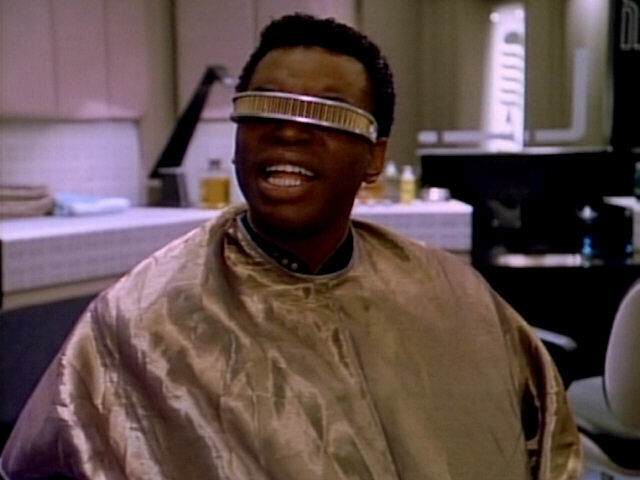 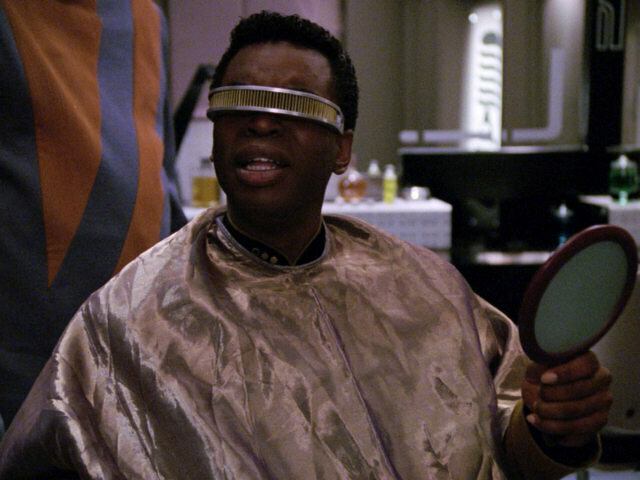 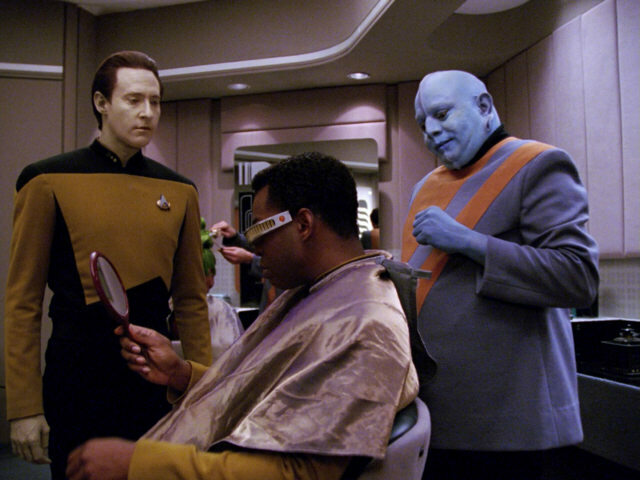 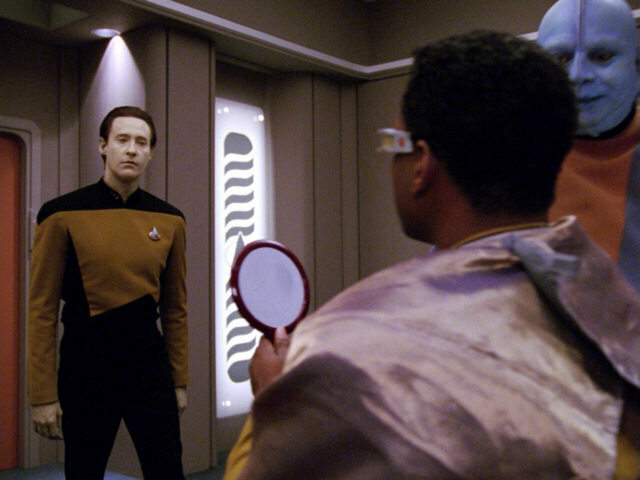 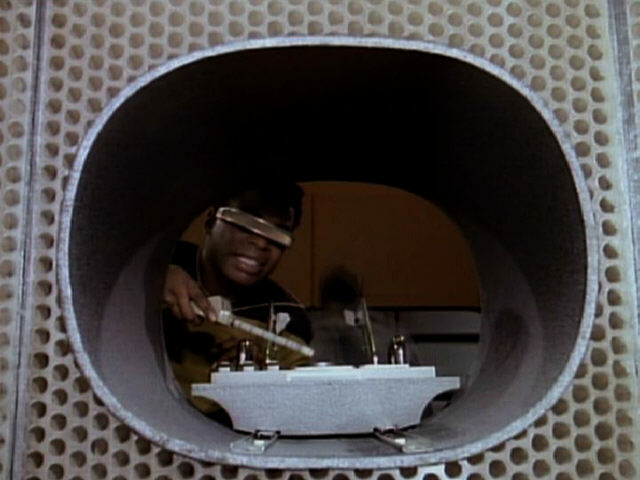 The tool the barber uses to color her hair was originally an engineering scanner used by Geordi in several episodes. 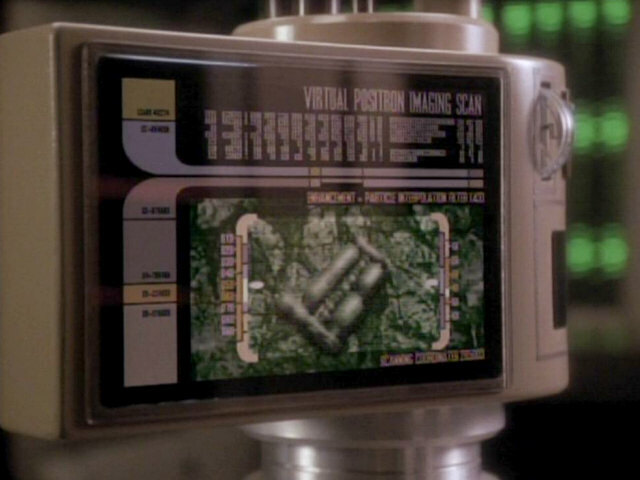 Performance" An HD close-up of the device. 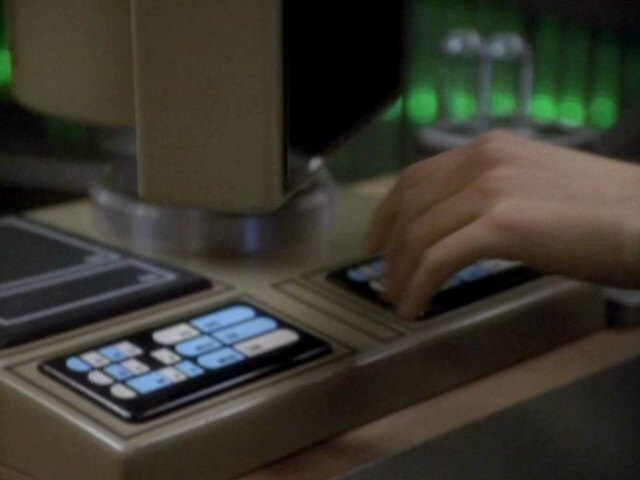 An image of the plush bunny appears on the console while the toy is being replicated. 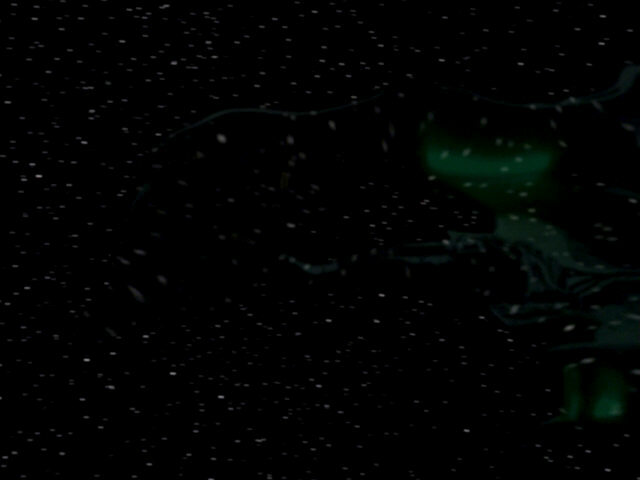 The plush bunny and its depiction in HD. 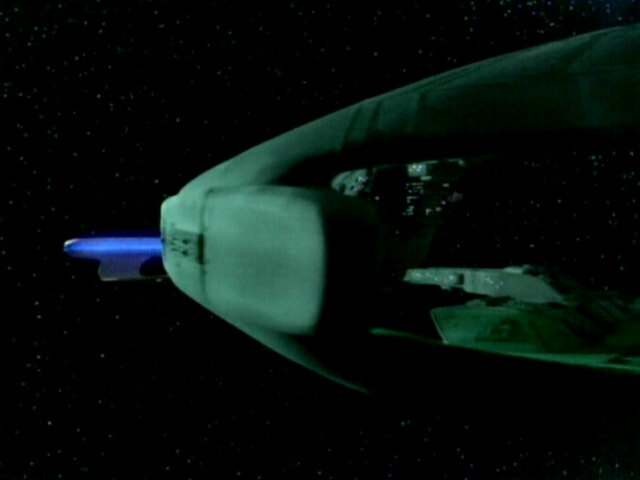 The replicating center is a redress of the USS Enterprise-D battle bridge, last seen in "The Best of Both Worlds II". 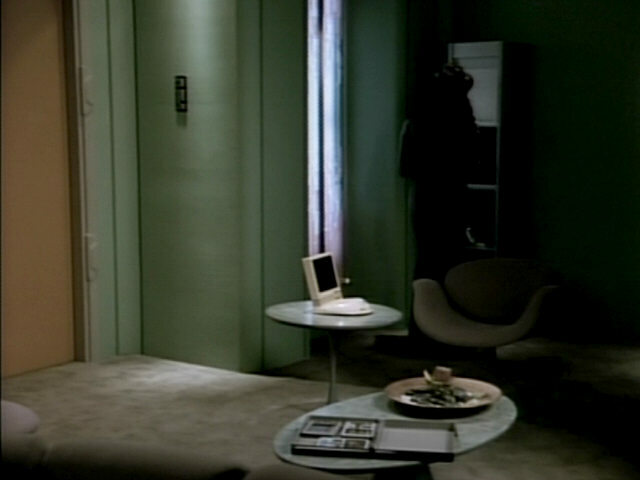 Comparison shots of the cybernetics lab, another redress of the set from "The Offspring", show the similar wall panels. 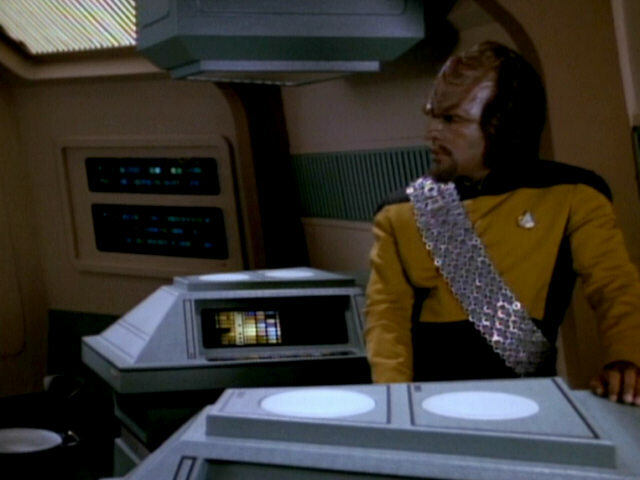 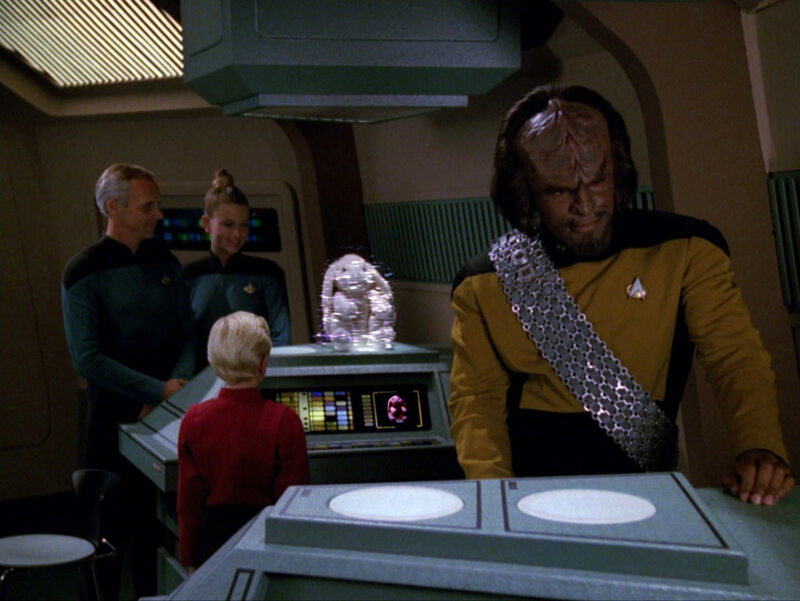 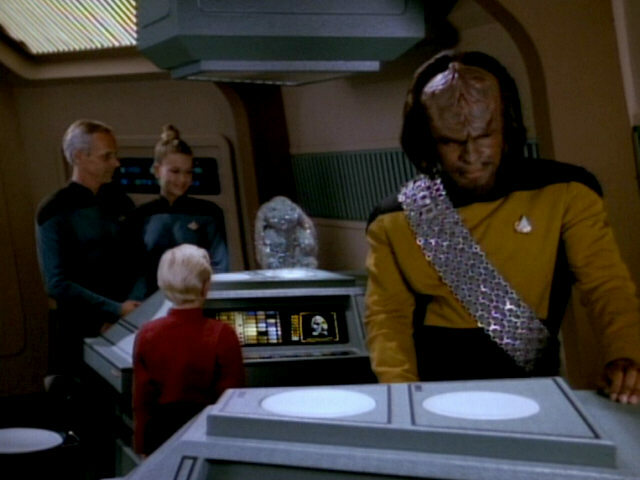 A number of gifts that Worf and Data can choose from are displayed on the replicator console. 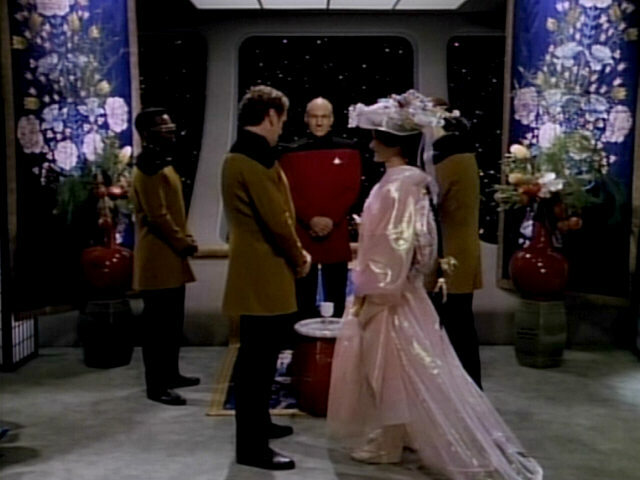 Notice the kitschy third gift, showing a bride and groom in what looks like a moving flying saucer. 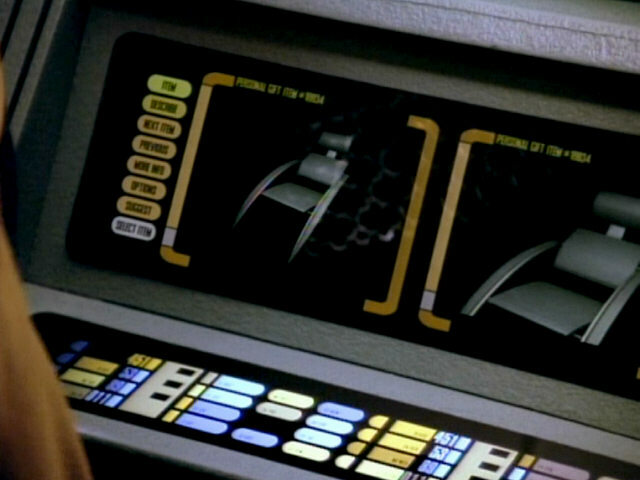 While the LCARS labels are the originally filmed ones, the pictures were newly inserted into the scene for the HD version. 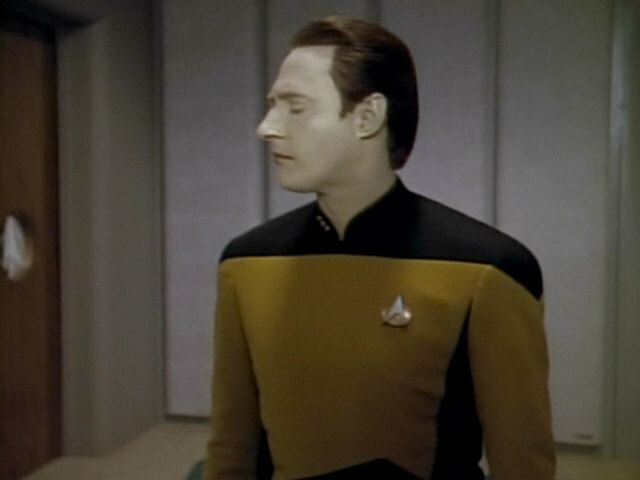 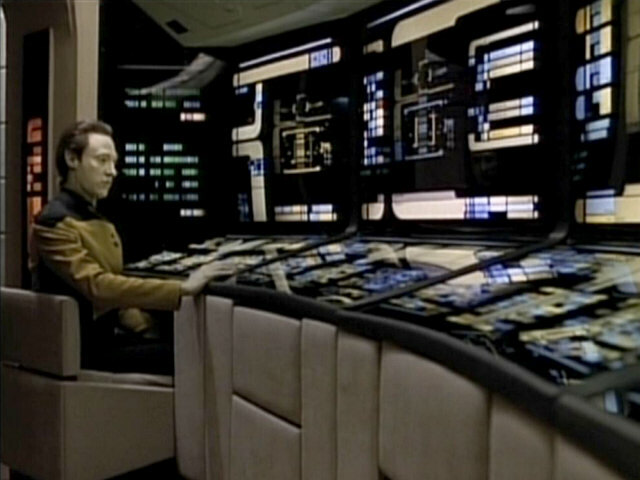 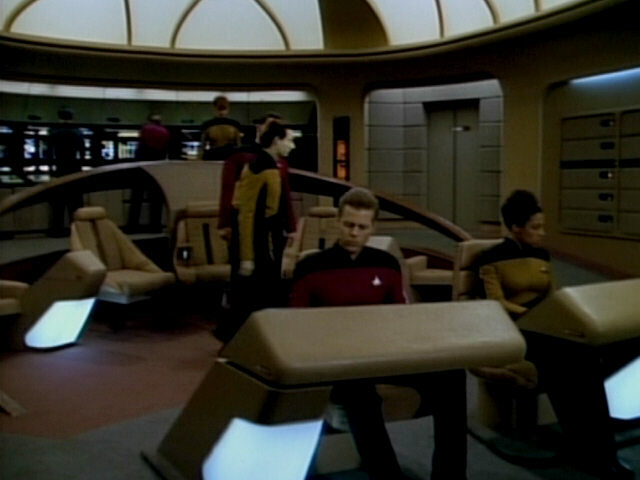 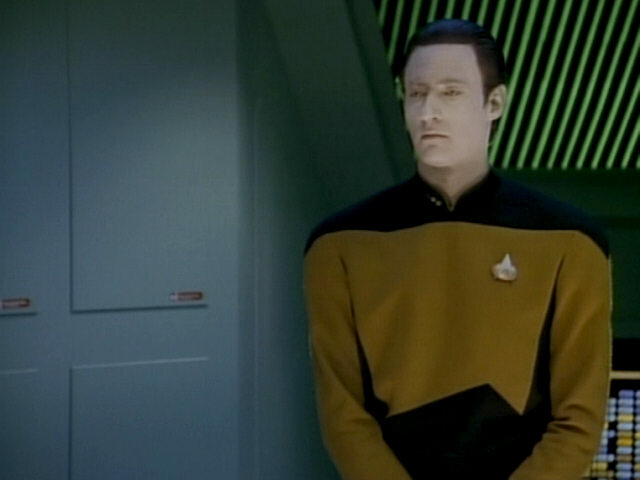 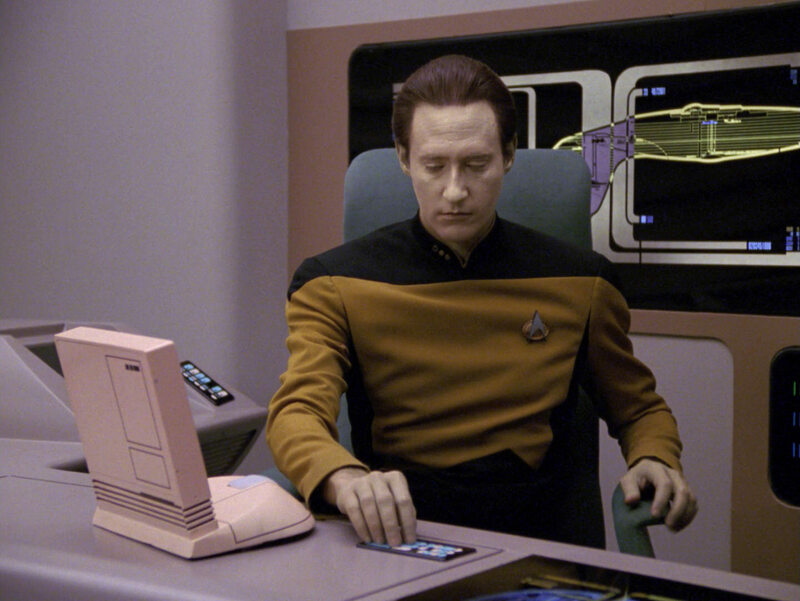 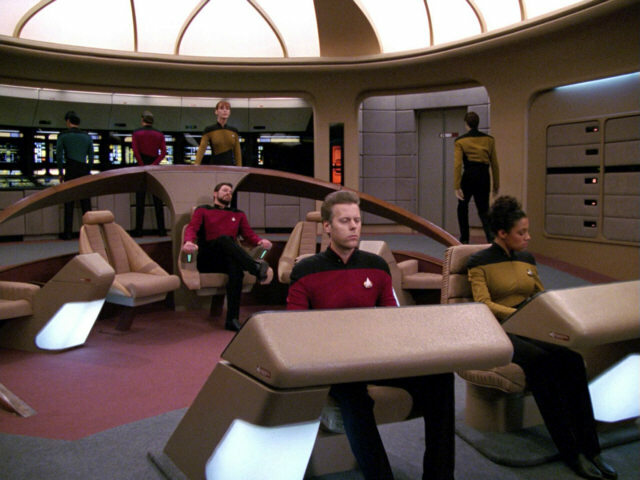 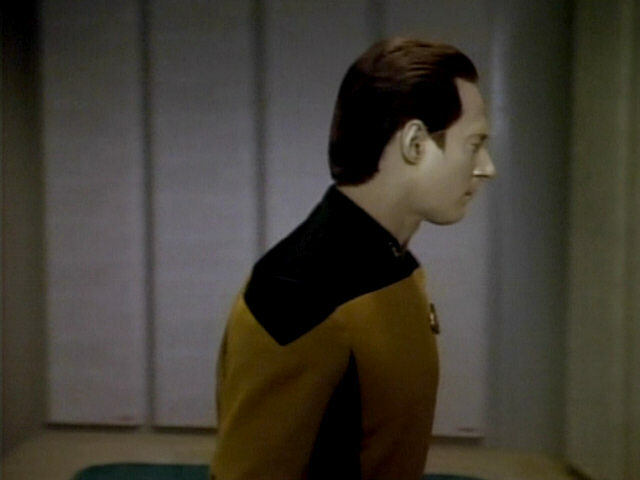 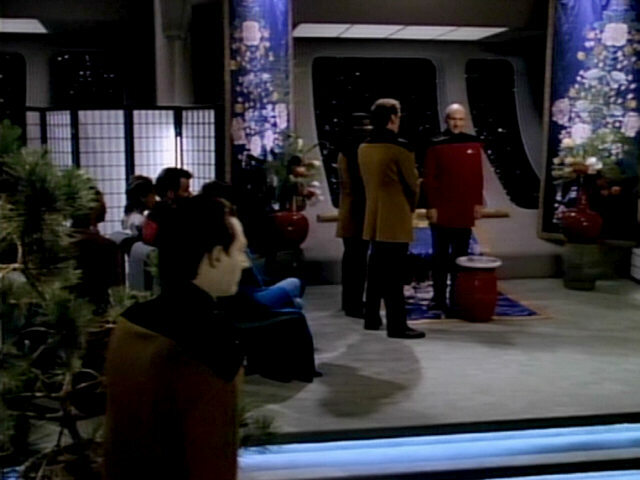 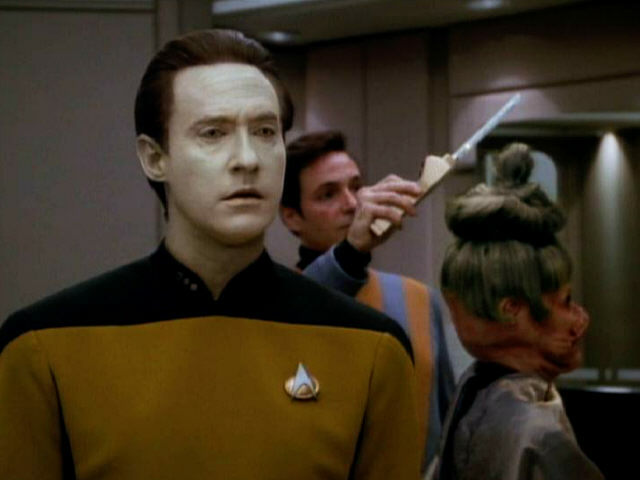 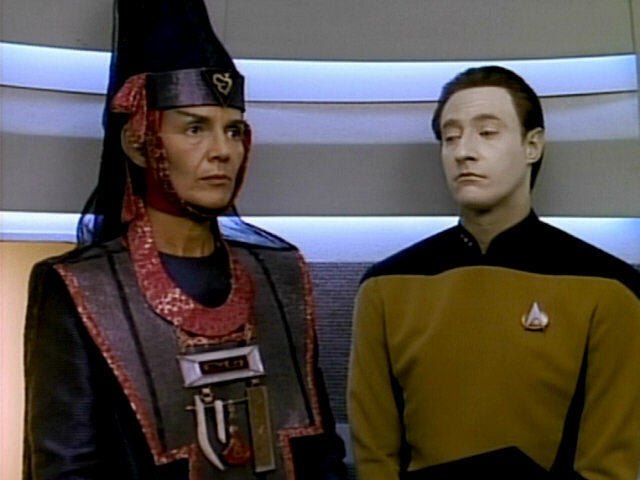 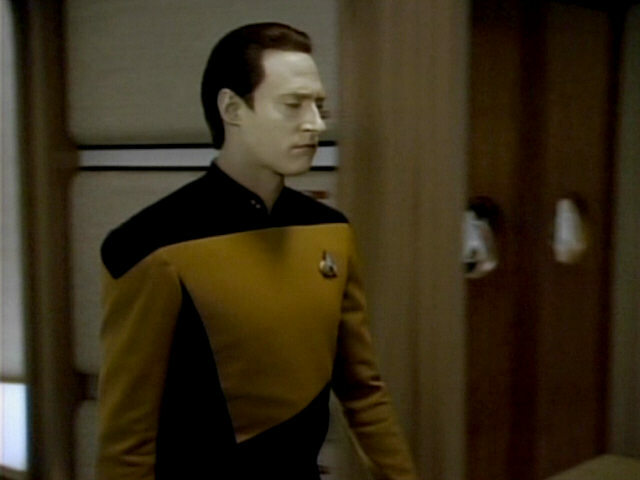 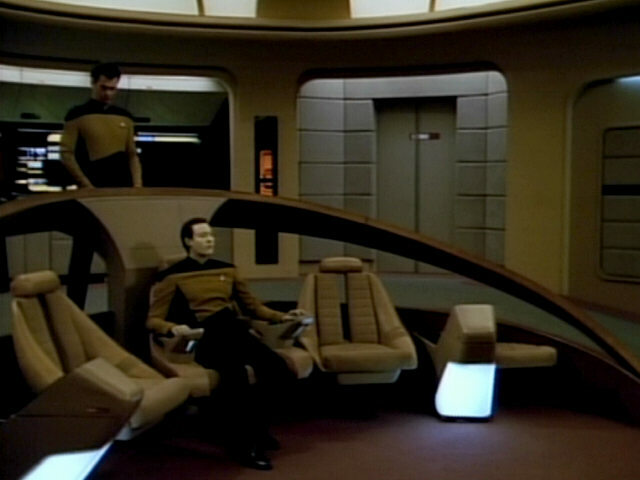 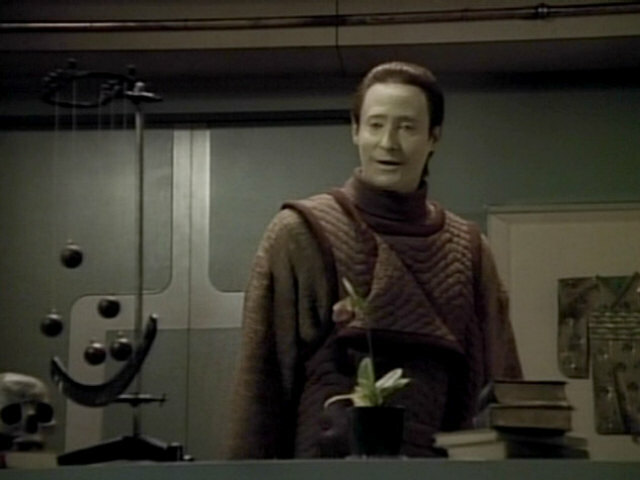 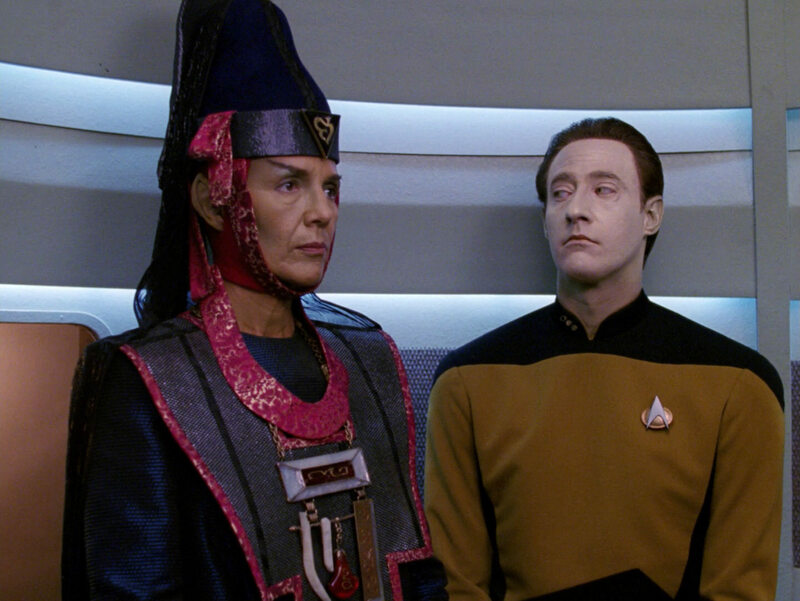 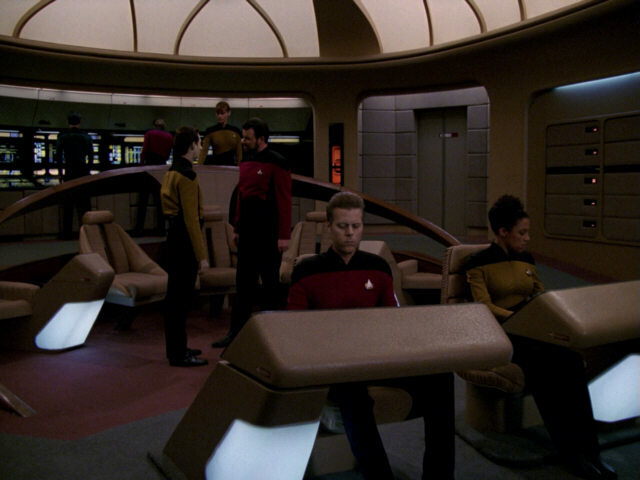 A similar shot of Data sitting at an aft bridge station appears in "Brothers". As can be seen, the LCARS display has not changed since then. 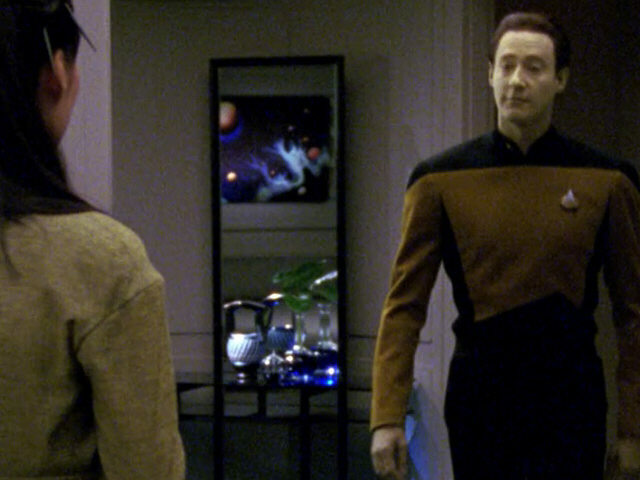 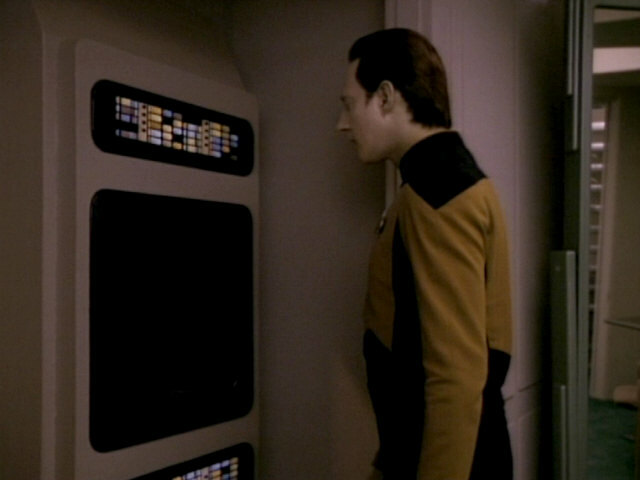 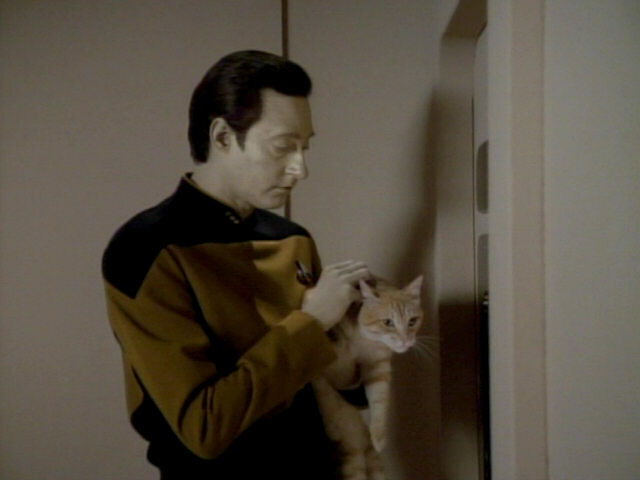 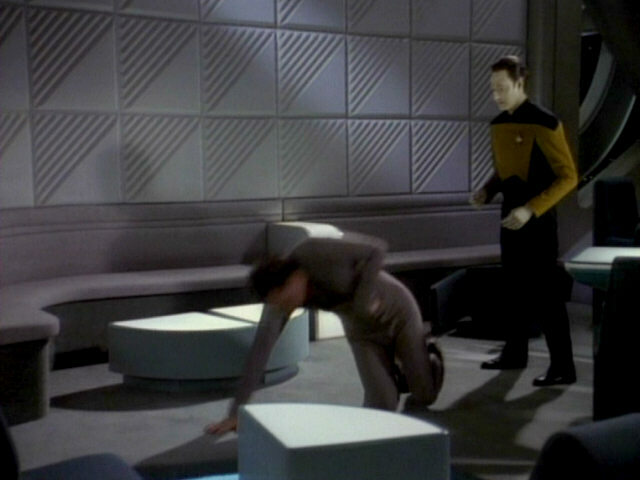 The replicator was added to Data's quarters for this episode, as he needs to replicate cat food for Spot. 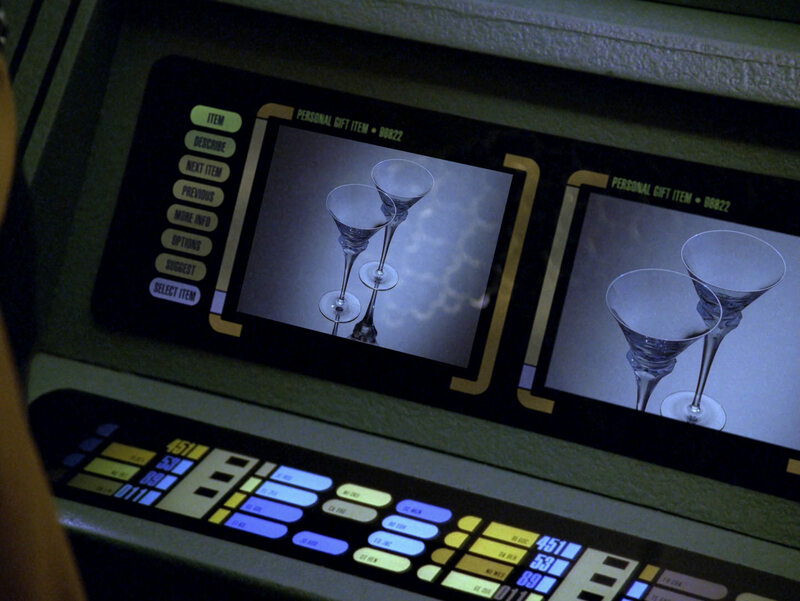 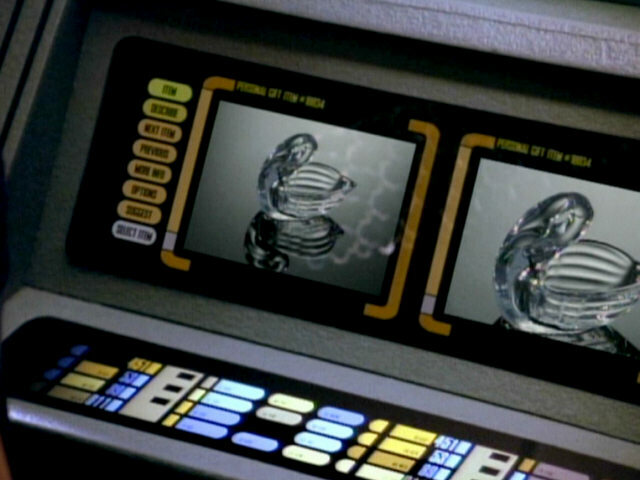 The replicator wasn't present in earlier episodes, as can be seen on the screenshot from "The Offspring". 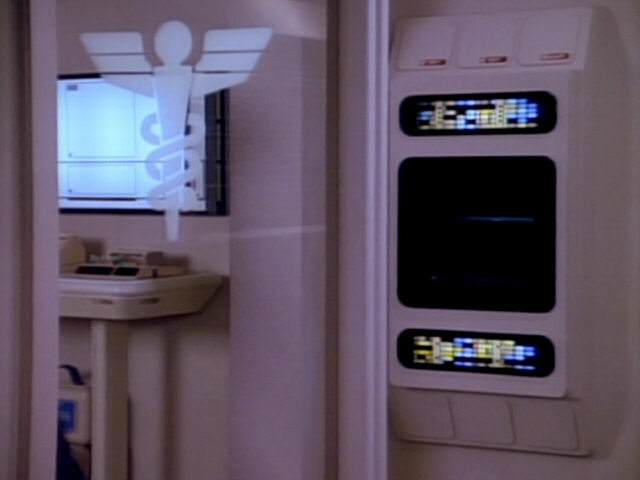 It is similar in design to the sickbay replicator, seen later in the episode, features a different LCARS display and some small differences, however. 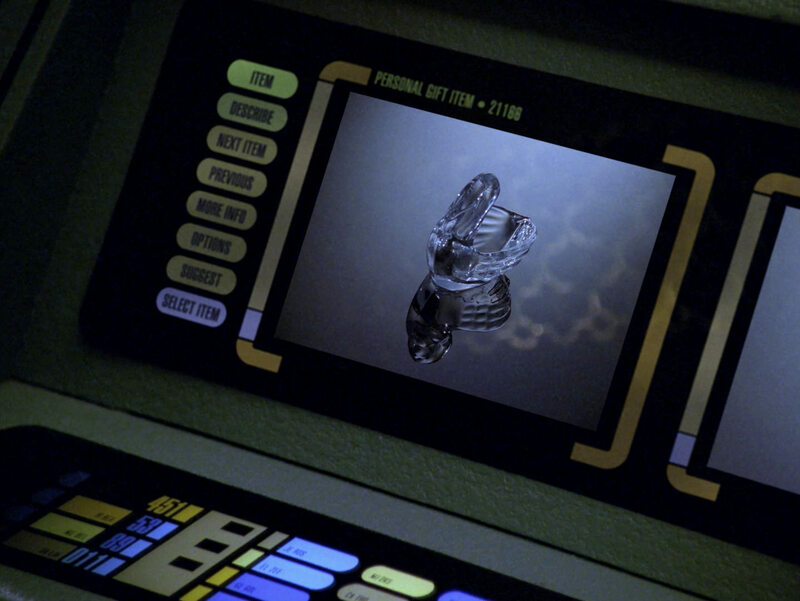 So this is a new replicator and not a re-use of the sickbay set piece. 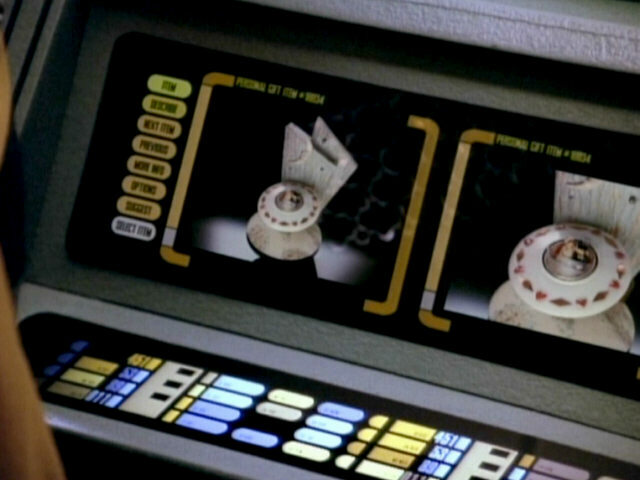 Spot appears for the first time in this episode. 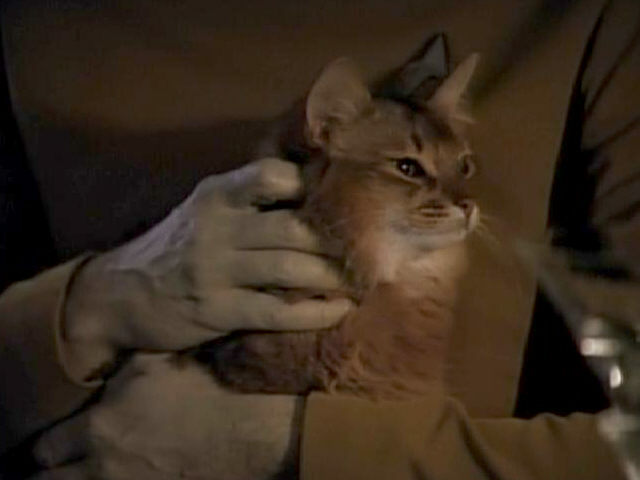 The cat is seen once more this season, in "In Theory", and is played by the same long-haired Somali cat in both episodes. 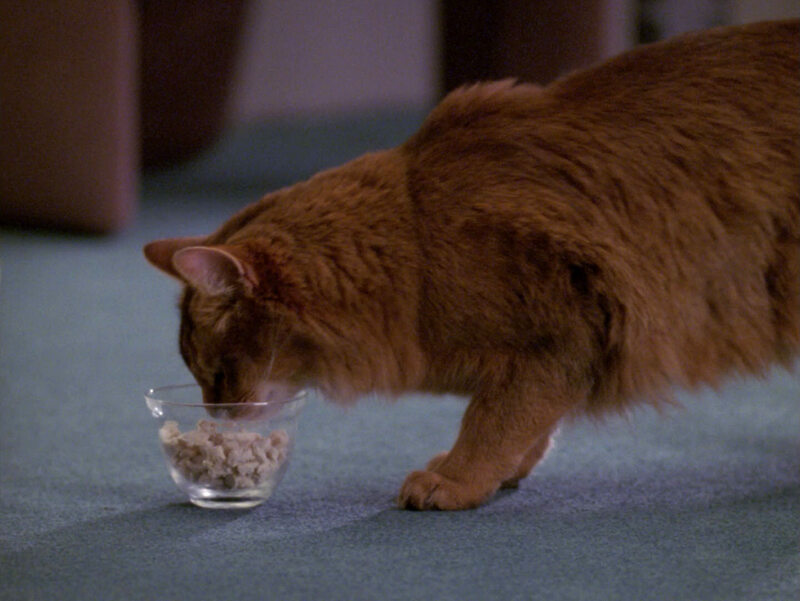 When the cat is seen again in season 6, it has changed appearance is now played by a short-haired orange tabby. 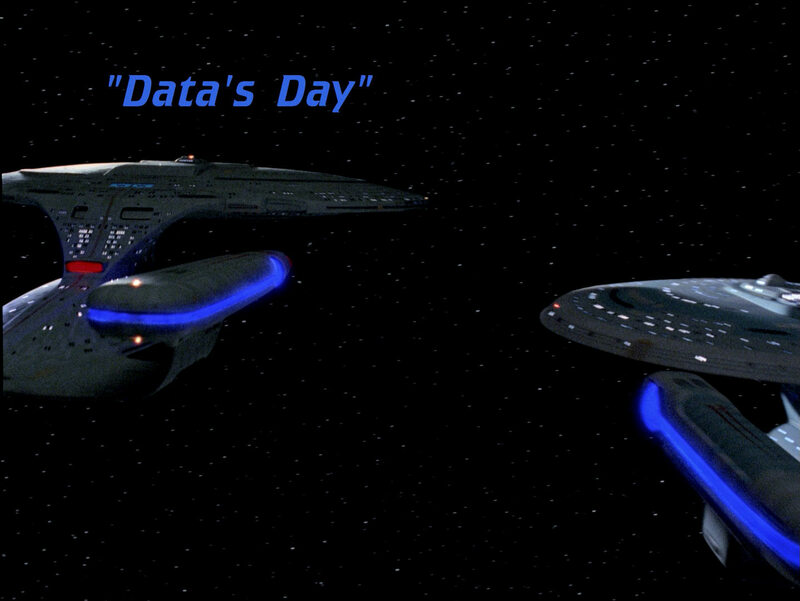 of Datas" Spot in HD. 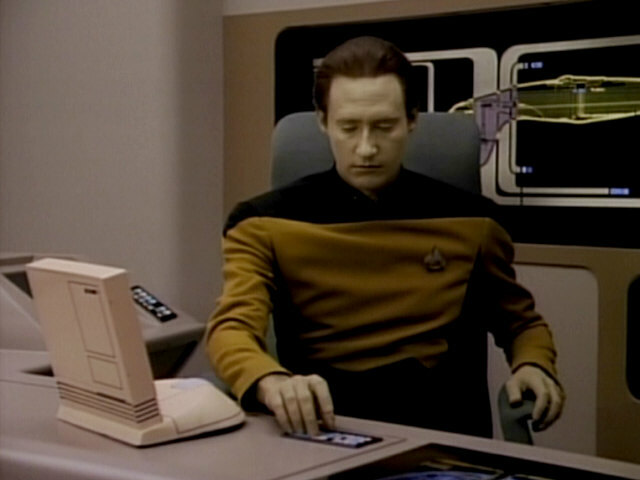 The comparison shot from "The Most Toys" shows that the office part of Data's quarters has not changed since that season 3 appearance. 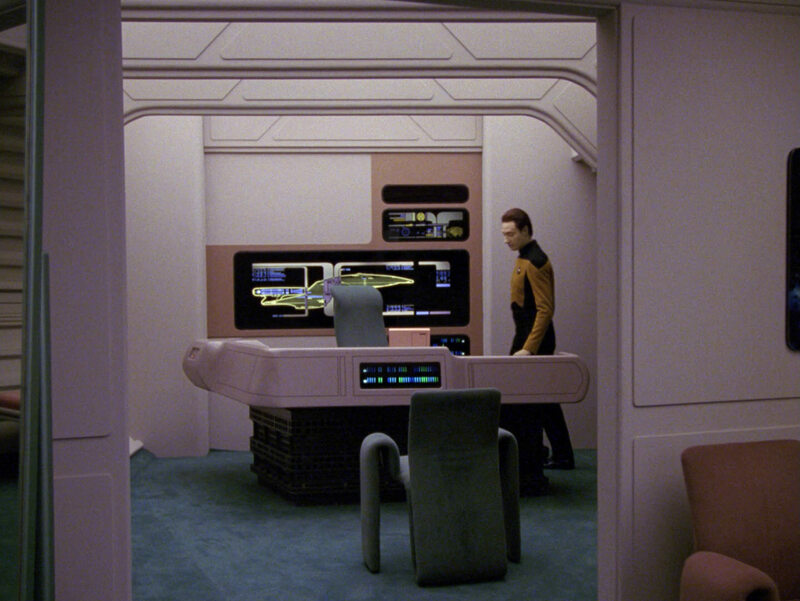 "The Most Toys" Data's quarters in HD. This is the first time this LCARS display, built into Data's desk, features an animated graphic. 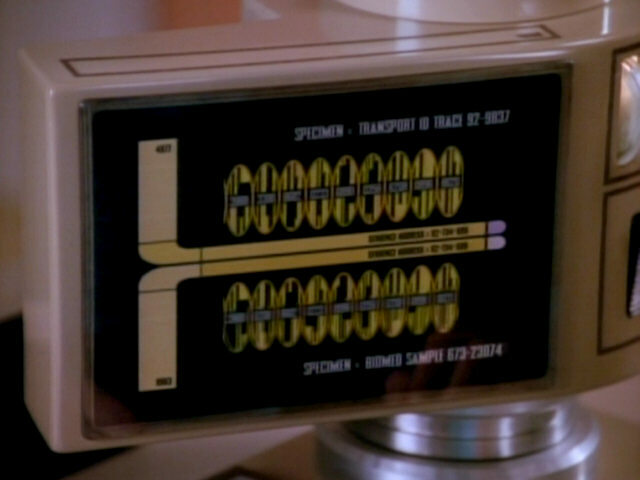 When the camera angle switches to a wider shot, the animated graphic has disappeared and a static graphic of the USS Enterprise-D is seen instead. 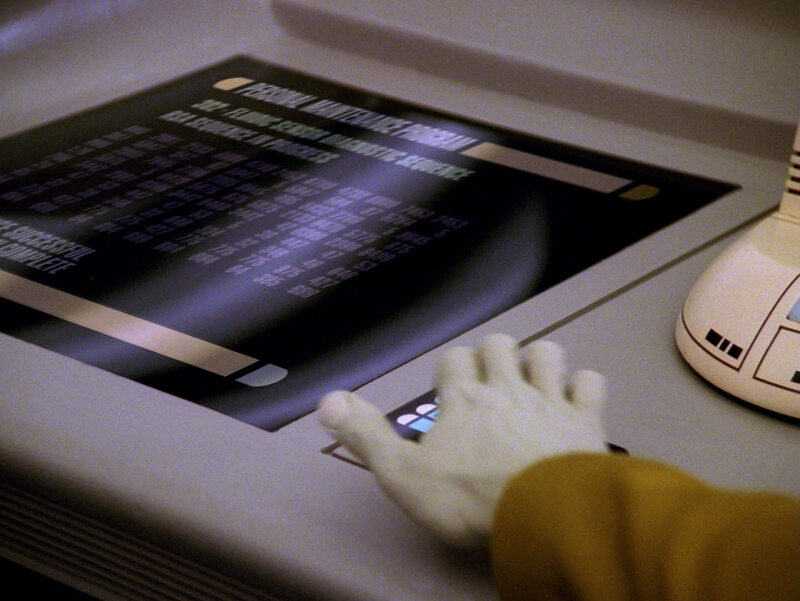 In HD, we can read the routines of Data's "Personal Maintenance Program" on the first screen. 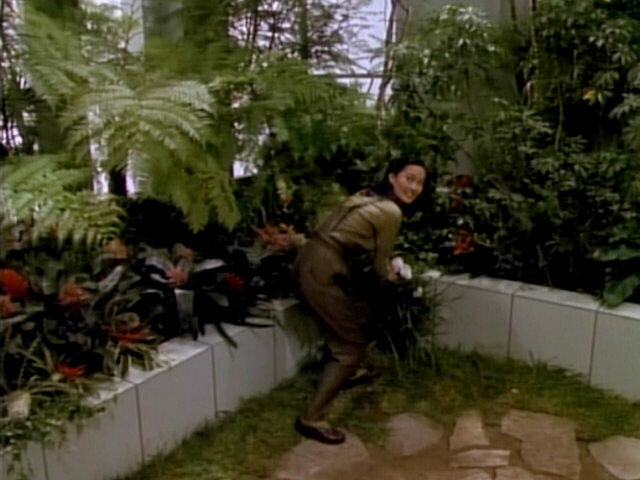 Another comparison shot from season 3's "Tin Man" shows that the set hasn't changed since that episode. 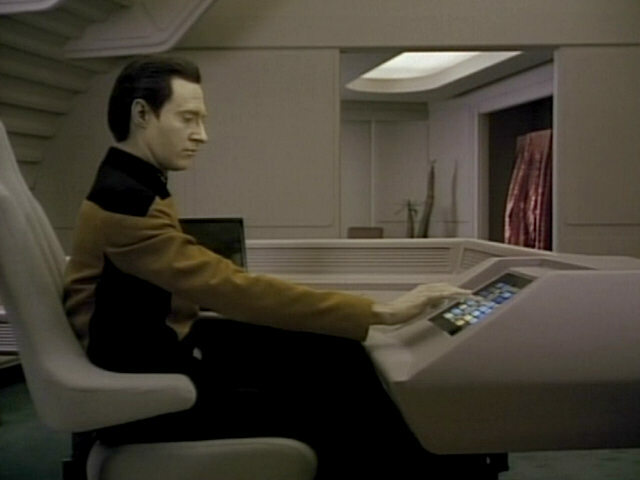 Data's chair has been replaced, however. 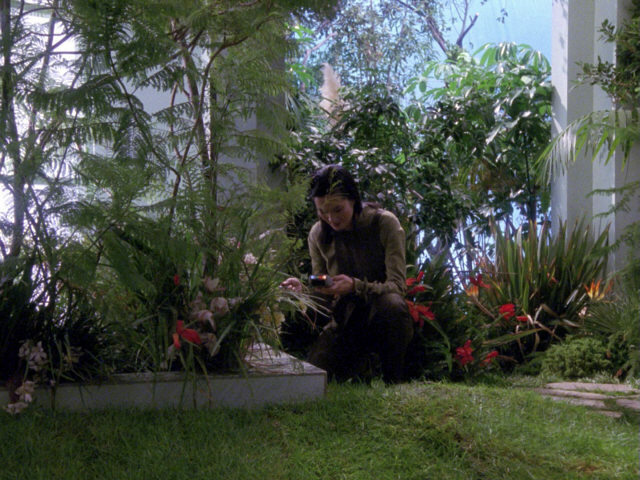 The arboretum is seen for the first time in this episode. 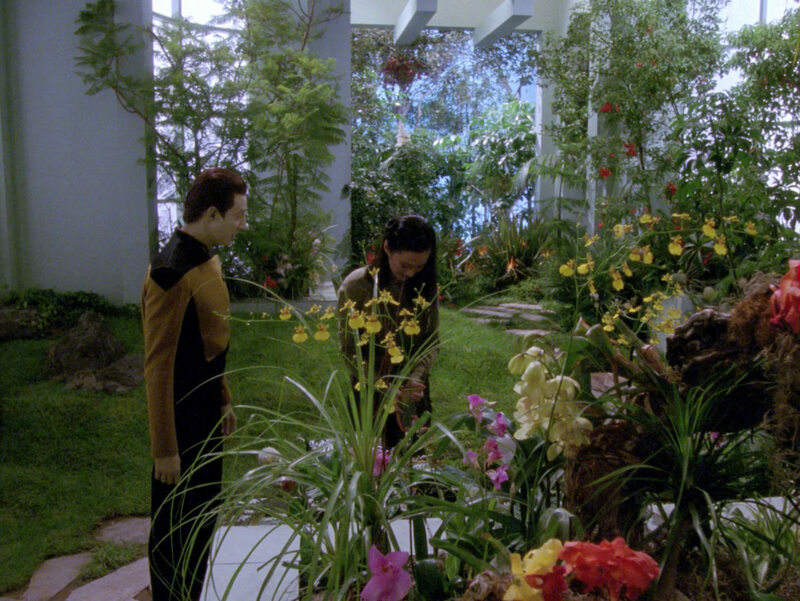 A good look at the arboretum in HD. 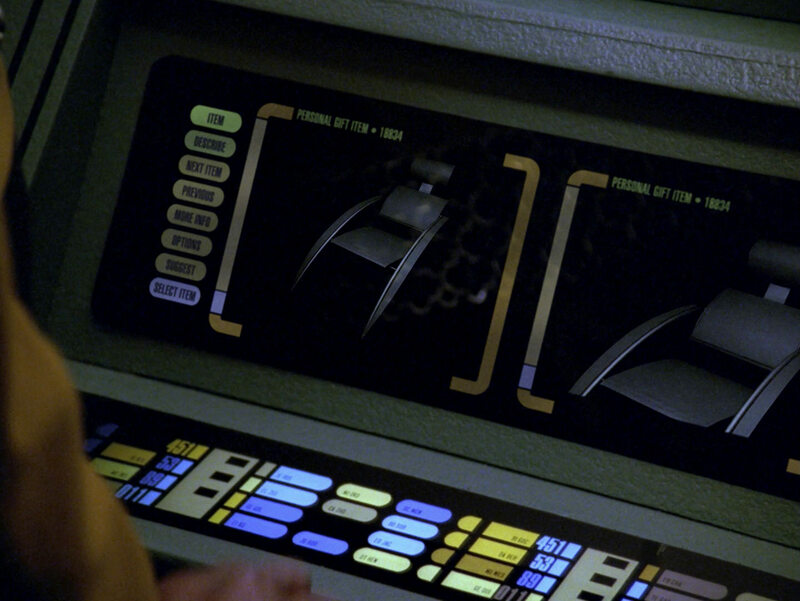 Note the much more natural colors. 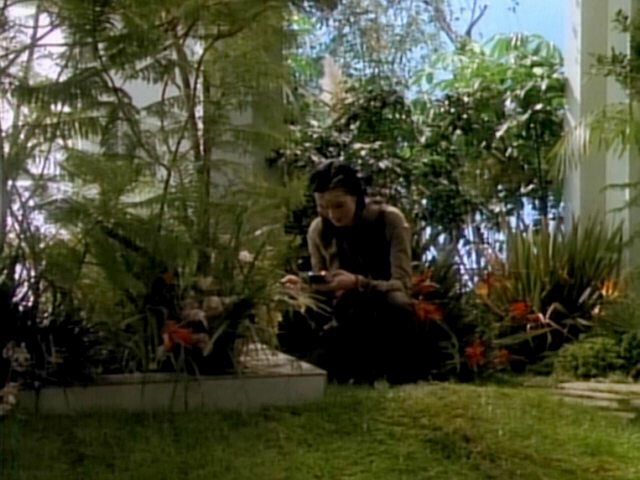 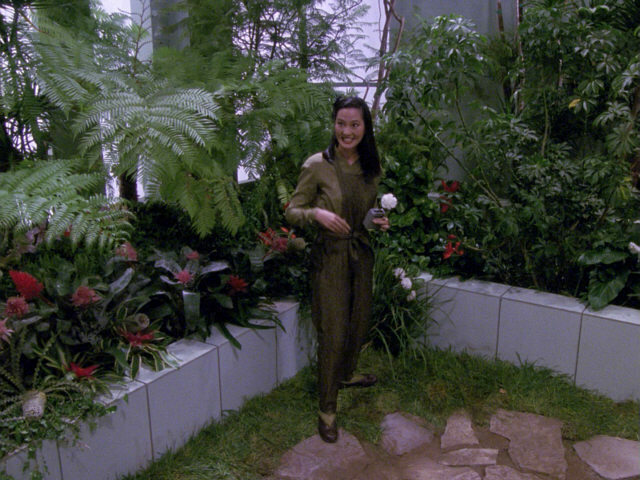 The botanical scanner Keiko uses in this shot later appeared as an engineering tool in "Disaster" and "Realm of Fear". 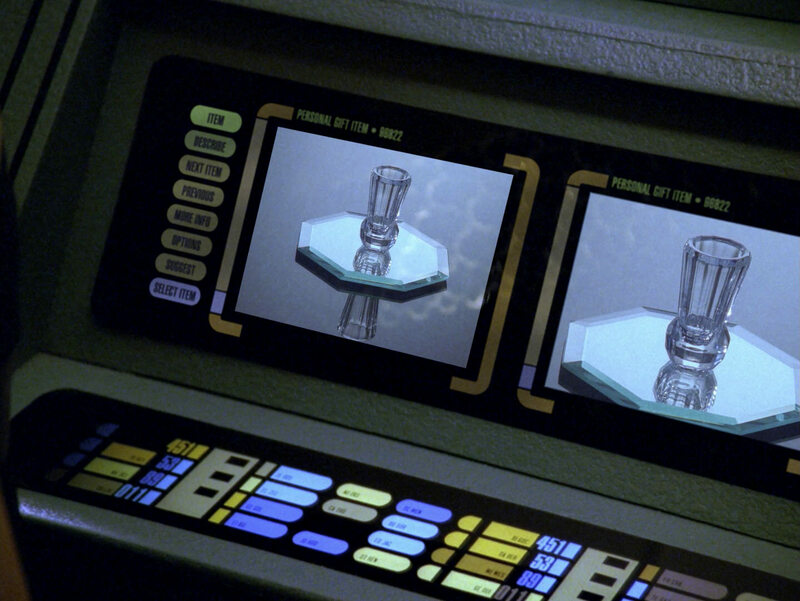 "Realm of Fear" An HD close-up of the prop. 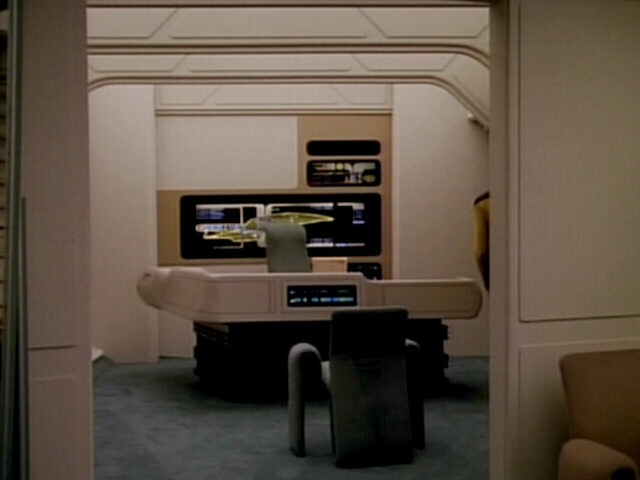 Troi's office wasn't changed since it last appeared in the last episode. 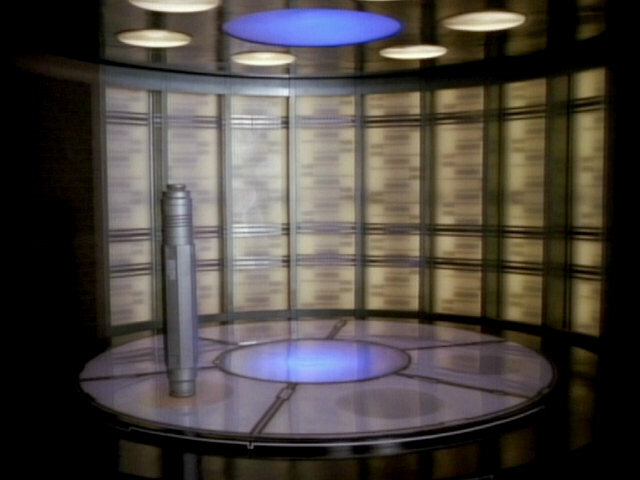 The enclosed shelving unit and the blue backdrop, introduced in the last episode, also appear here and are never seen again after this episode. 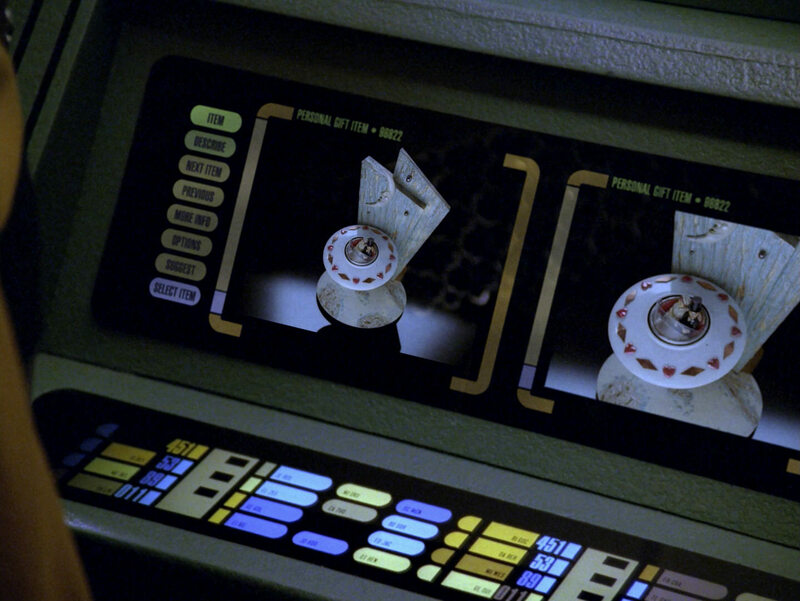 "The Loss" In HD, it looks like the round wall decoration is damaged. 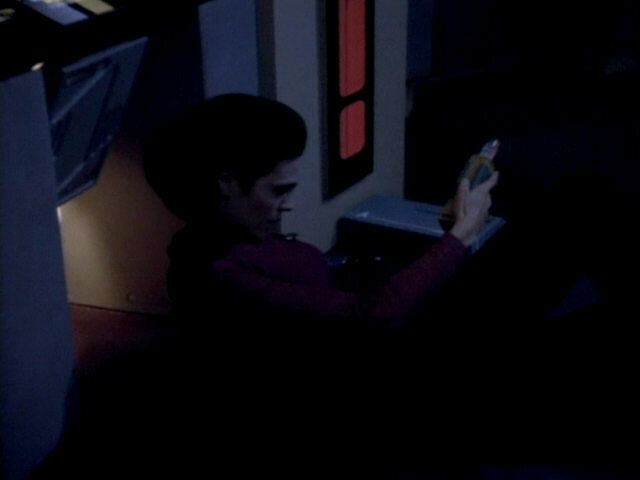 It seems Vulcans prefer not to see the stars through the crew quarters windows, as the windows are covered with padded walls in T'Pel's quarters. 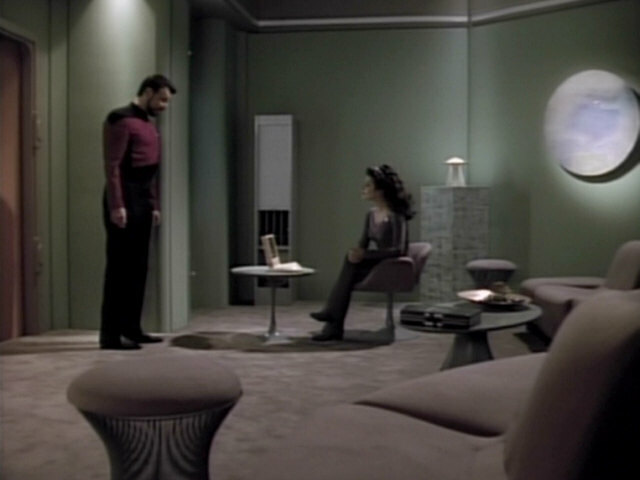 The same blinds were also used in Sarek's quarters in the eponymous episode. 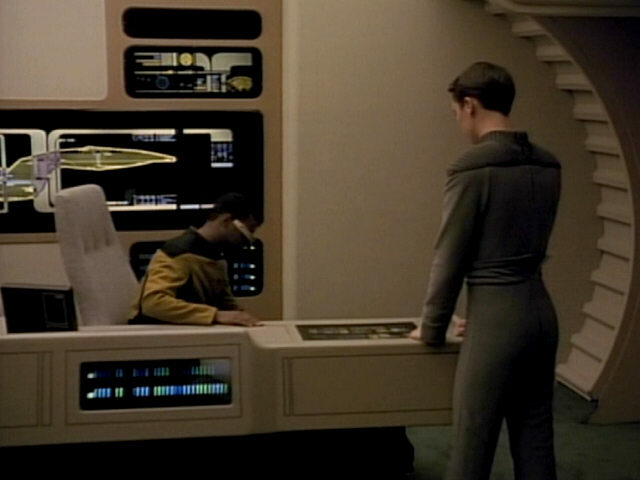 T'Pel's very uncharacteristically blonde hairline is also prominently seen in this shot. 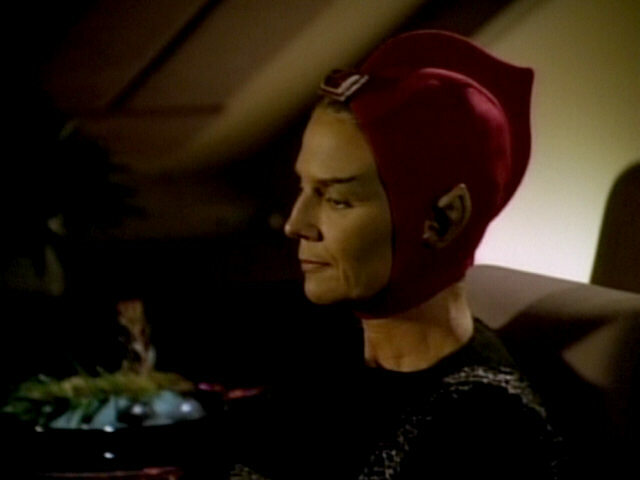 Red hoods, like the one she is wearing, were originally created for "Star Trek III: The Search for Spock". 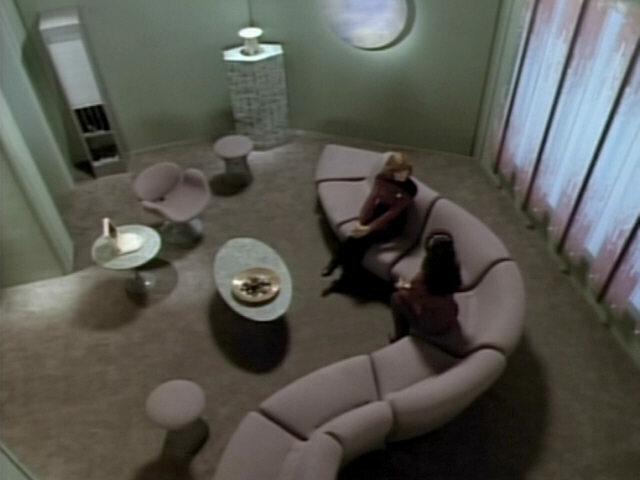 "Star Trek III" A look at T'Pel's quarters as it appears in TNG-R. 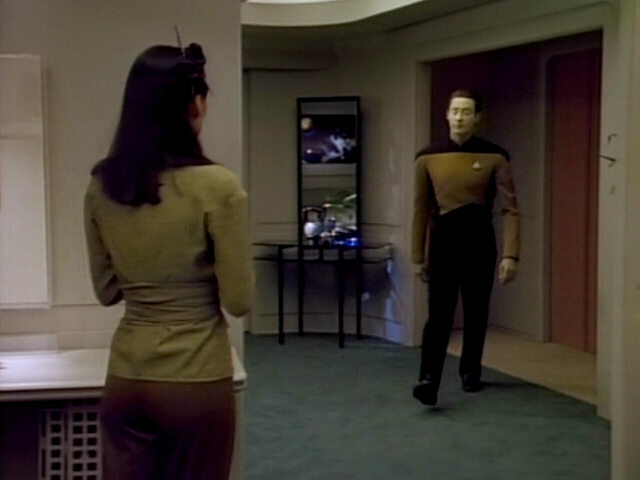 This is the full good look we get at one end of the Ten Forward/senior officers' quarters corridor set. 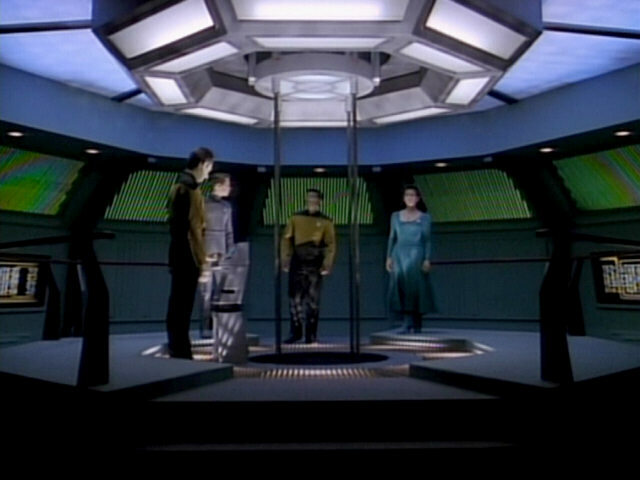 The Ten Forward door, starboard back wall and turbolift door can be seen in these screenshots. 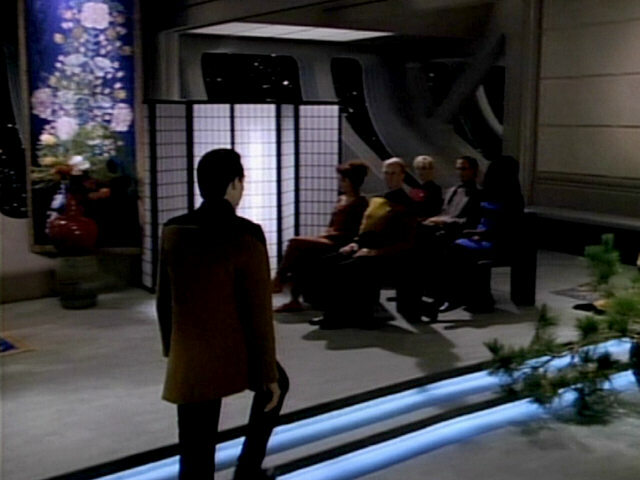 Previous episodes, like "Q Who" and "Transfigurations" showed only sections of this part of the set. 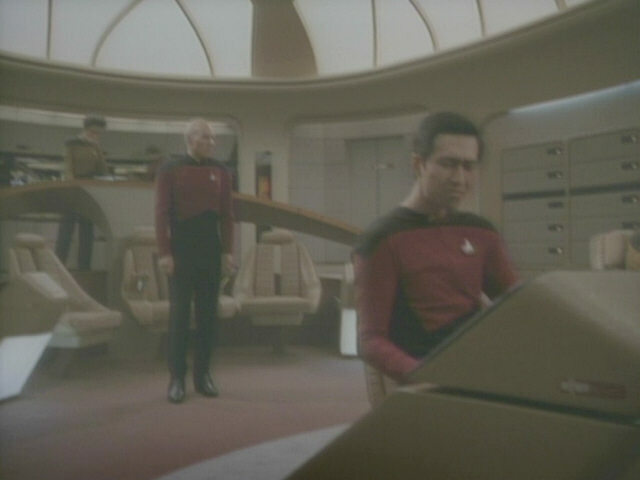 In this episode, however, the true extent of the set is shown in a continuous camera move. 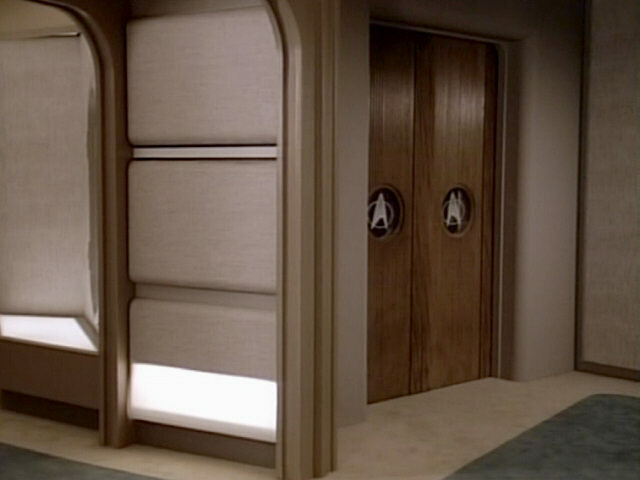 The dance studio set features wall panels similar to the ones on the Ten Forward side walls. 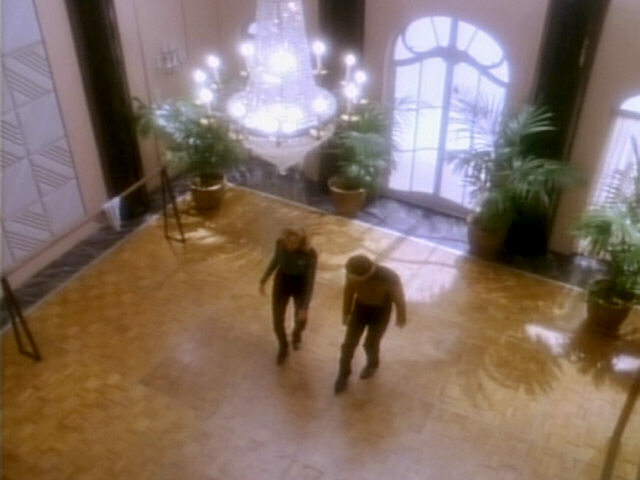 "Déjà Q" We can recognize many more details in HD, such as of the chandelier and the parquet floor. 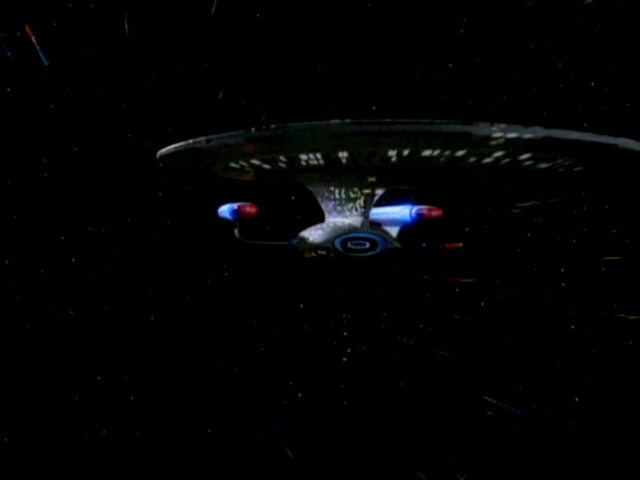 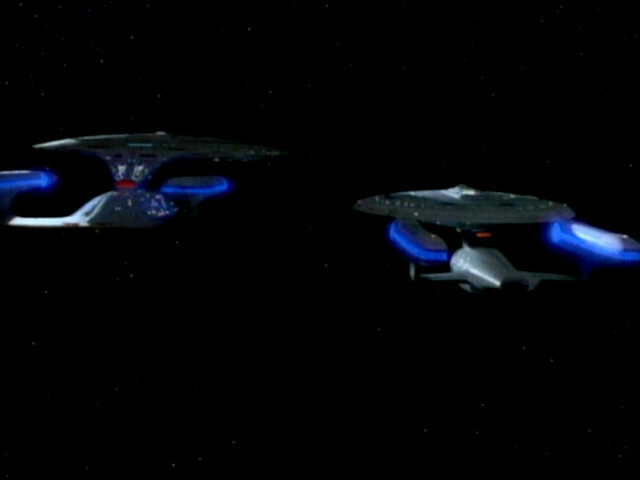 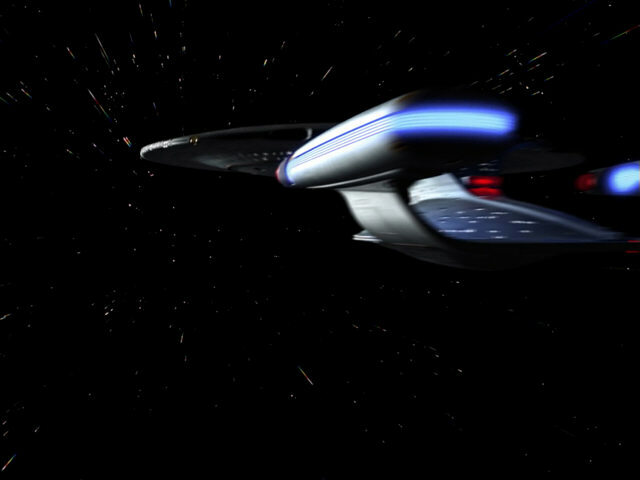 This is the same sequence of the Enterprise-D as in the TNG opening credits. 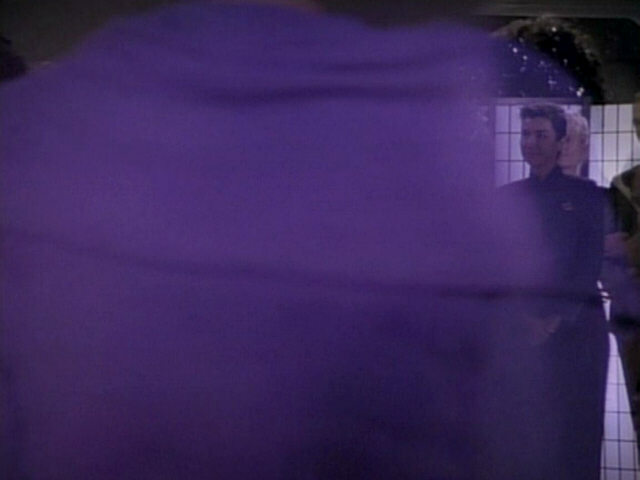 We see the 6-foot model in the slow flyby at the beginning (first two caps), while the warp jump (next two caps) was filmed with the considerably less detailed 2-foot model. 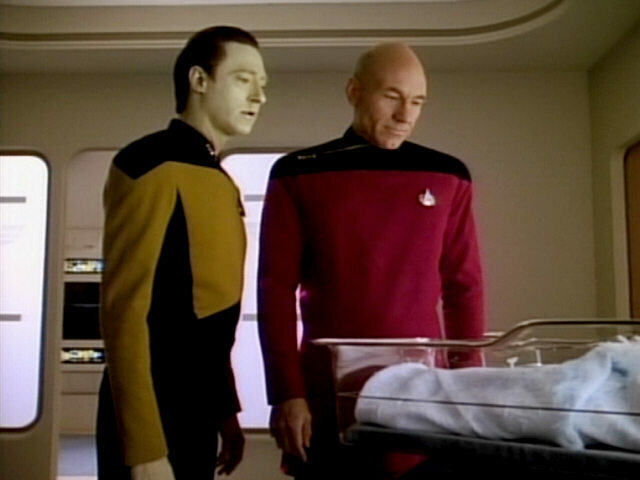 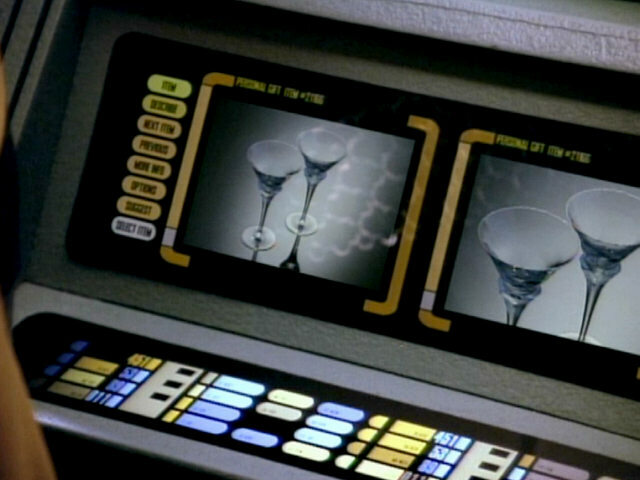 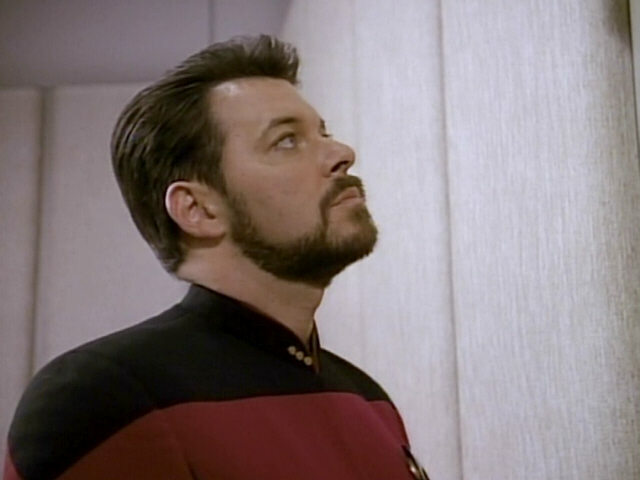 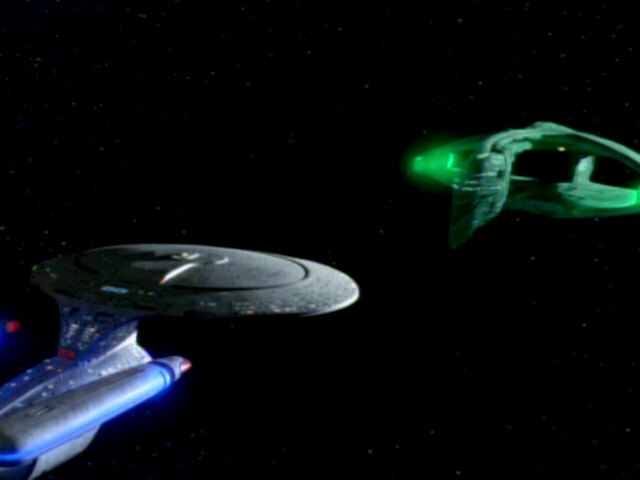 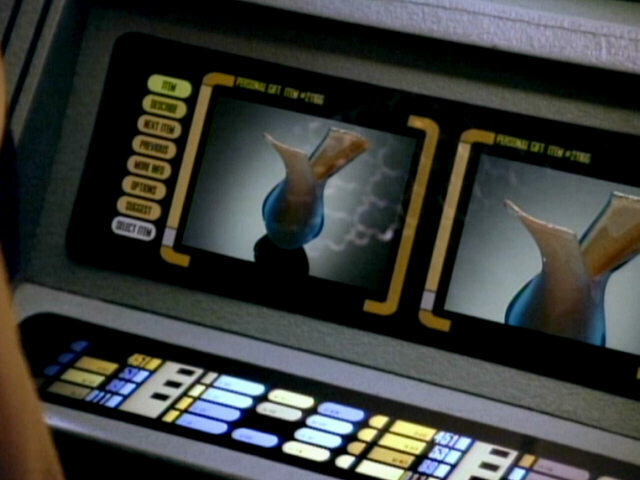 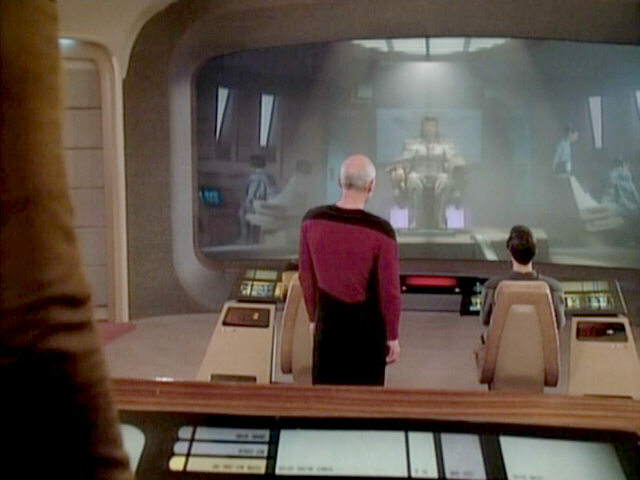 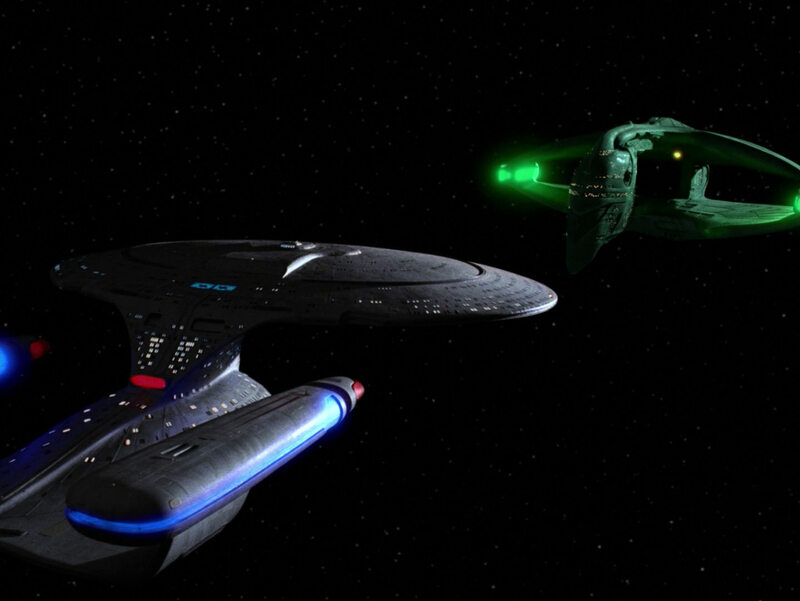 For the TNG-R release, the two different models were digitally equalized. 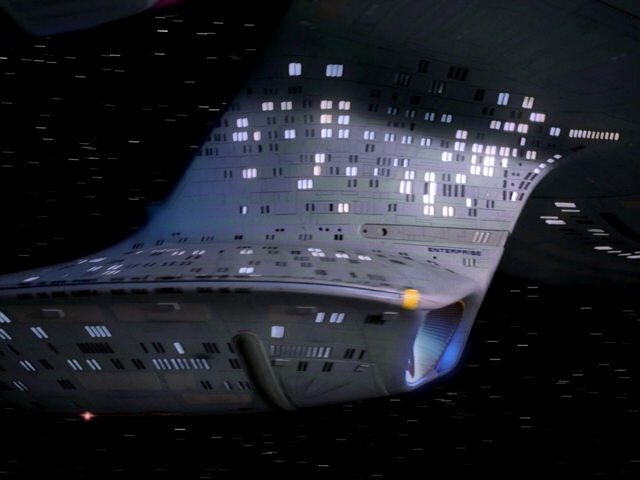 The previously missing window lighting was supplemented for the shot of the 2-foot model, and the strange shaded areas on the hull were removed (or avoided). 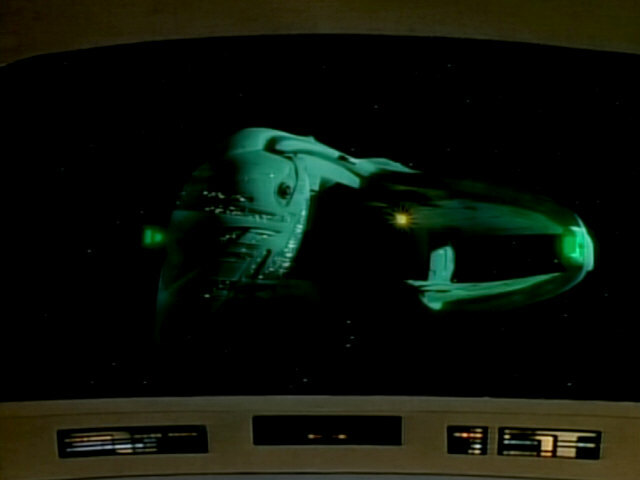 Nearly all footage of the Romulan Warbird appears for the first time in this episode, like this shot on the bridge viewscreen. 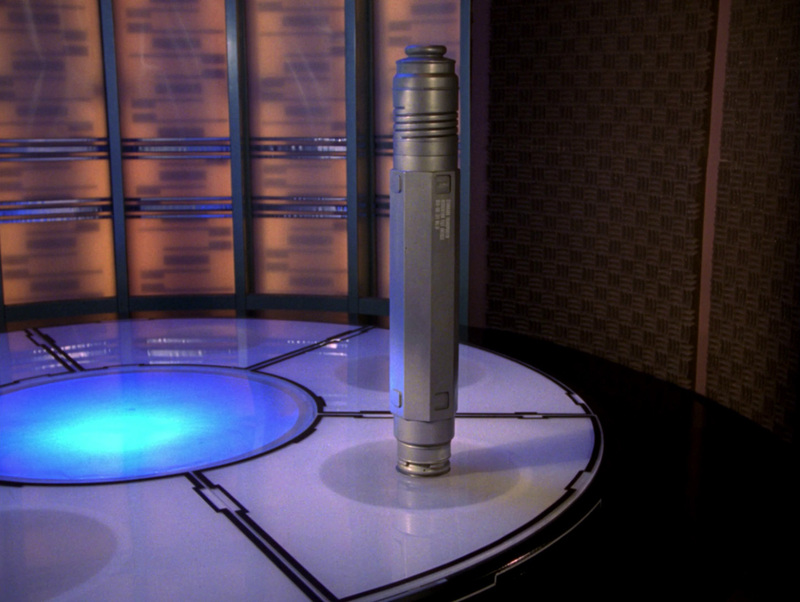 A look at the shot in HD. 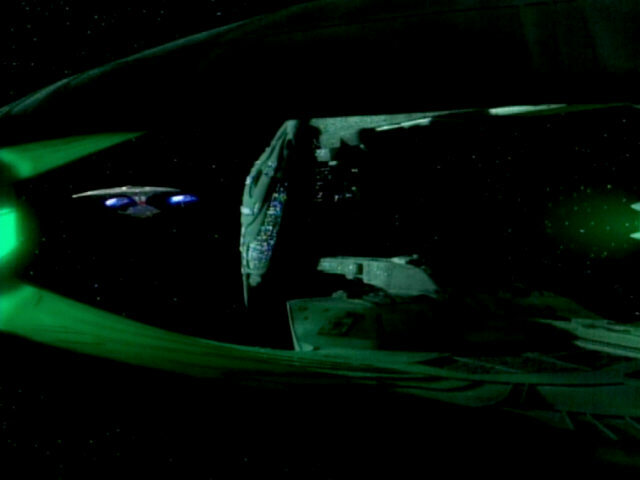 The bridge of the Romulan Warbird seen in this episode shows more similarities to the season 2 bridge, seen in "Contagion" and the season 6 bridge, seen in "Face of the Enemy" than to the season 3 bridge, seen in several episodes. 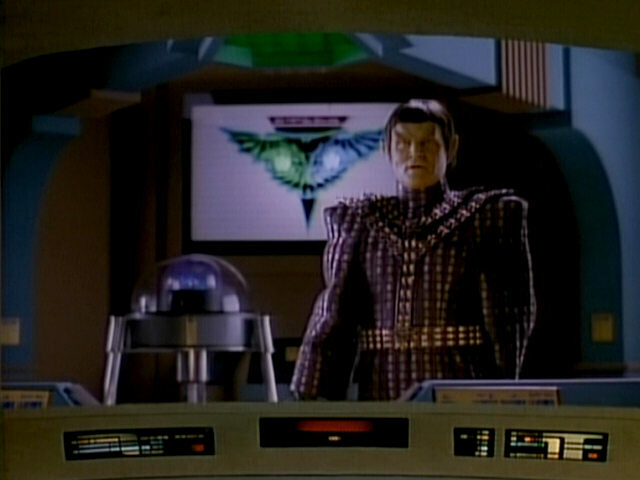 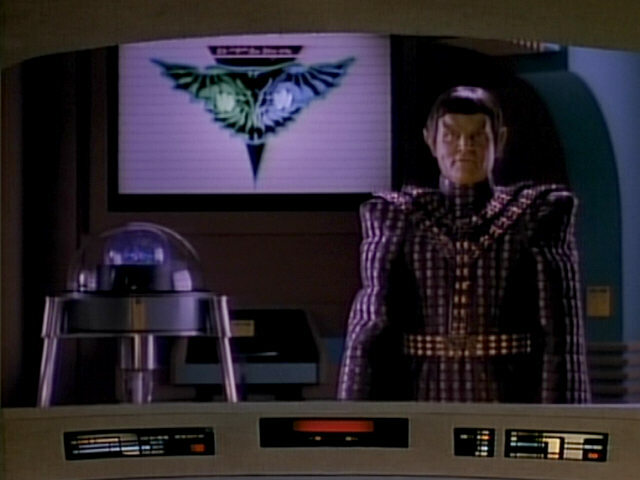 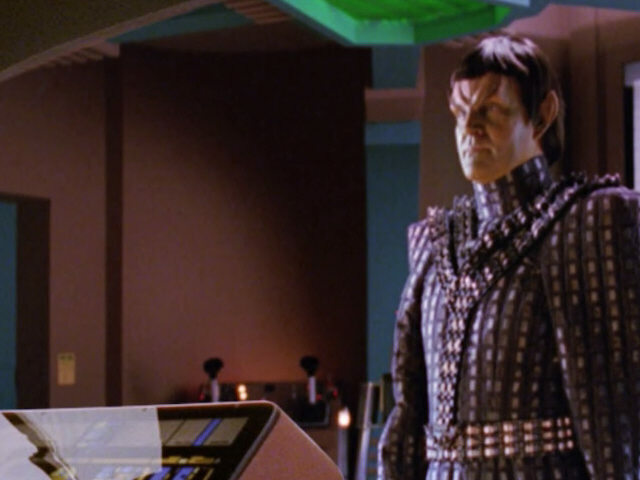 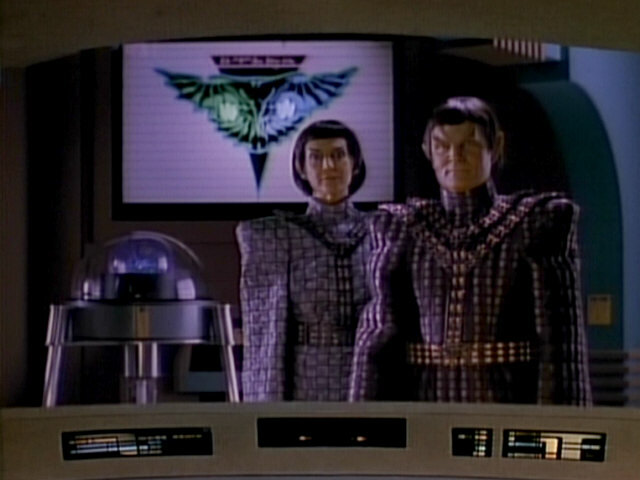 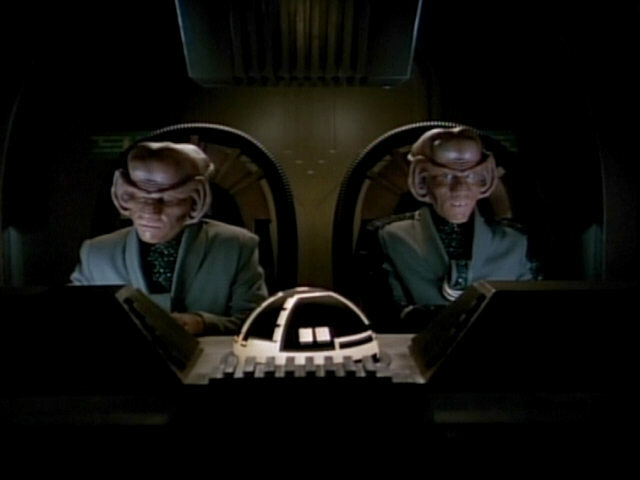 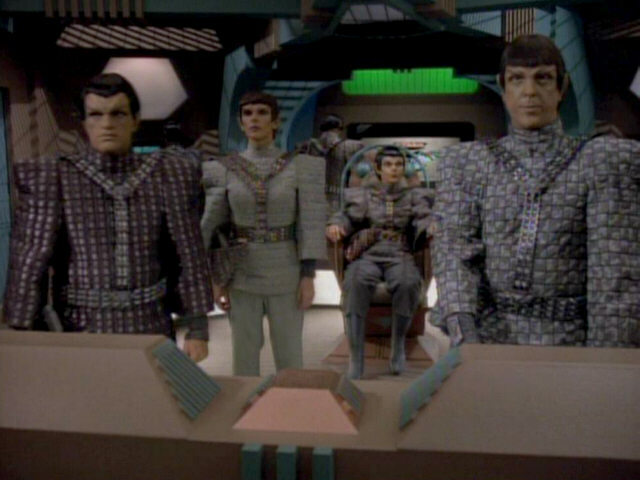 The console in the foreground was originally created as a Ferengi console for "The Price" and appeared in several later episodes as a Romulan console. 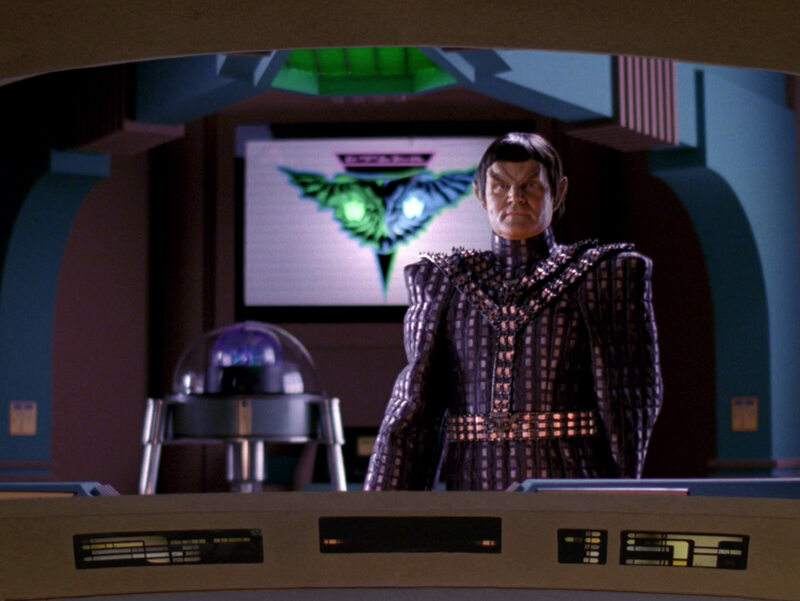 "The Defector" The Romulan bridge in HD. 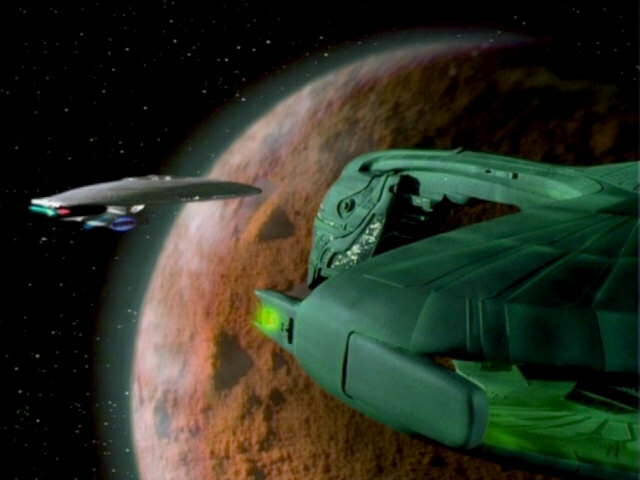 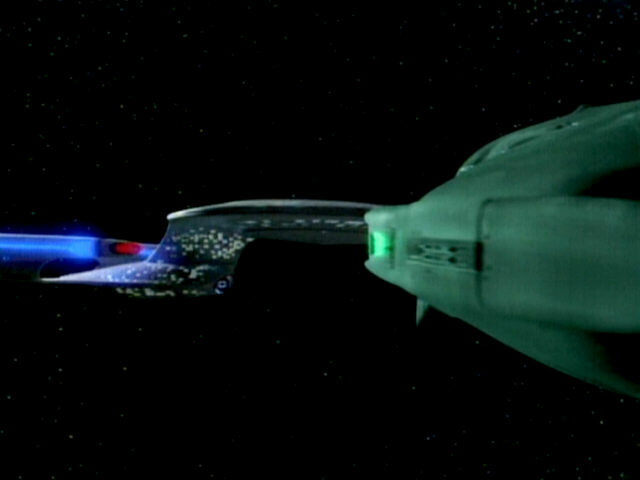 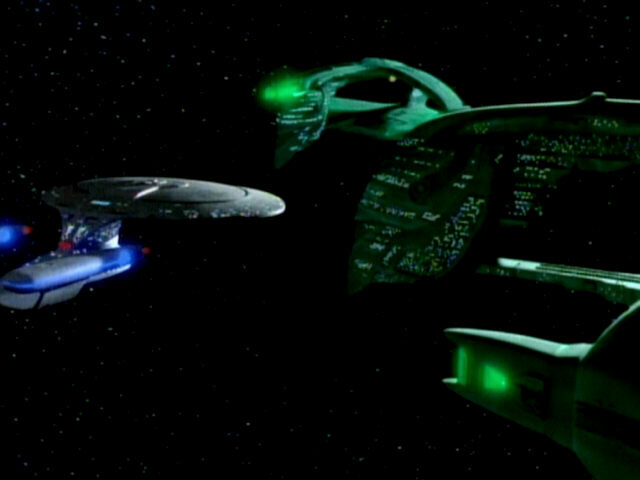 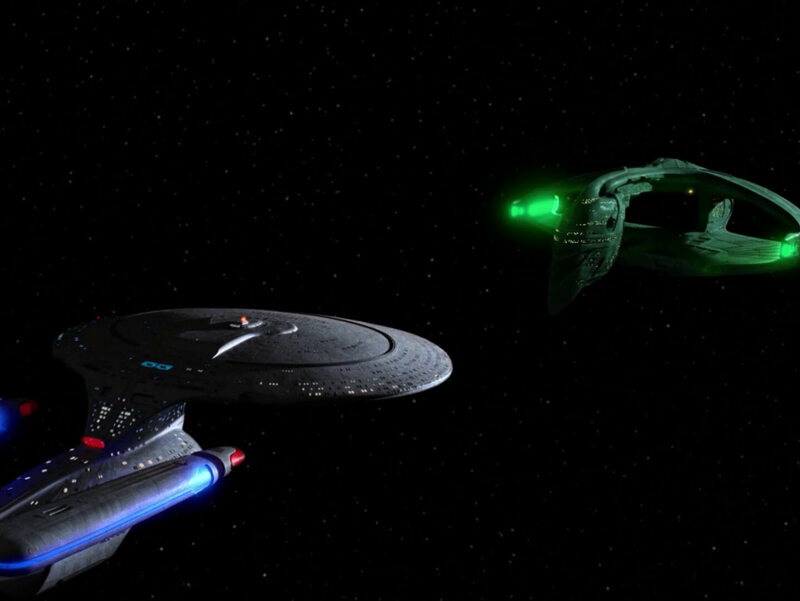 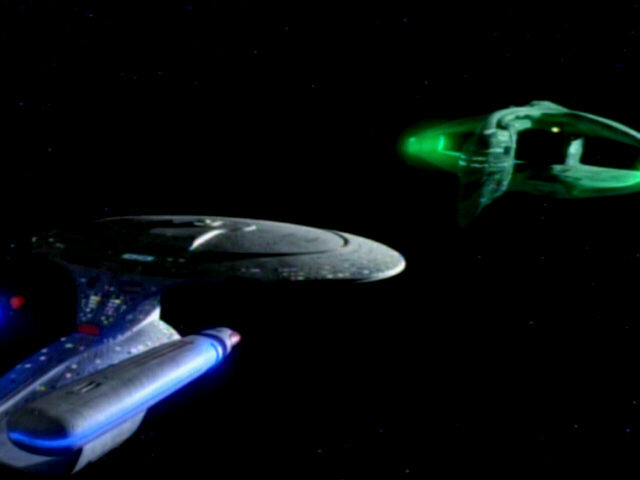 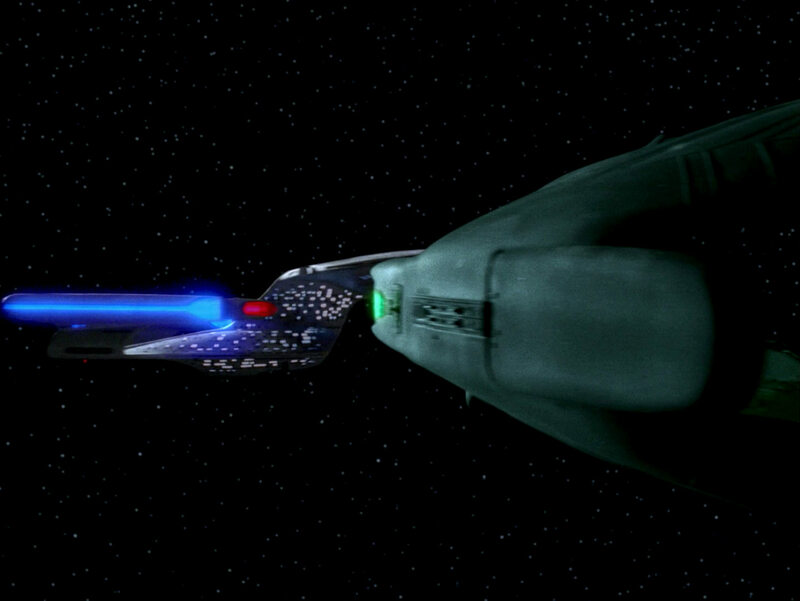 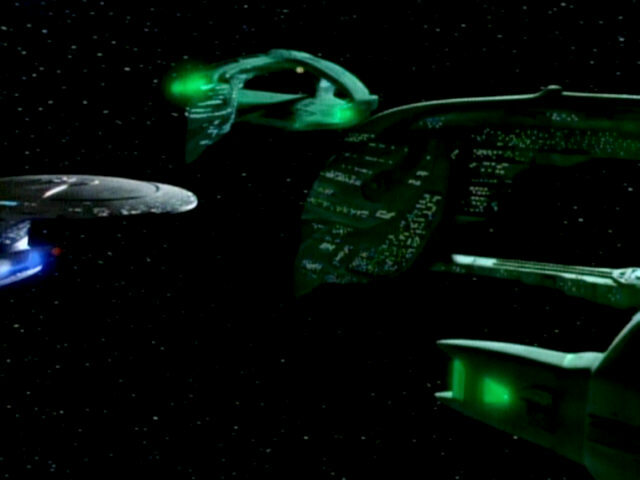 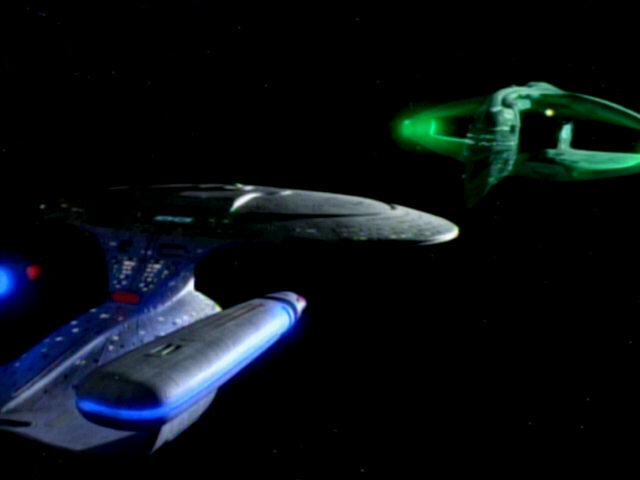 This shot of the USS Enterprise-D facing the Romulan Warbird was newly created for this episode. 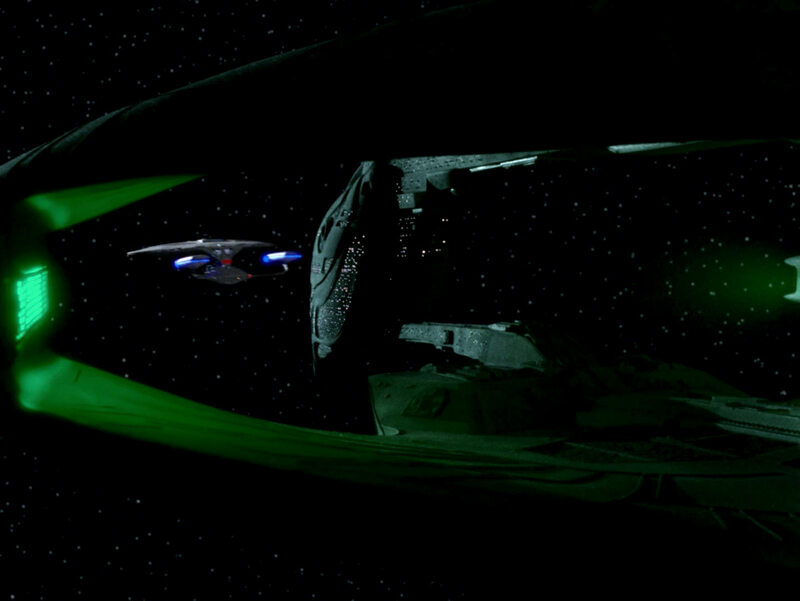 Appearances of the Romulan Warbird The great shot in HD. This is the only re-used shot of the Romulan Warbird seen in the episode. 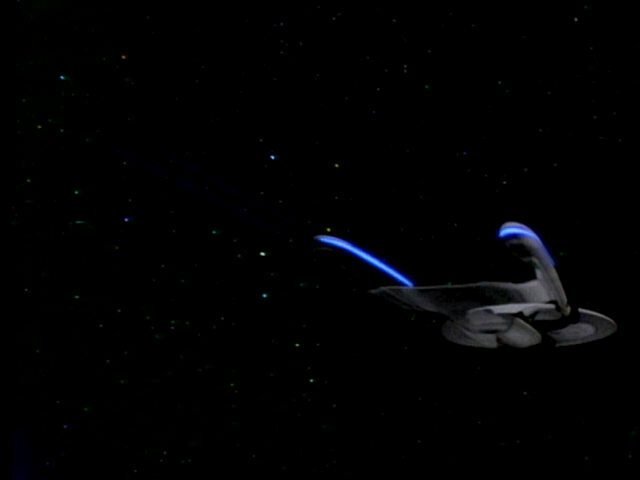 It was originally created for "The Neutral Zone" and has appeared in nearly every TNG episode featuring a Romulan Warbird. 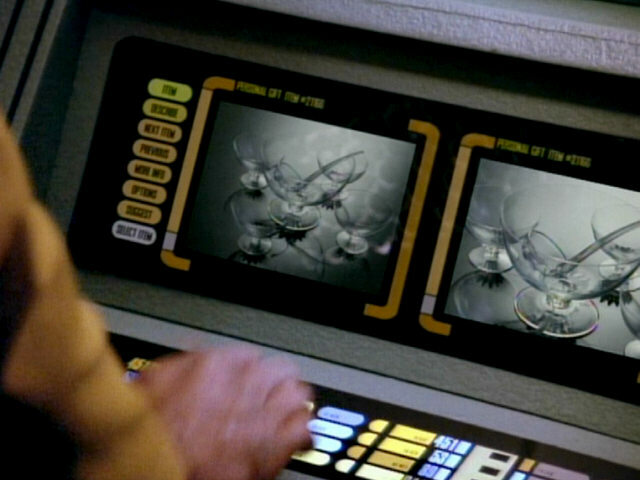 It appears again a little later in the episode, the color and the brightness of the second shot is noticeably different, though. 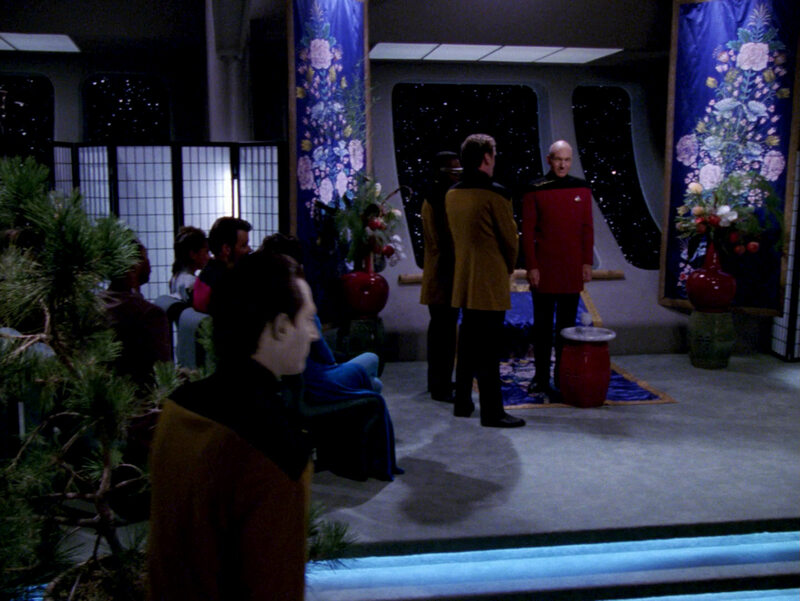 this episode There is no color discrepancy between the shots in HD. 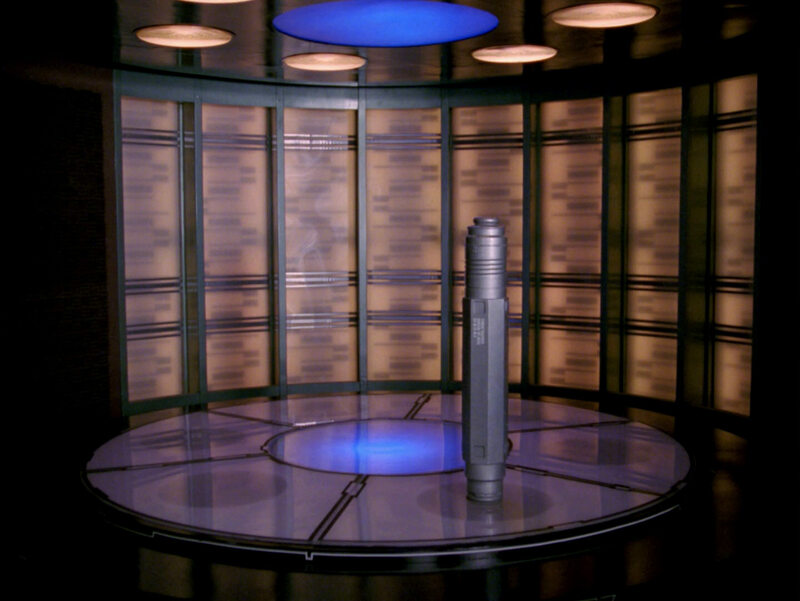 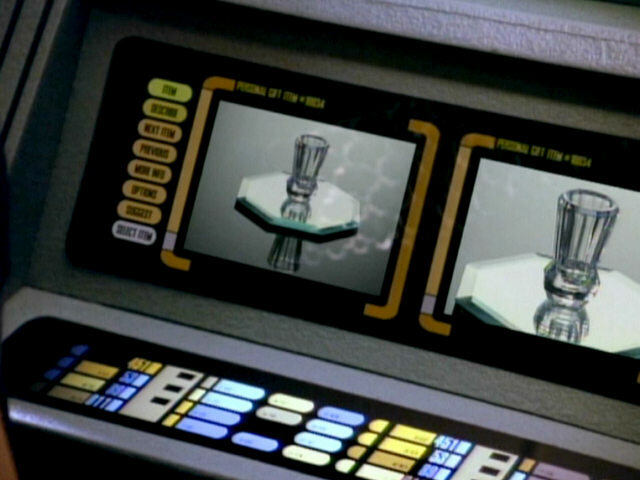 Test cylinders have appeared in the earlier episodes "The Ensigns of Command" and "Hollow Pursuits". 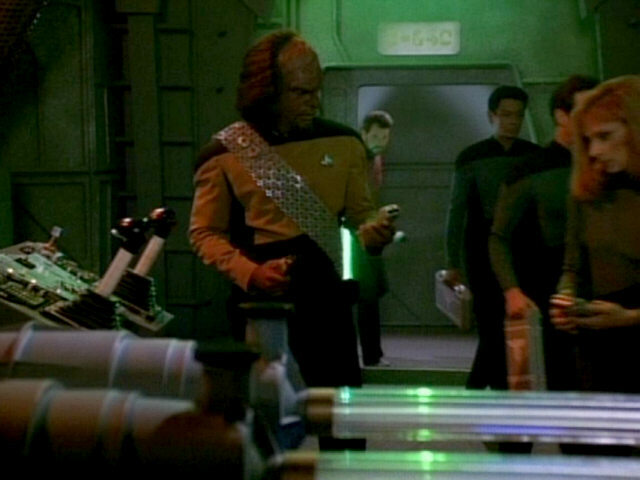 In real life, these are casings of sonobuoys used by the U.S. Navy. 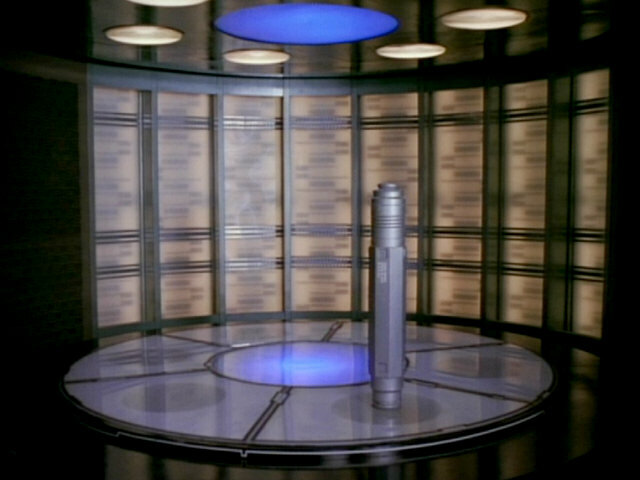 "Hollow Pursuits" The test cylinder and transporter platform in HD. 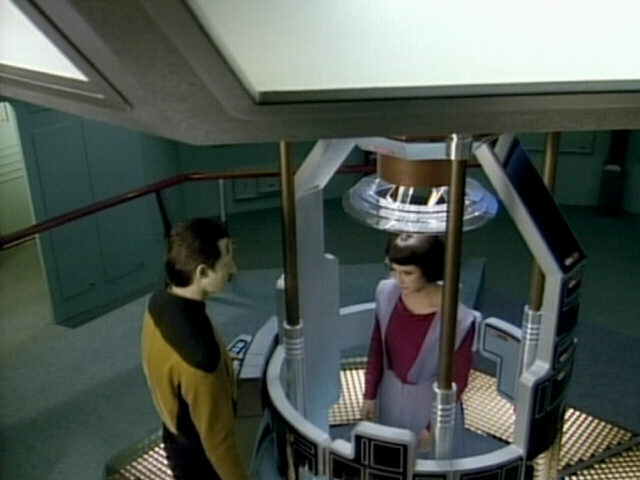 A new medical monitor appears for the first time in this episode. 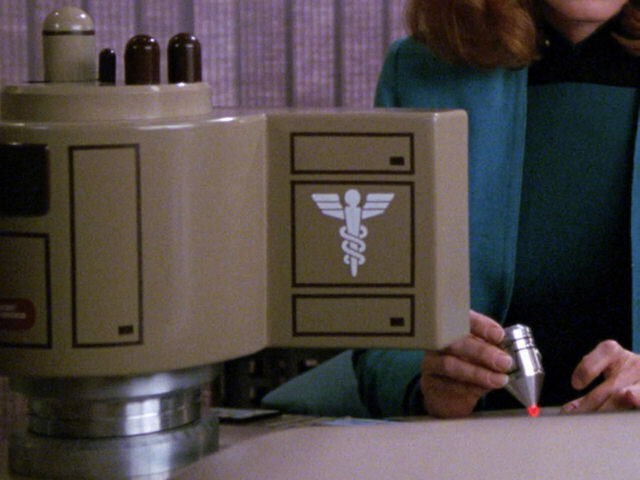 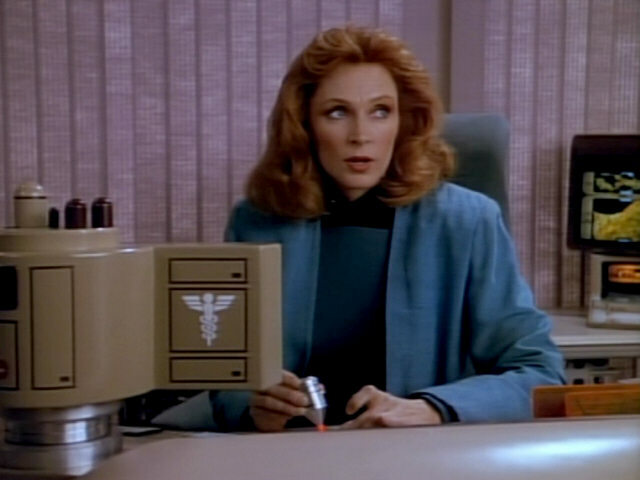 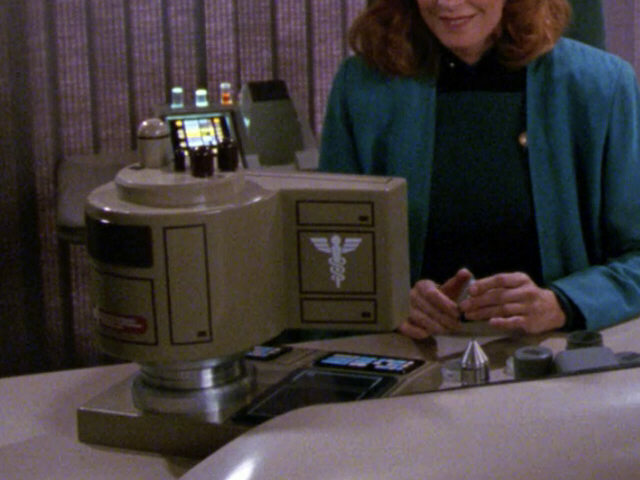 The prop features a slot to insert tissue samples and from now on appeared in Doctor Crusher's office in several episodes. 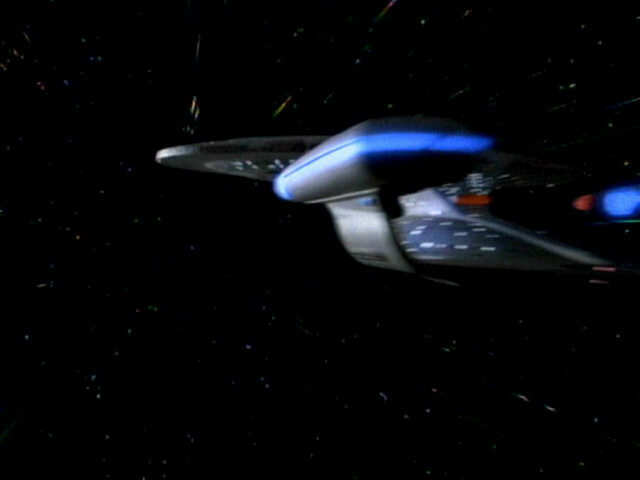 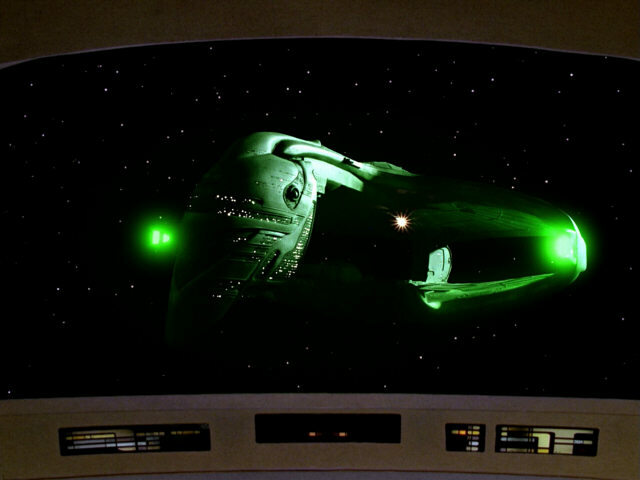 It later appeared in several DS9 episodes, including "The Passenger". 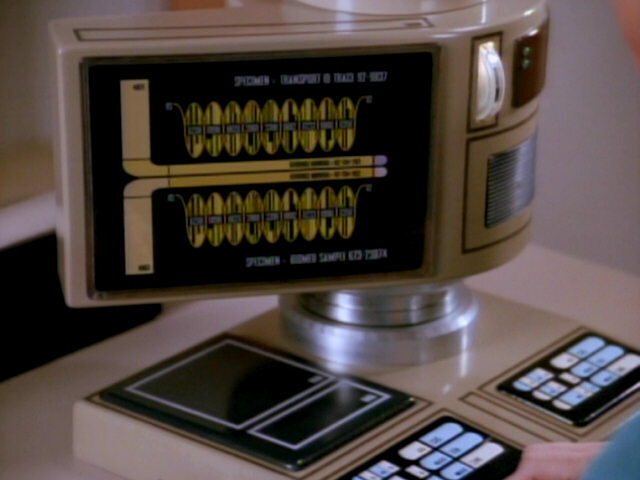 "The Passenger" Close-ups of the monitor in HD. A look at the display screen of the monitor, displaying several DNA graphics. 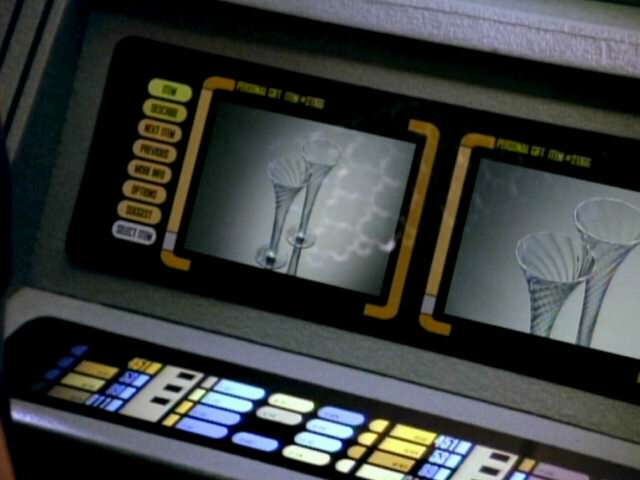 As can be seen in the screenshots from the DS9 episode "The Passenger", the prop was not modified when it appeared on that show. 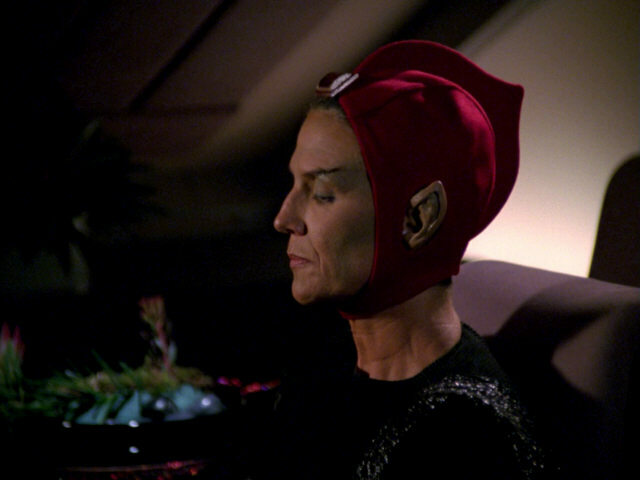 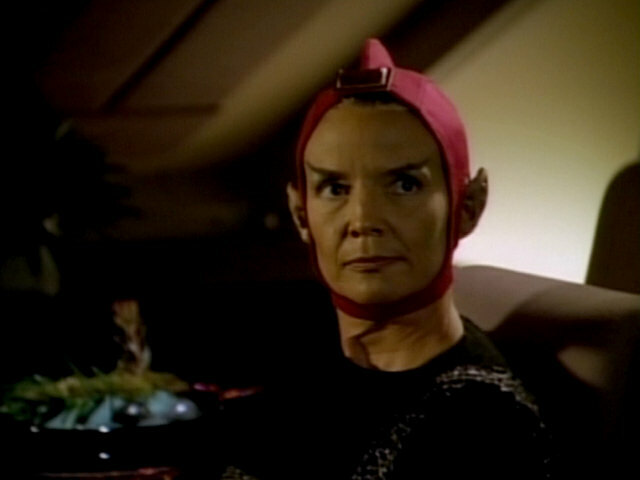 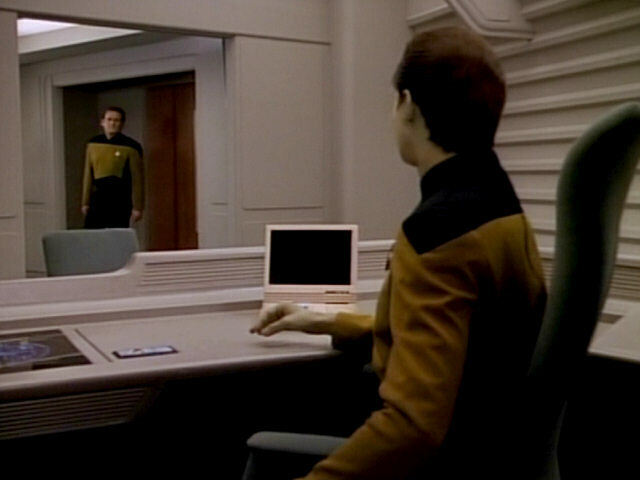 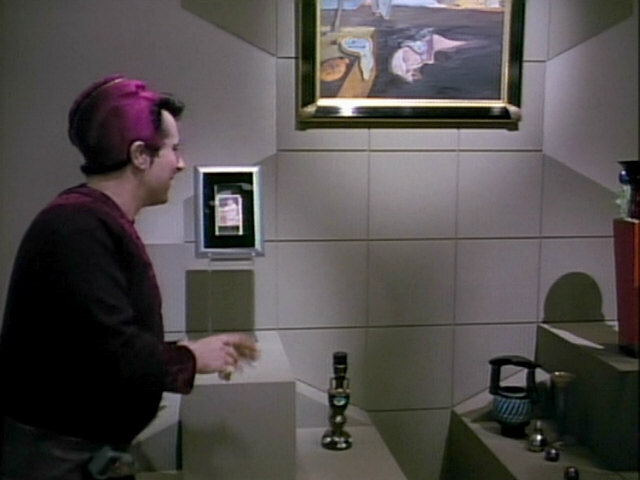 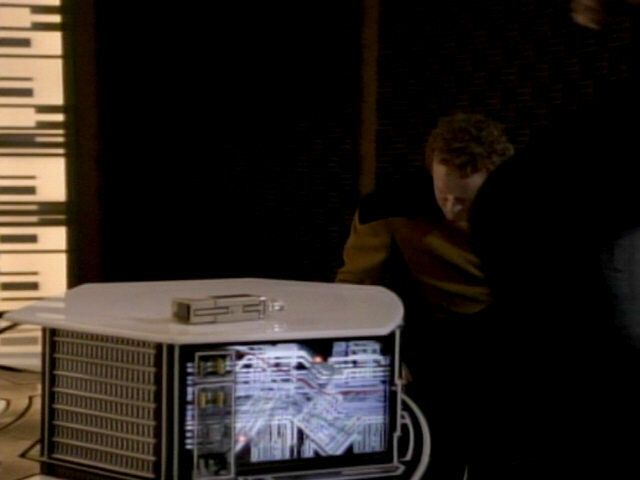 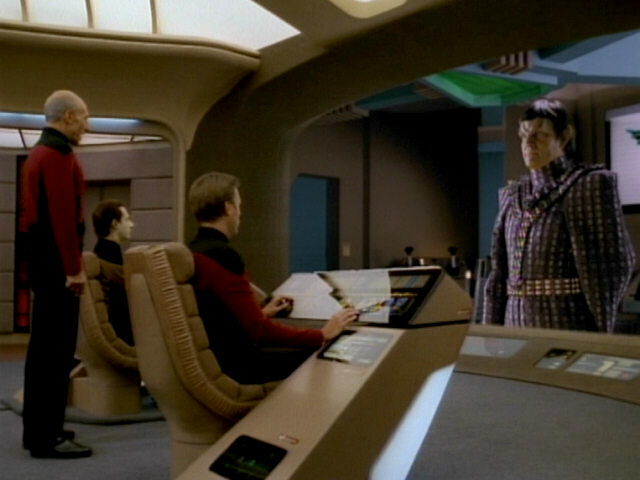 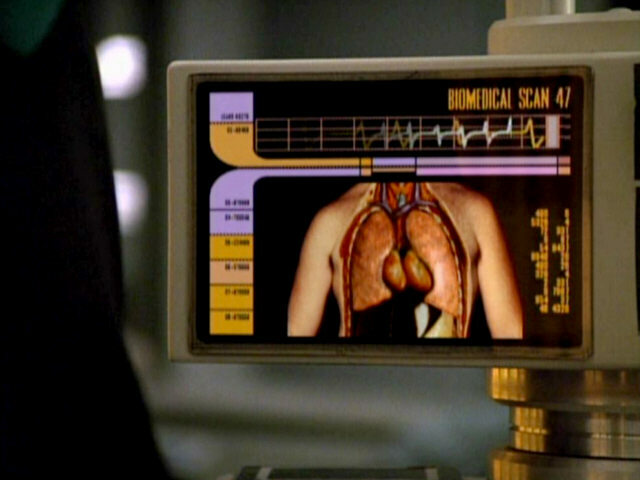 The medical monitor also appeared in some Voyager episodes, like "Threshold". 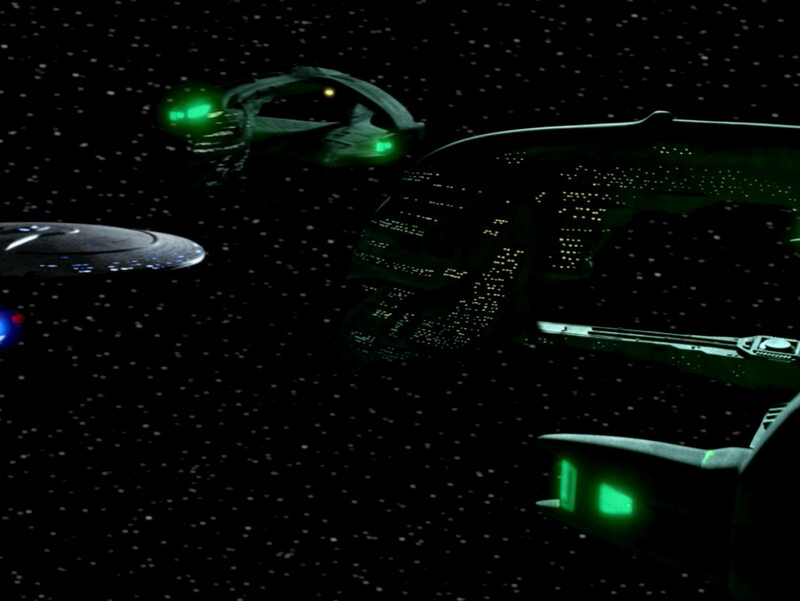 "The Passenger" The graphics were newly created for the remastered episode. Note that the envelope of the original DNA segments is elliptical, while it is sinusoidal in TNG-R.
A brief shot showing the USS Enterprise-D flying away from the camera. 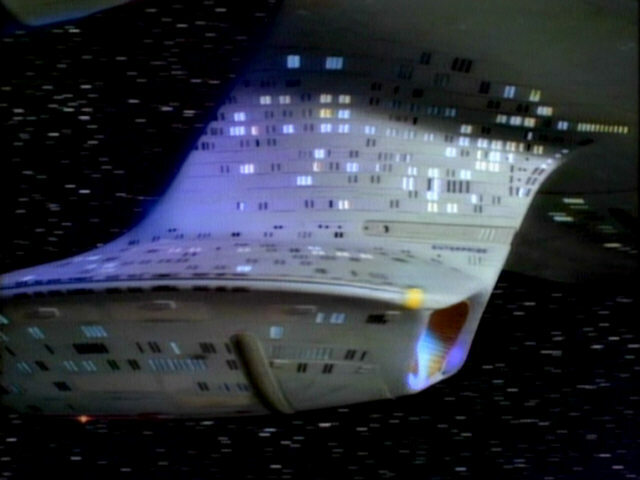 A CG model of the ship was clearly used in the remastered version of the episode as the original film element could not be located. 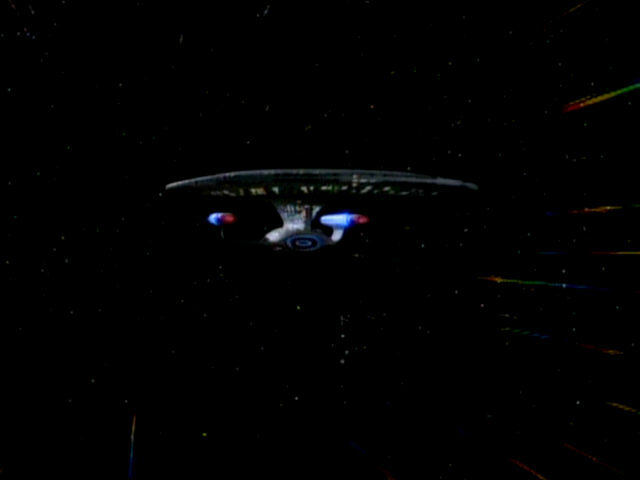 The USS Enterprise-D flies towards the camera, dropping out of warp towards the end of the sequence. 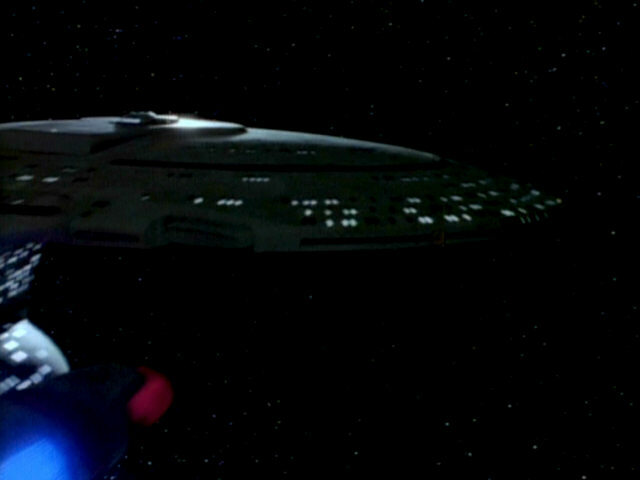 Enterprise Flybys in TNG and TNG-R Once again, we don't see the 4-foot model, but a CG model in the remastered episode. 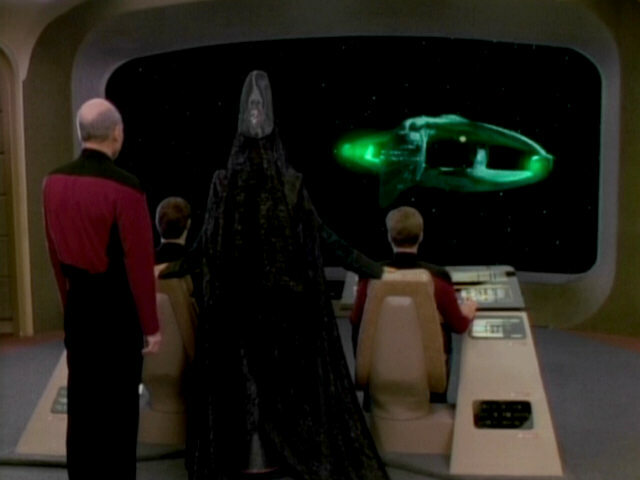 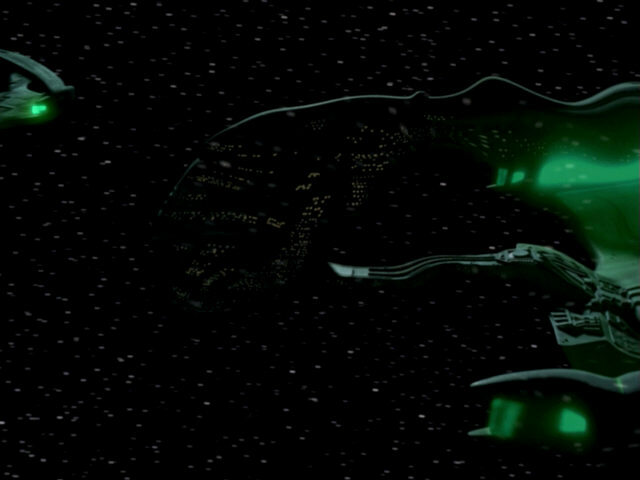 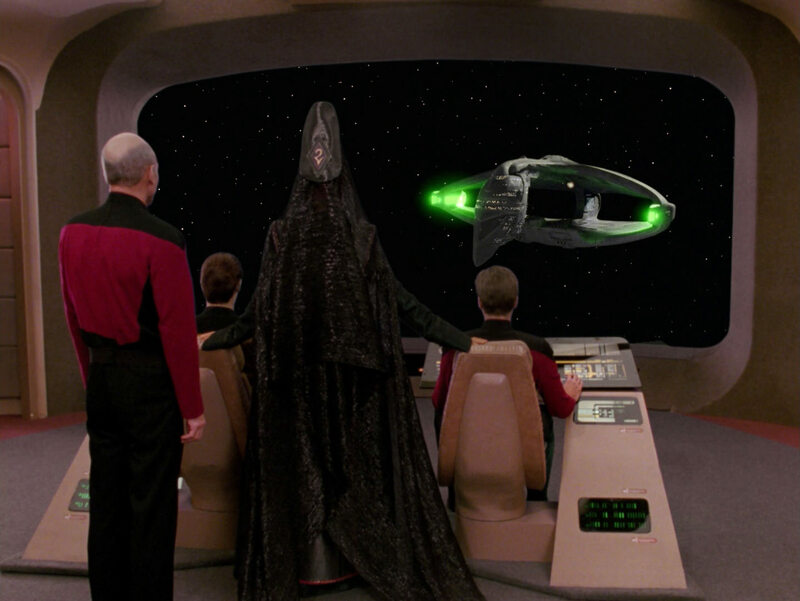 A second Romulan Warbird decloaks as it approaches the USS Enterprise-D. 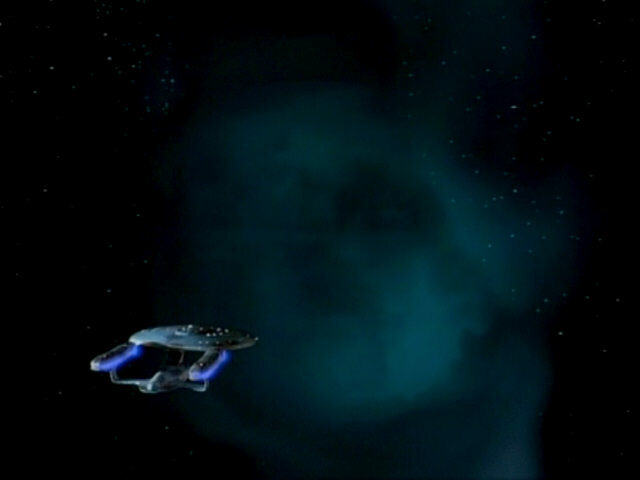 This footage was also newly created for this episode. 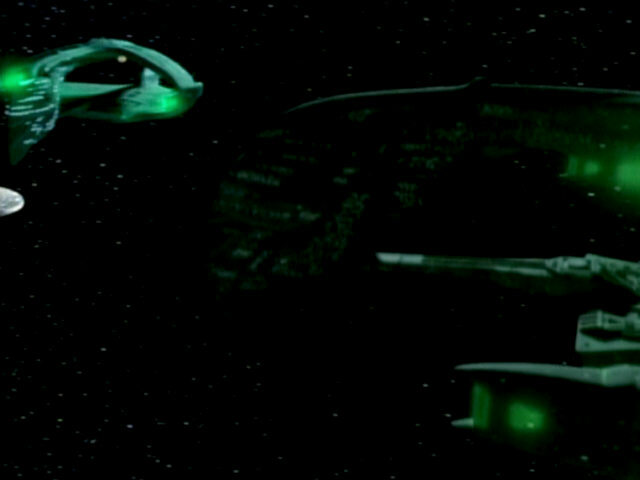 Comparison shots from "The Neutral Zone" and "Contagion" show the original model of the Warbird from a similar angle. 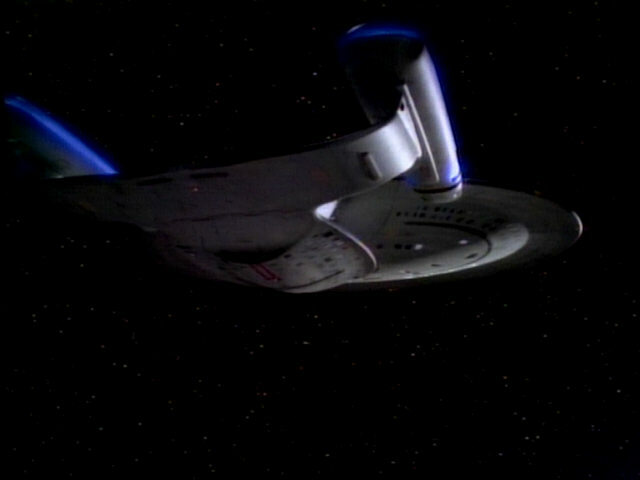 As can be seen, the original model featured less lighting in the upper part of the "head" section. 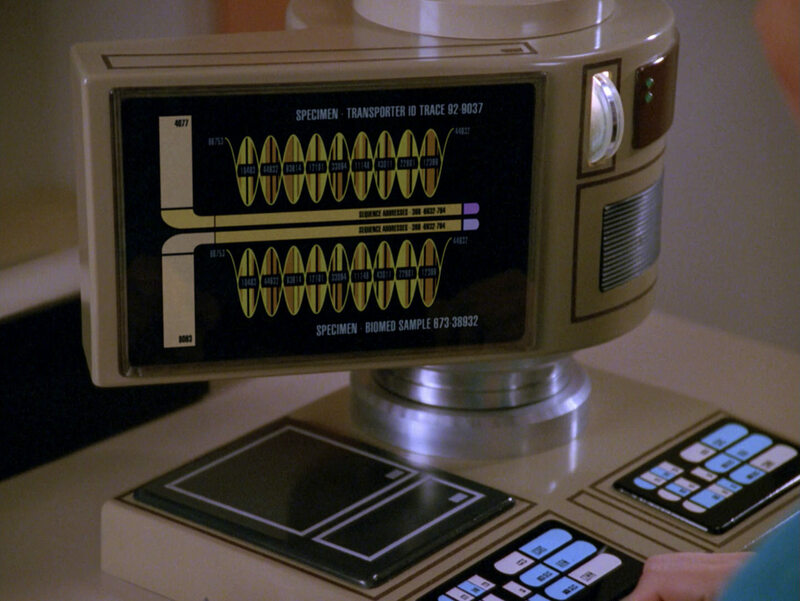 Zone" The recreated decloaking effect in TNG-R.
Another console is seen at the back of the Warbird bridge. 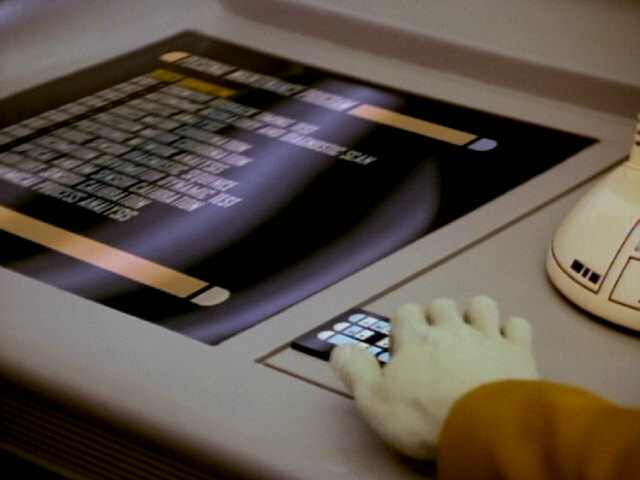 This console previously appeared on board the Talarian observation craft in "Suddenly Human" and was rented from Modern Props. 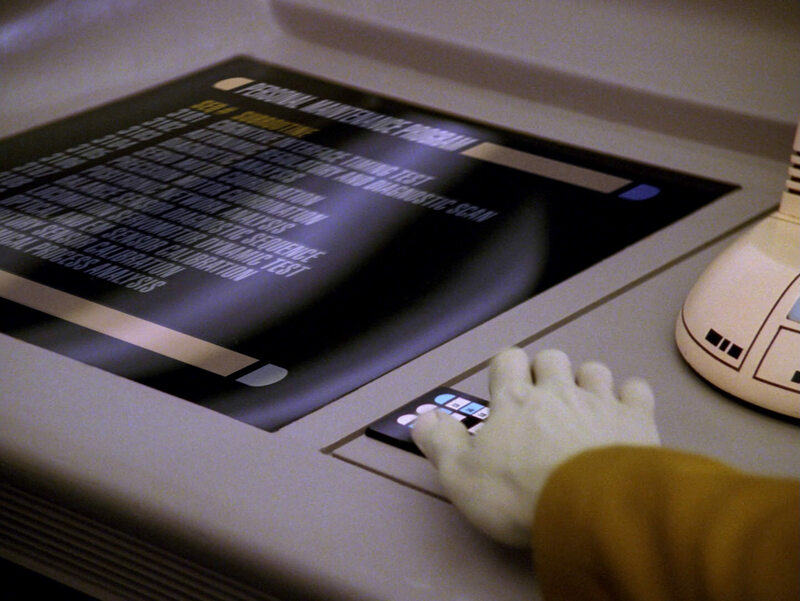 Human" An HD close-up of the console. 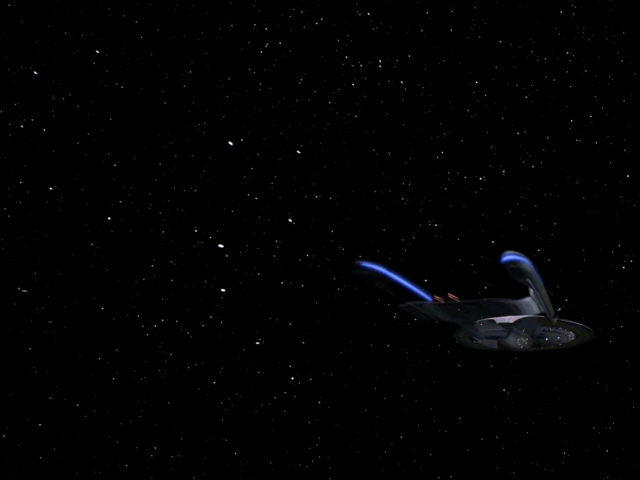 The Enterprise-D turns around and flies away, as seen through the open sections of the Romulan Warbird. 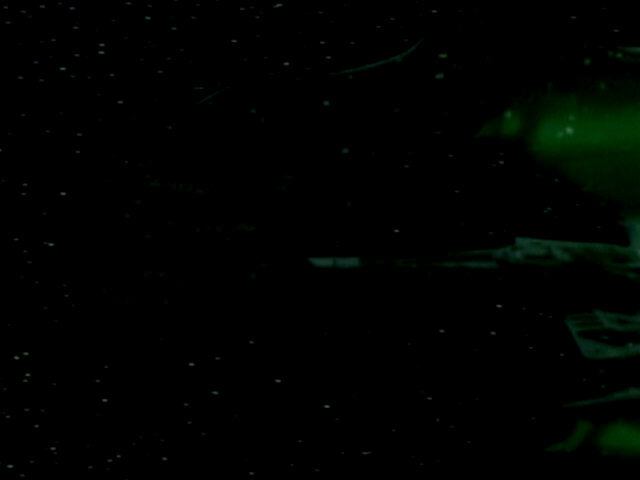 A shot from "Contagion" shows the first model of the Warbird filmed from a similar angle. 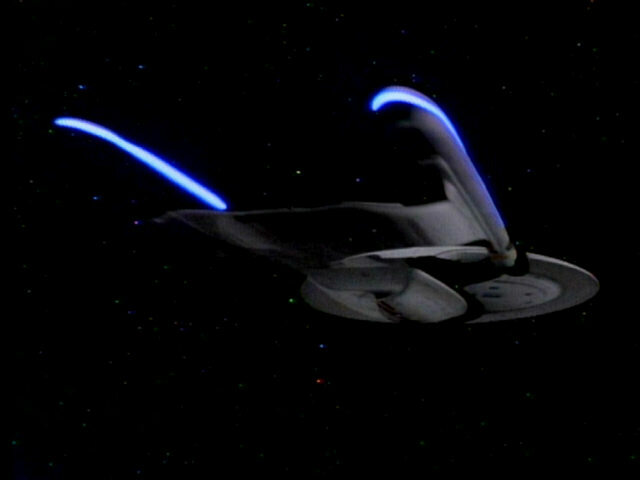 One way to tell the two models apart is the additional detailing on the side of the nacelles, only present on the second Warbird model, first seen in "The Defector". 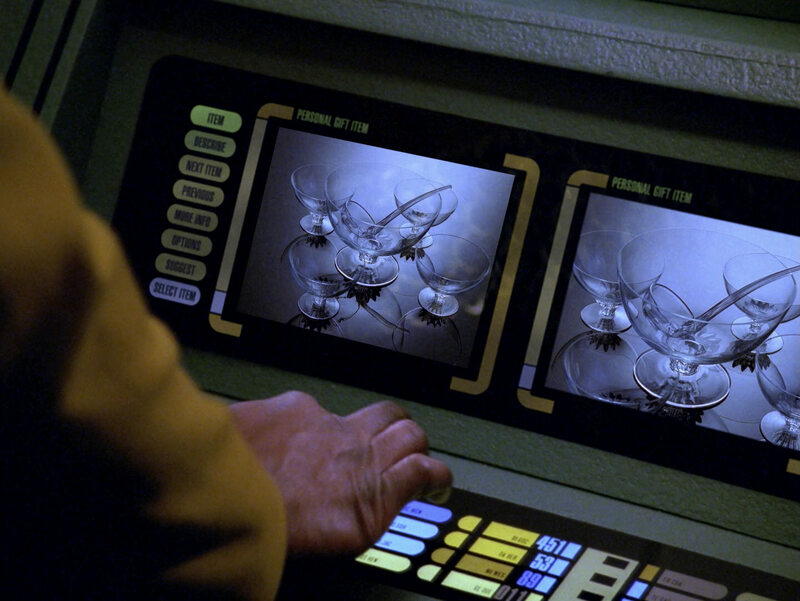 "Contagion" The sequence in HD. 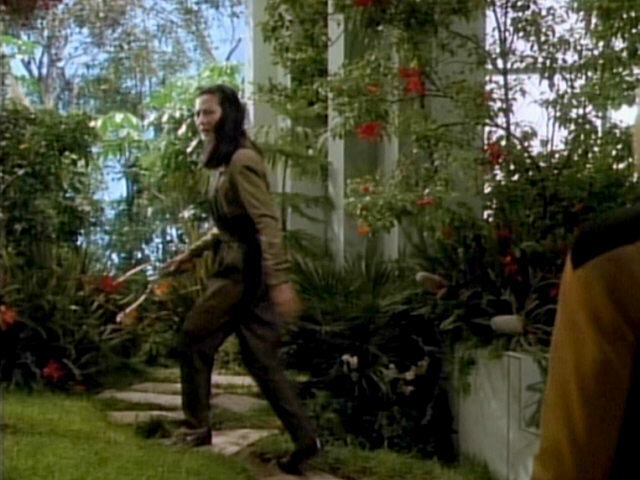 The arboretum is seen in two more screenshots, illustrating the appearance of the set in this episode. 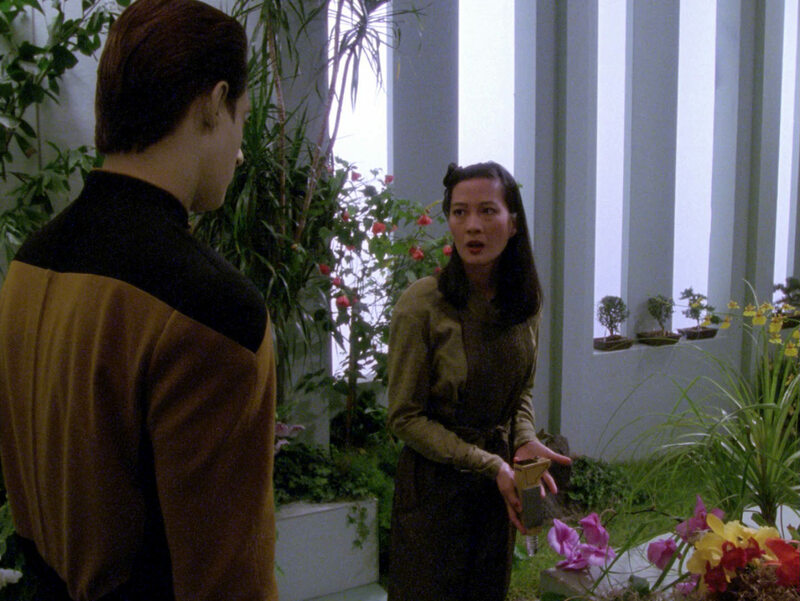 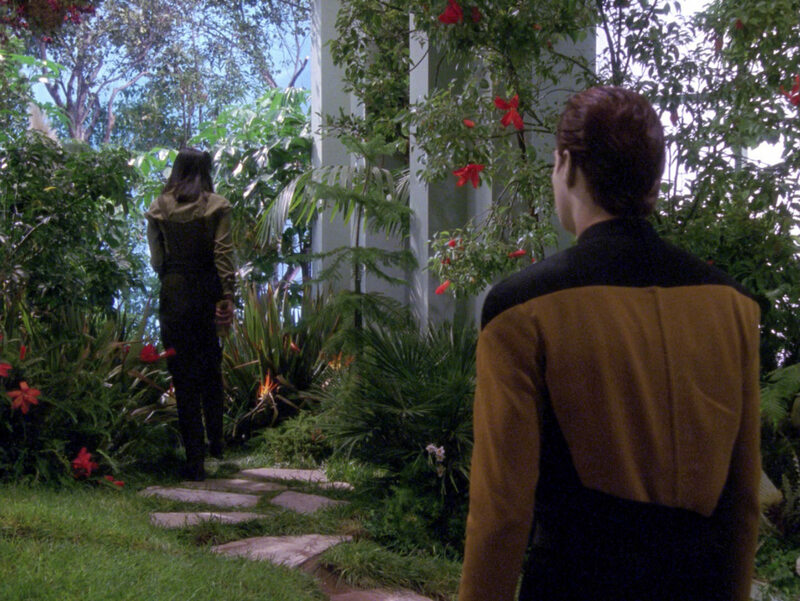 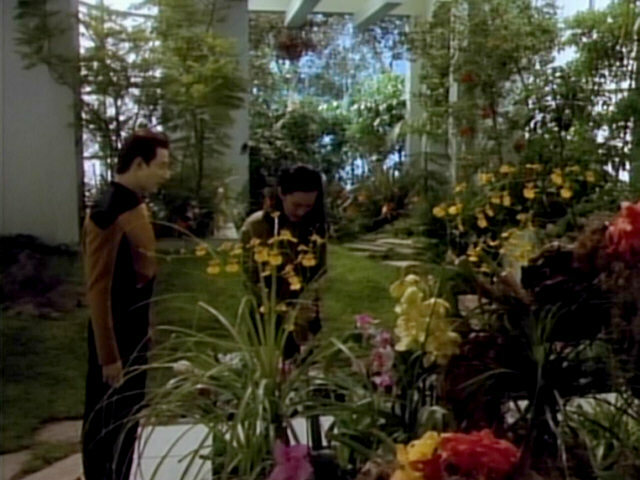 The arboretum as it appears in TNG-R. 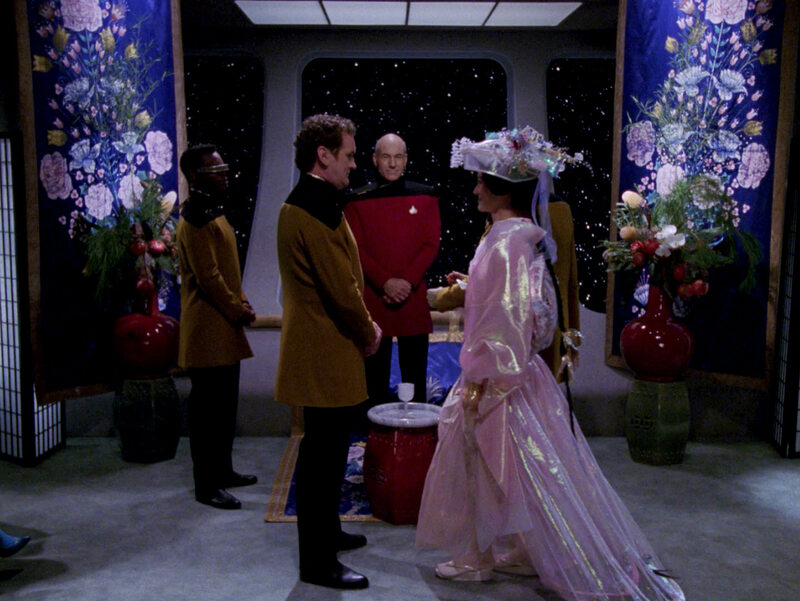 Ten Forward has been beautifully decorated for the O'Brien wedding. 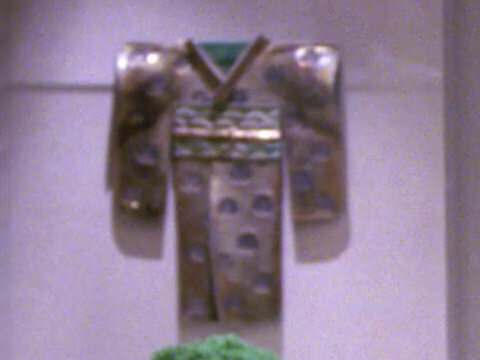 We can recognize the floral pattern of the decoration much better in HD. 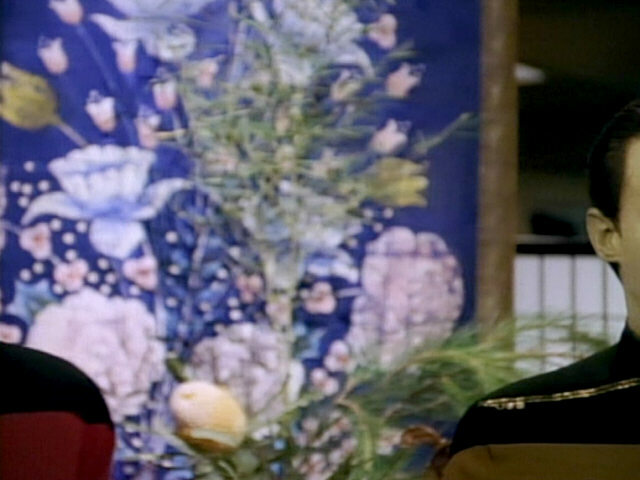 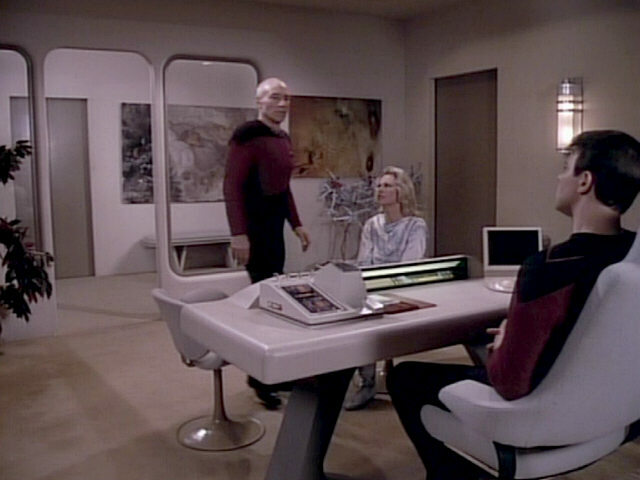 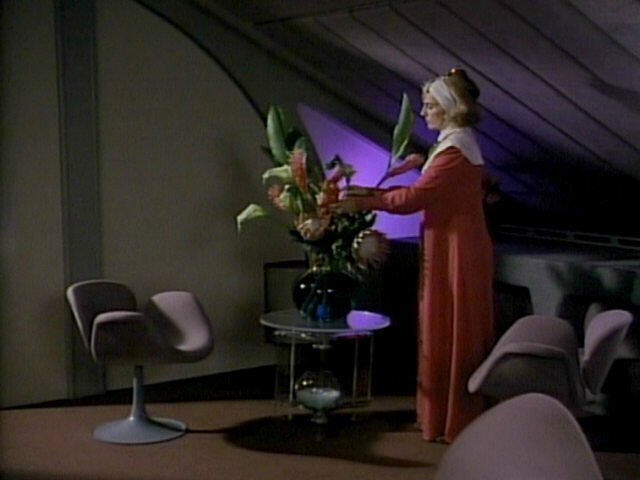 A good look at the floral tapestry seen in Ten Forward in this episode. 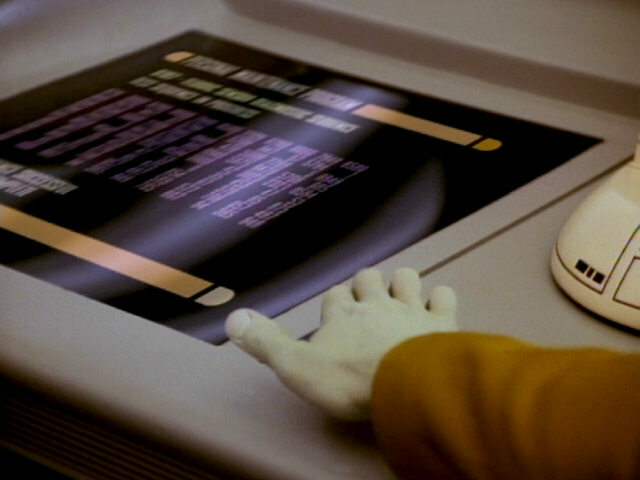 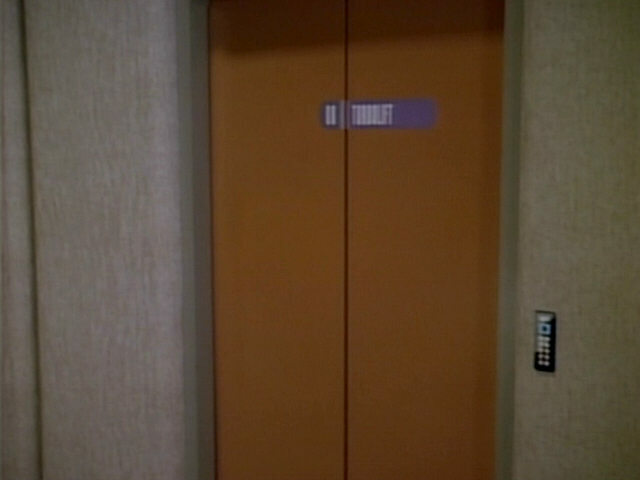 Wiping transitions like this one are rarely used on Star Trek. 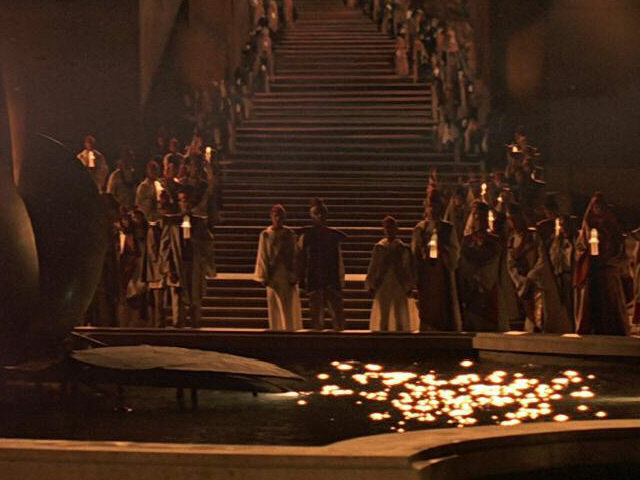 They are much more well known for being used countless times in the six Star Wars films. 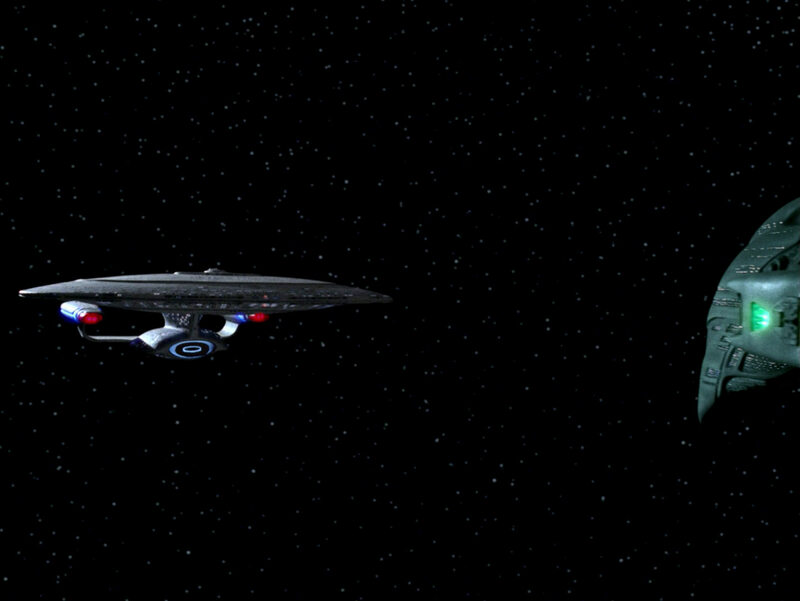 The transition was improved slightly in the remastered version of the episode. 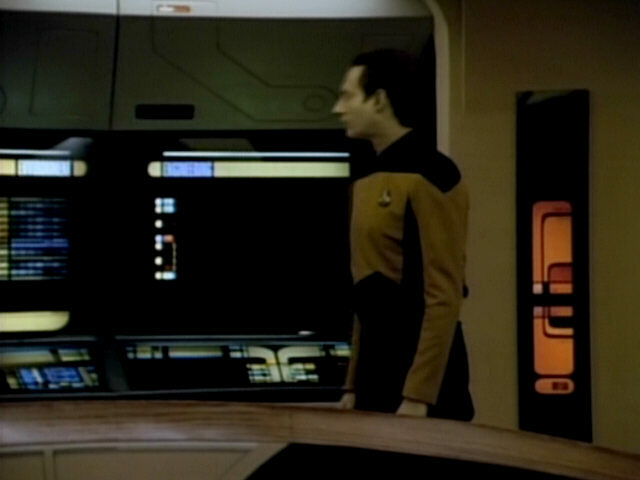 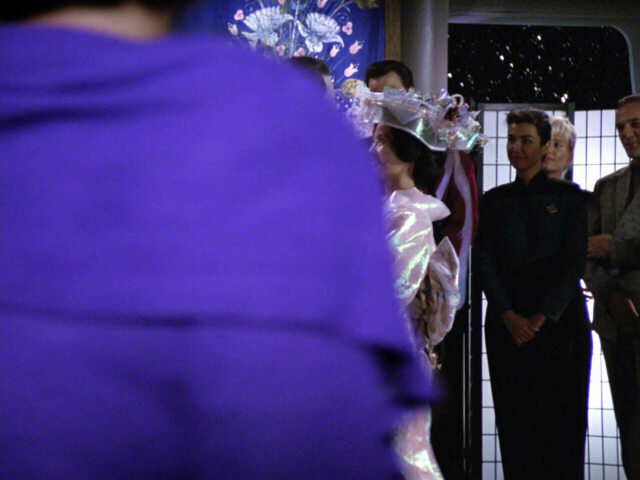 The new footage of the people watching Data and Guinan dance in the right half of the screen is present as soon as the woman in the foreground passes the camera. 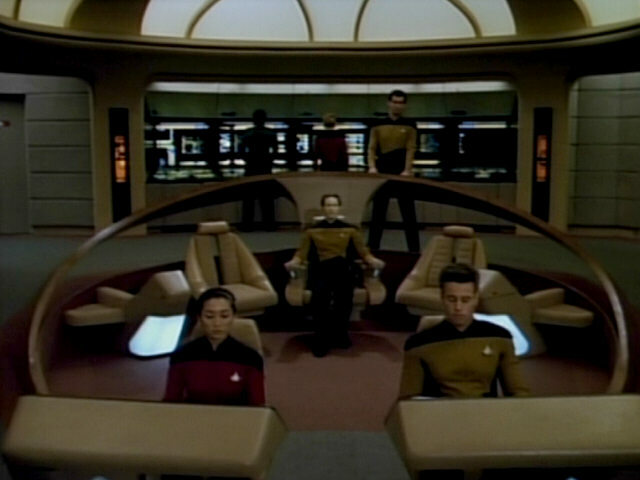 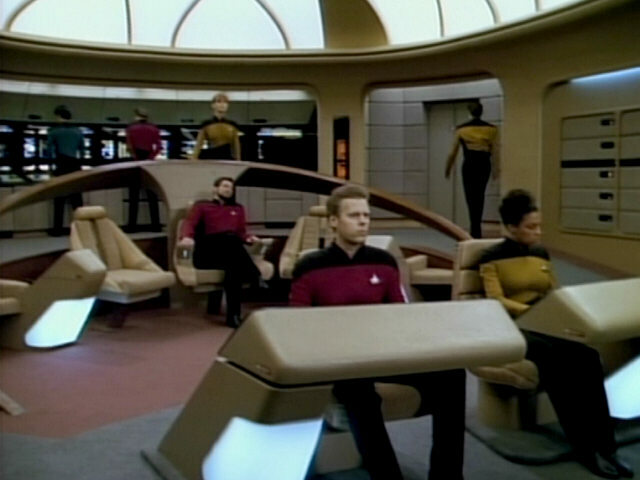 In the original version the footage of Miles O'Brien fades into the new shot of the watching crew members. 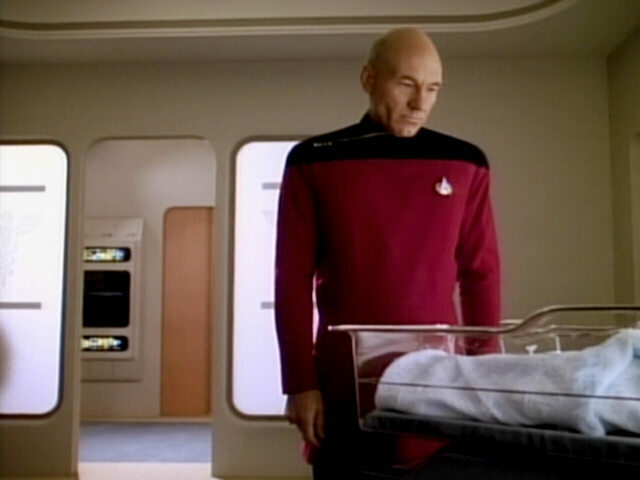 The nursery is a redress of Doctor Crusher's sickbay office. 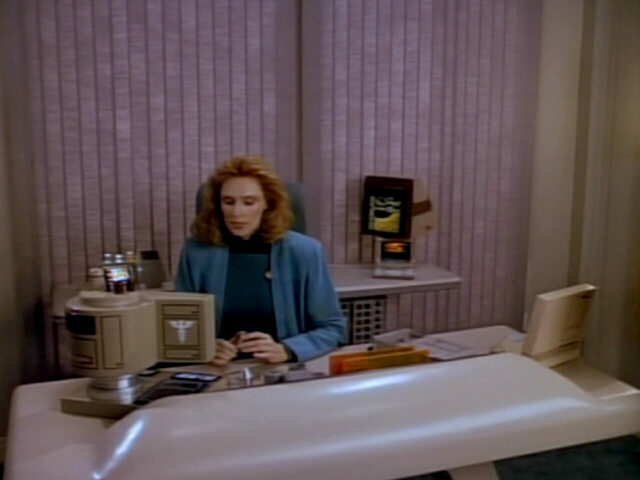 For this re-use, the two windows were made opaque and Doctor Crusher's desk was removed. 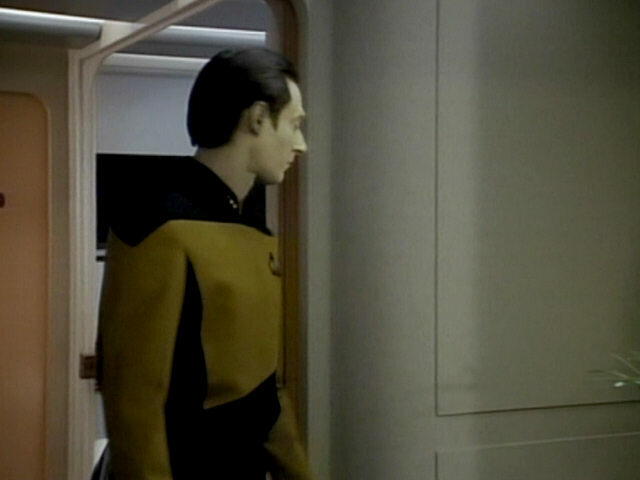 A nurse is seen leaving through the door seen on the right (also in the comparison screenshot from "We'll Always Have Paris", making this one of the rare cases this door is used).